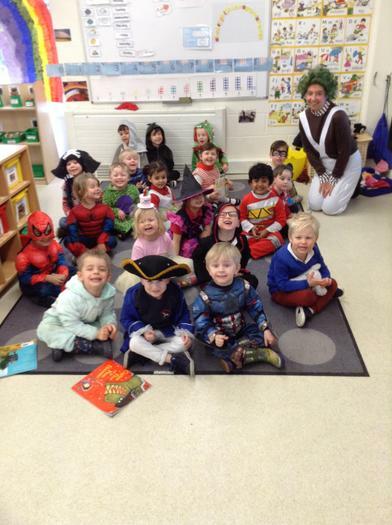 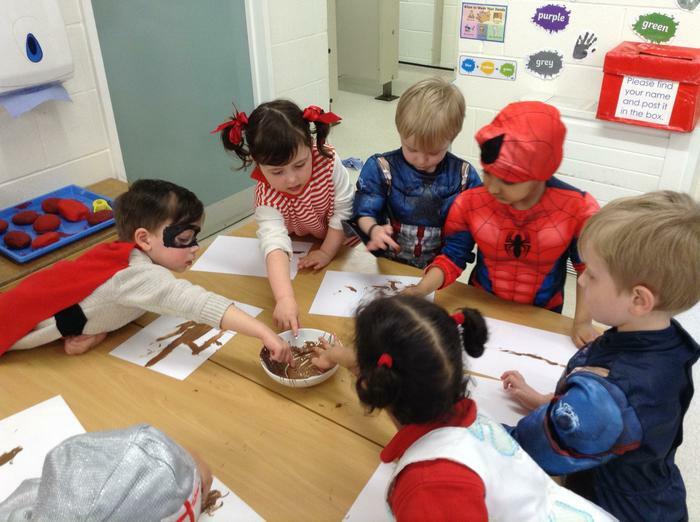 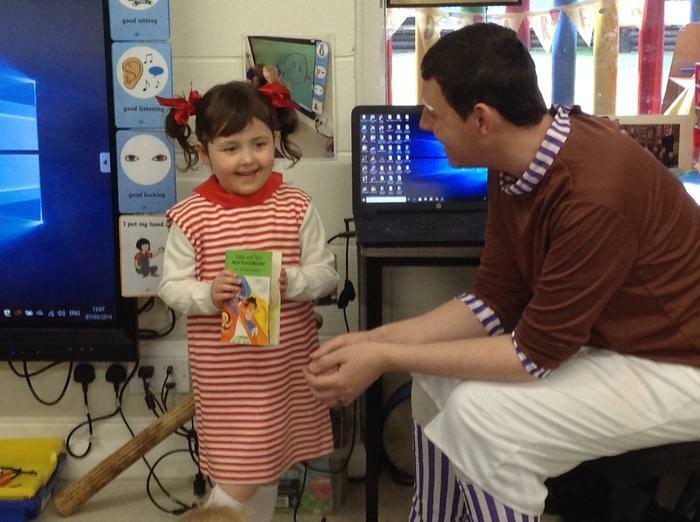 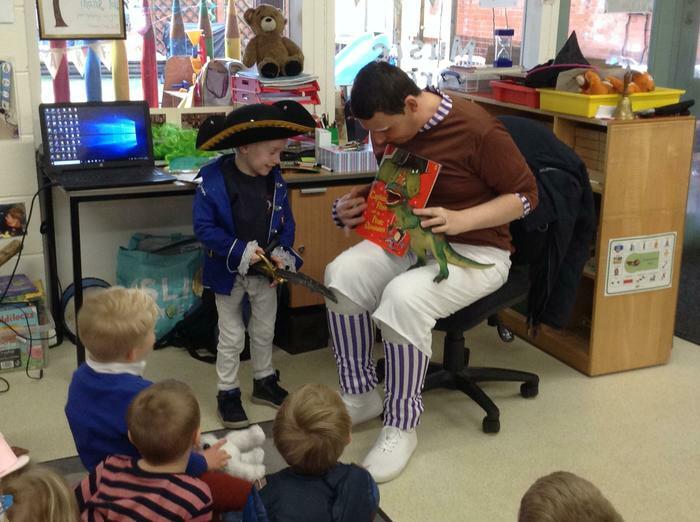 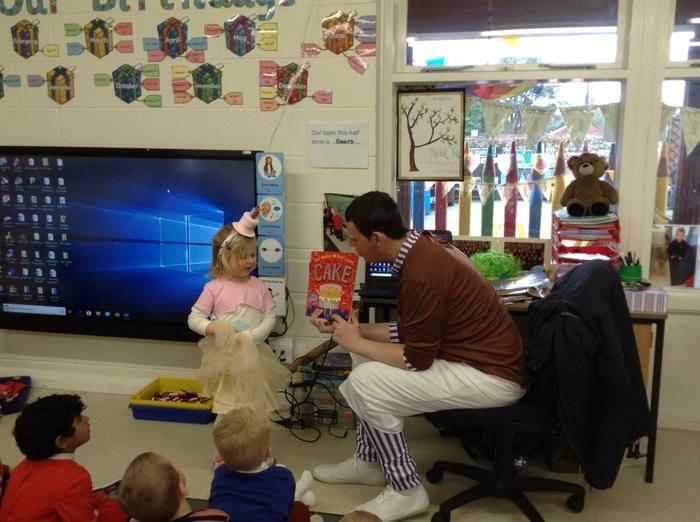 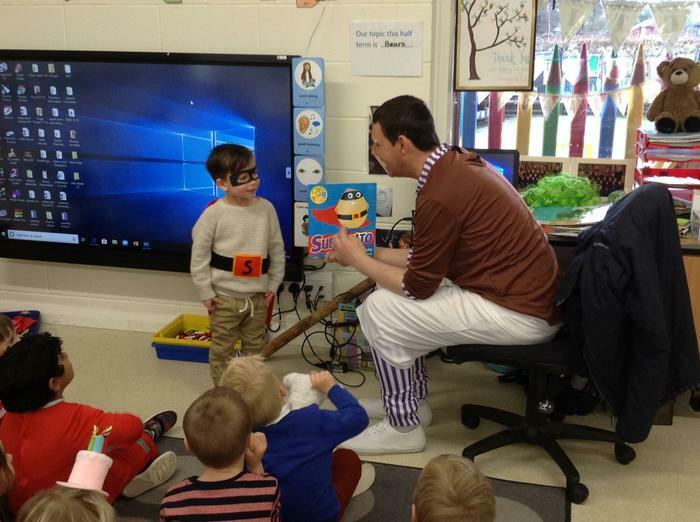 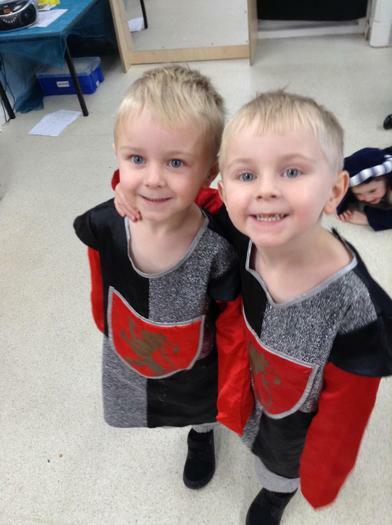 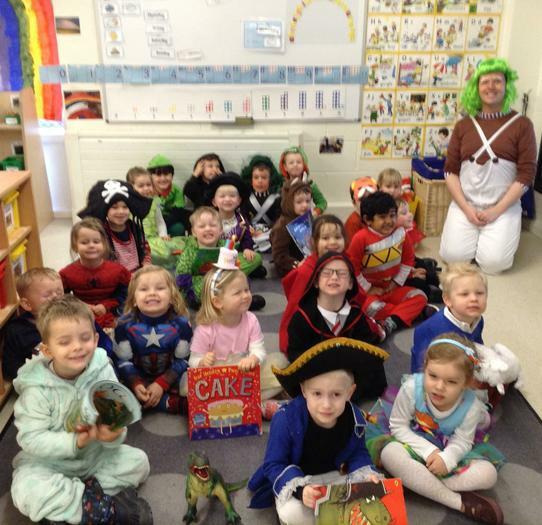 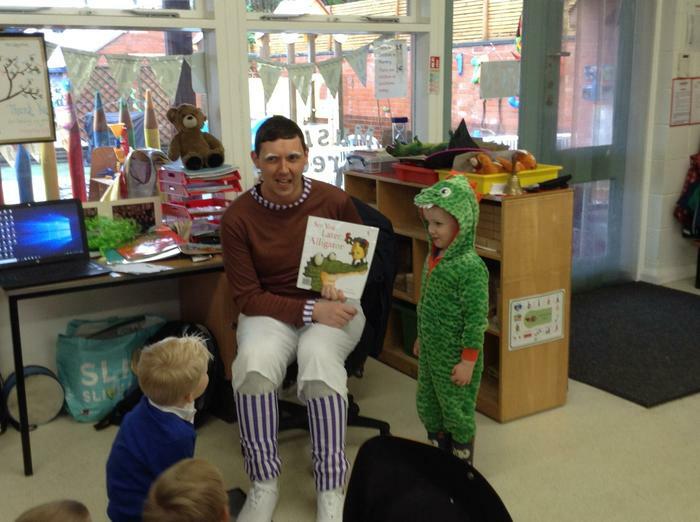 We celebrated World Book Day with our friends and siblings in school. 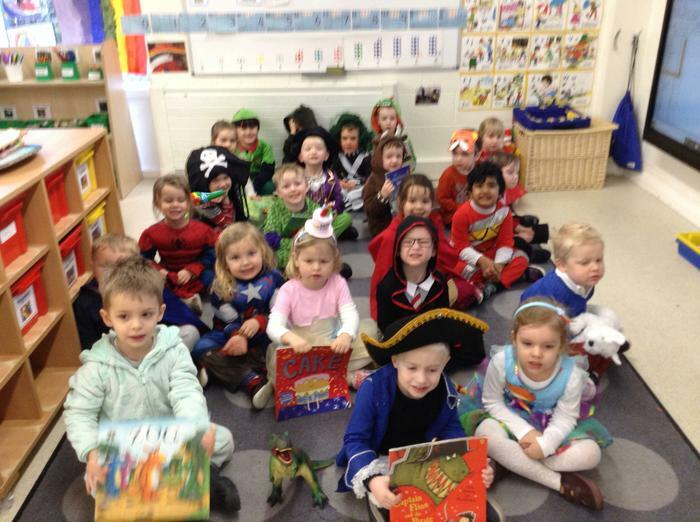 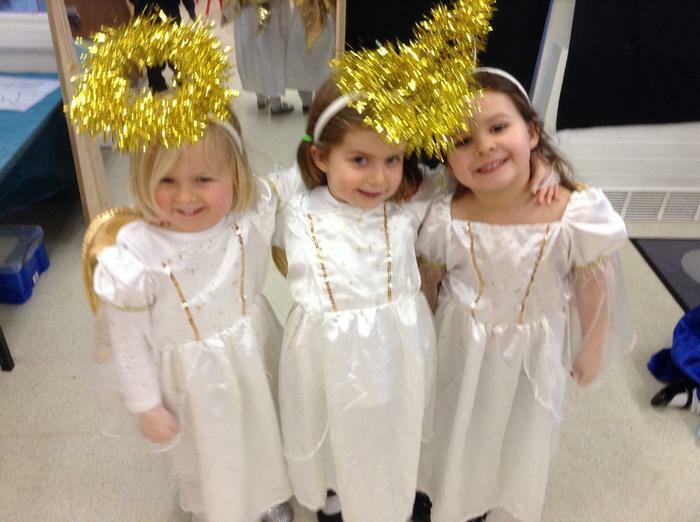 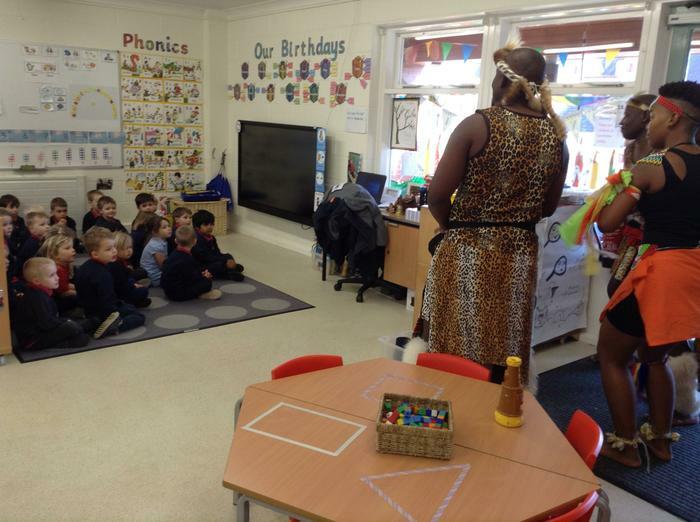 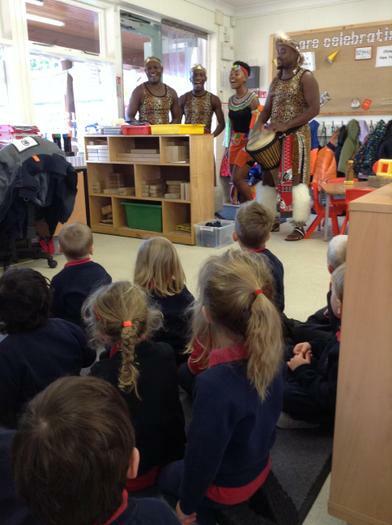 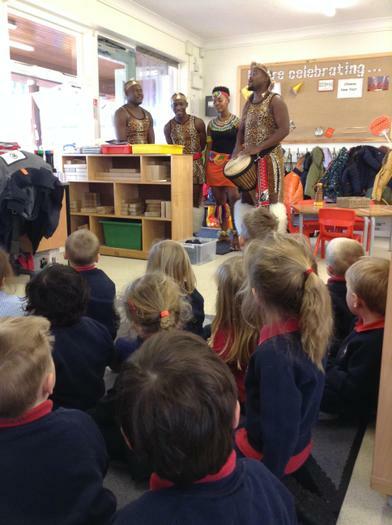 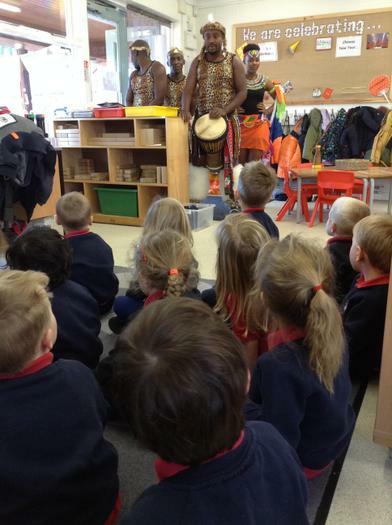 In the Morning, we paraded our costumes in the Junior school and talked about our favourite stories. 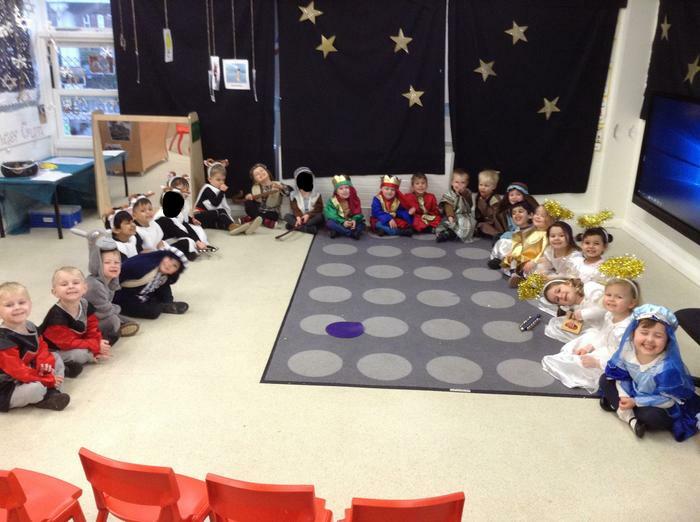 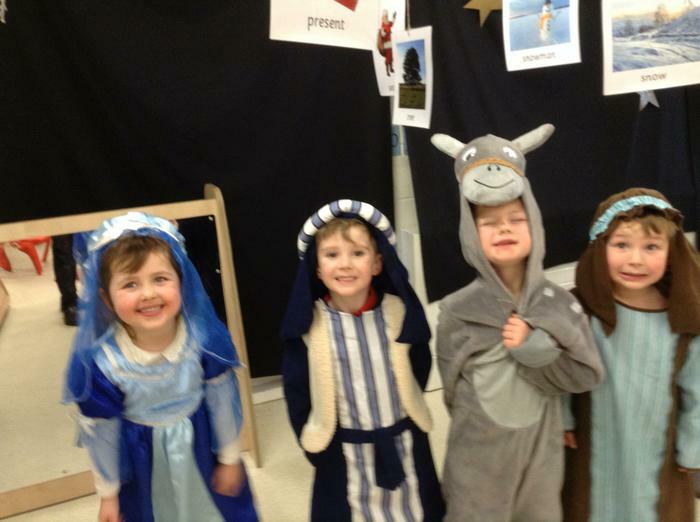 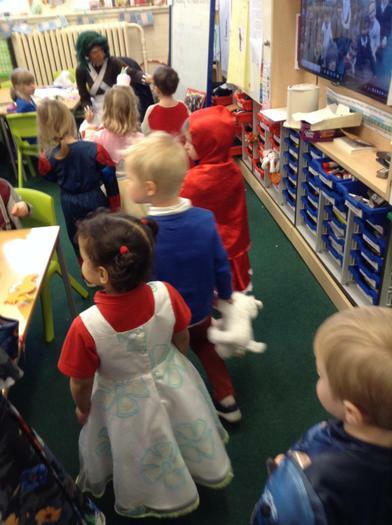 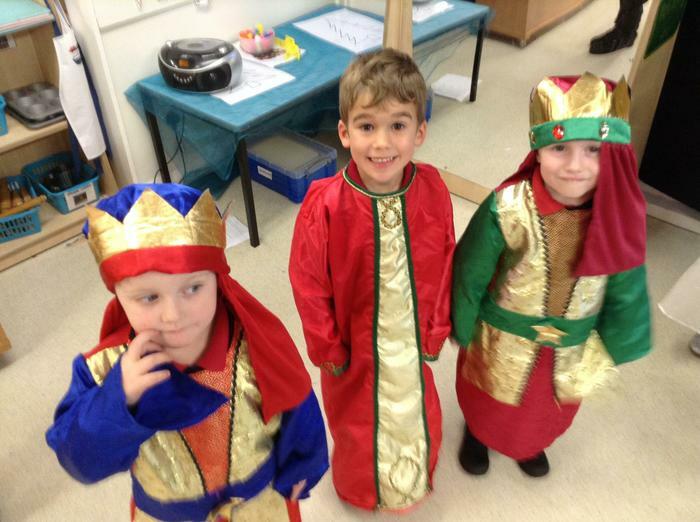 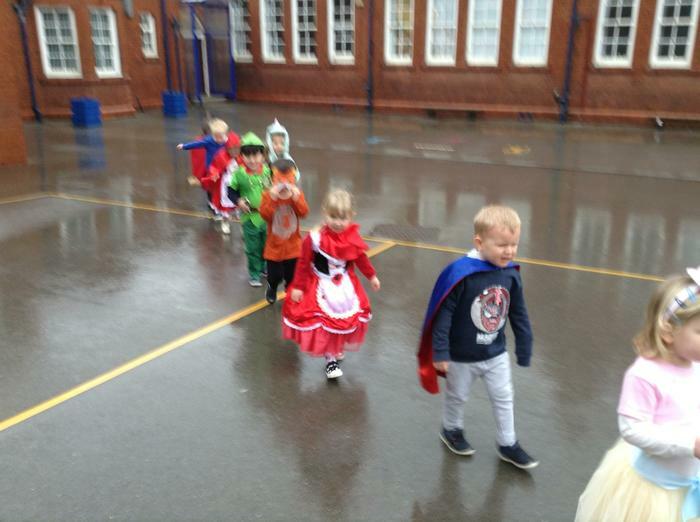 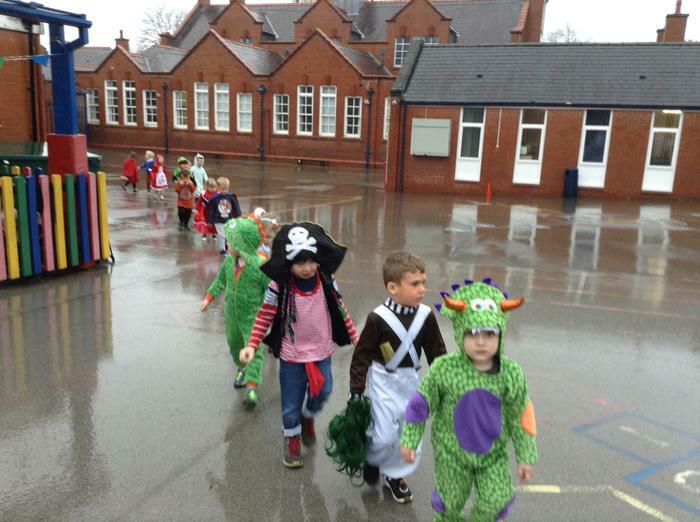 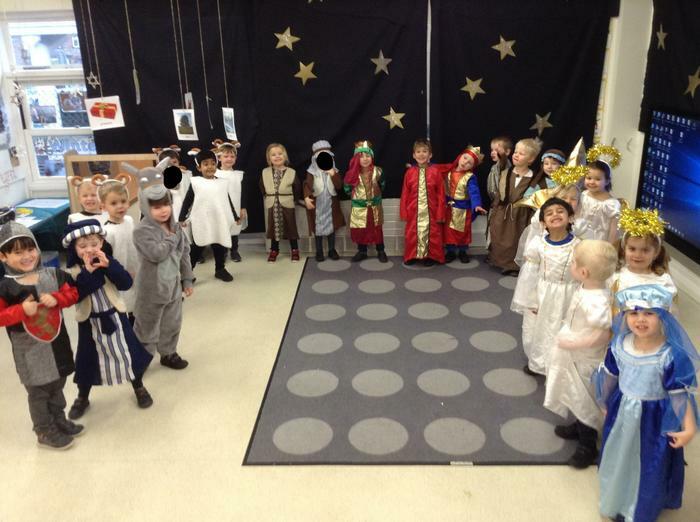 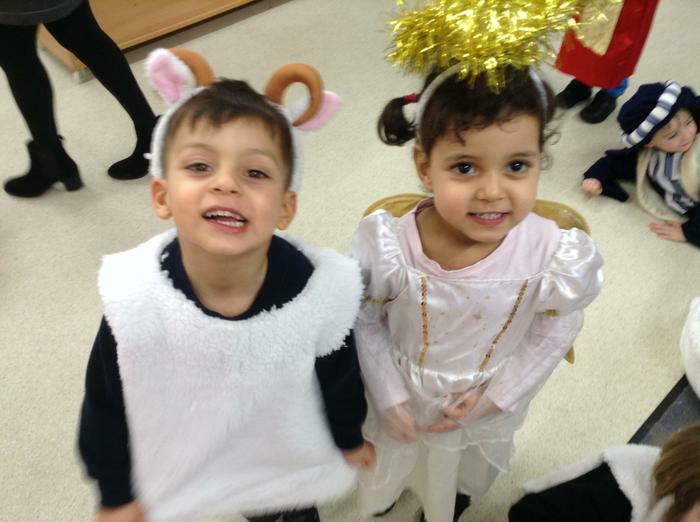 In the Afternoon, we paraded our characters for the Reception children and Elm class. 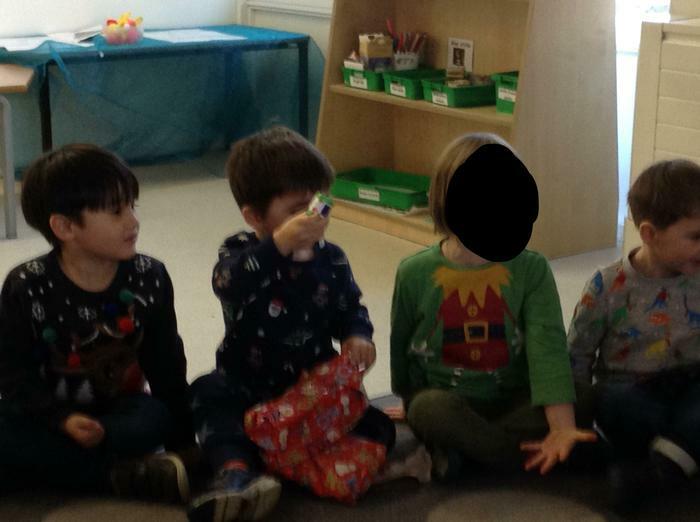 Mr Willy Wonka kindly gave us some chocolate. 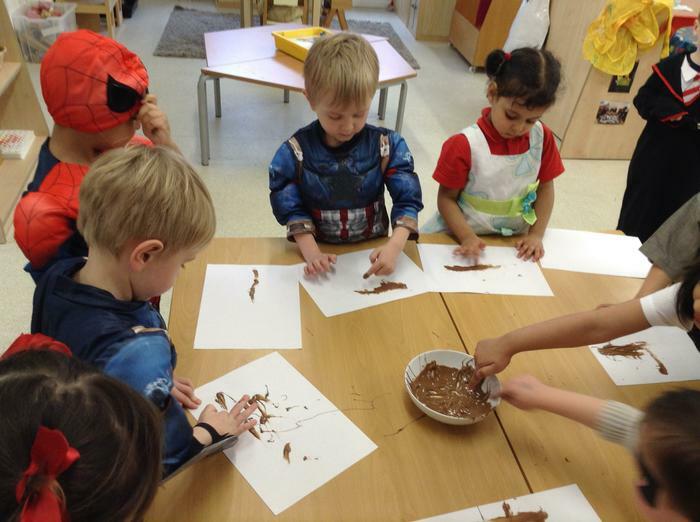 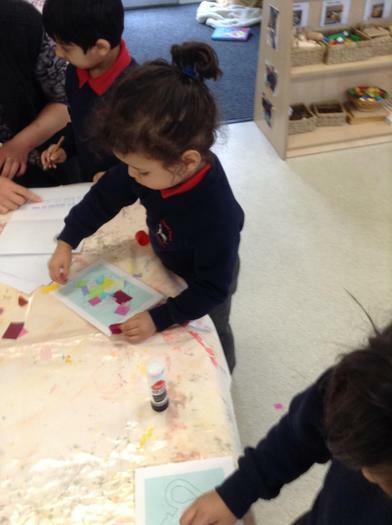 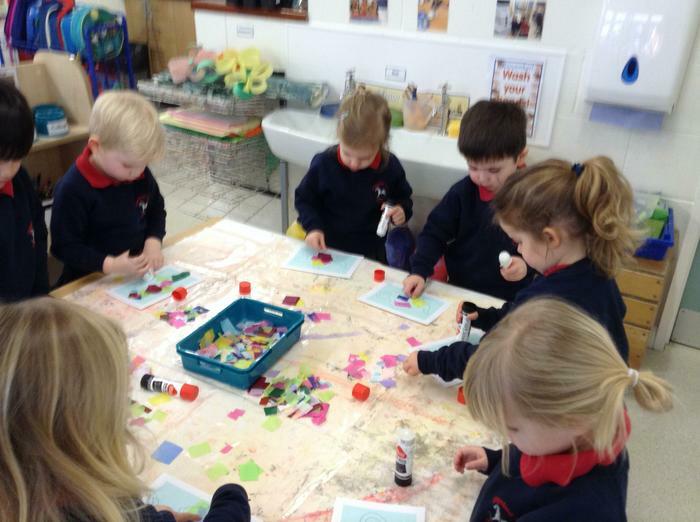 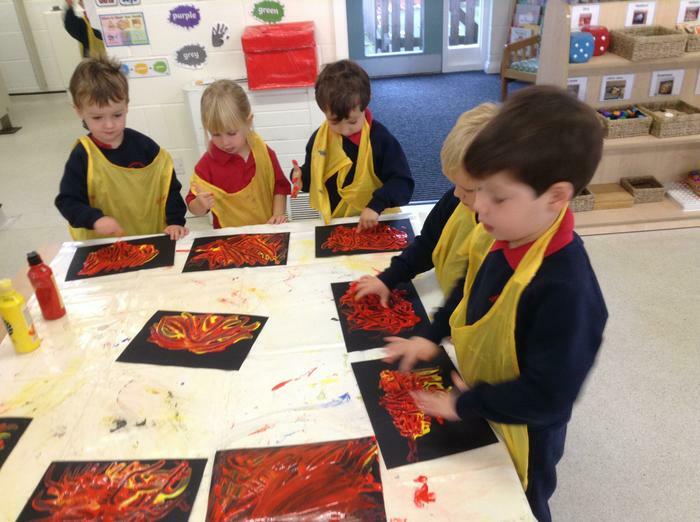 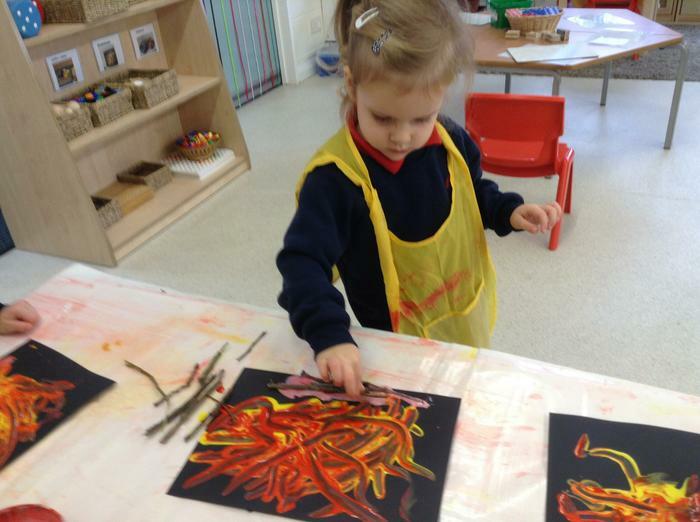 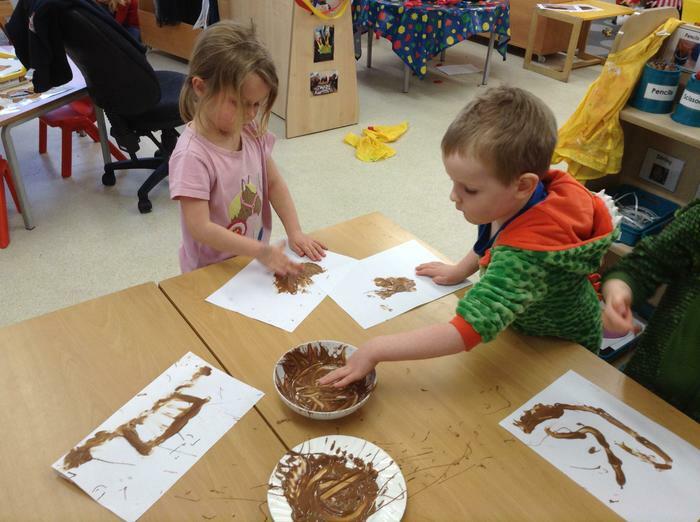 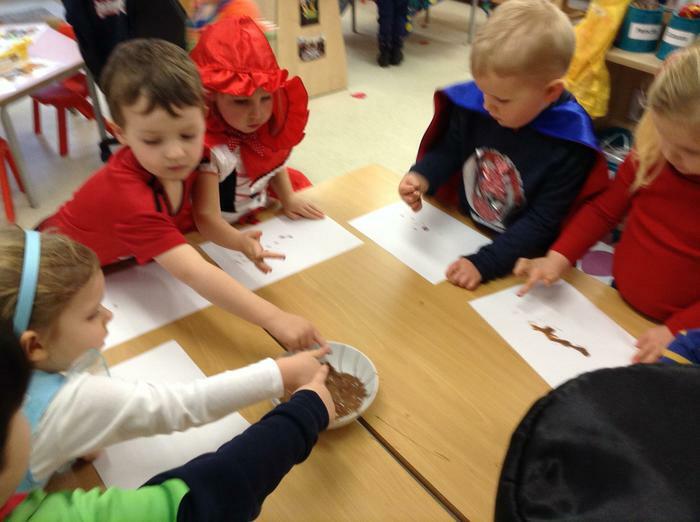 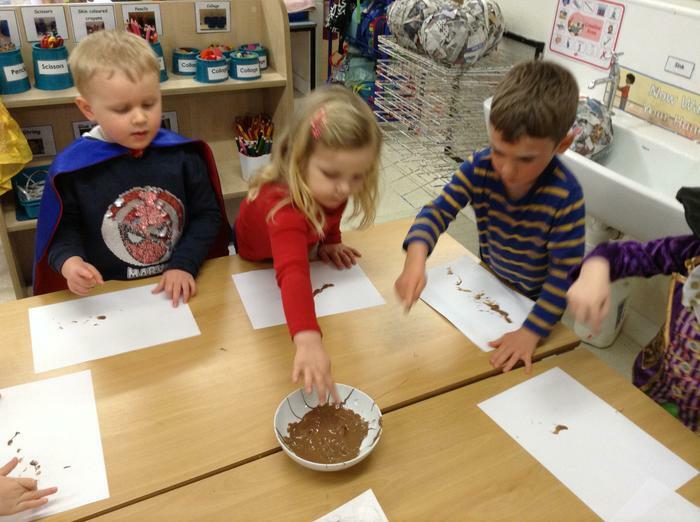 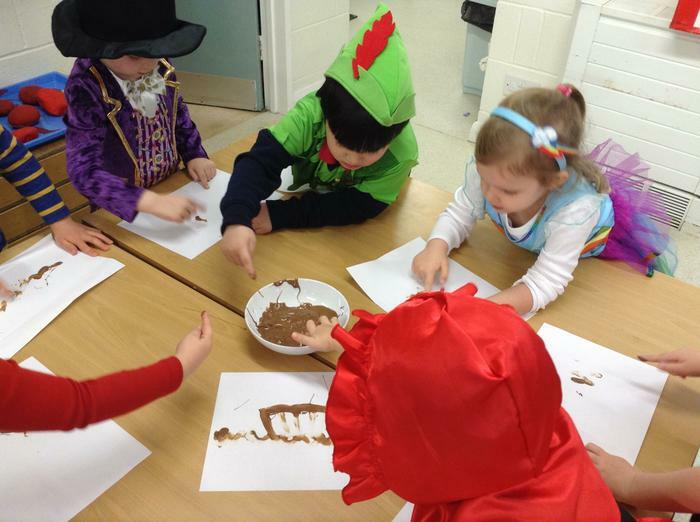 We made some chocolate paintings by melting our chocolate and dipping our fingers in to create our pictures. 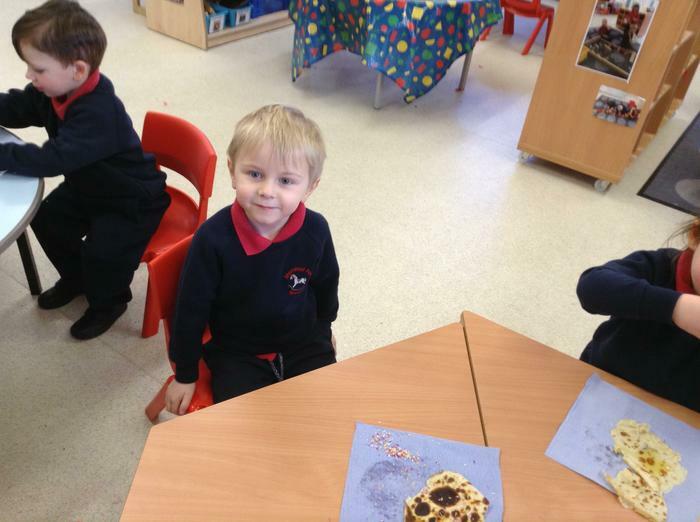 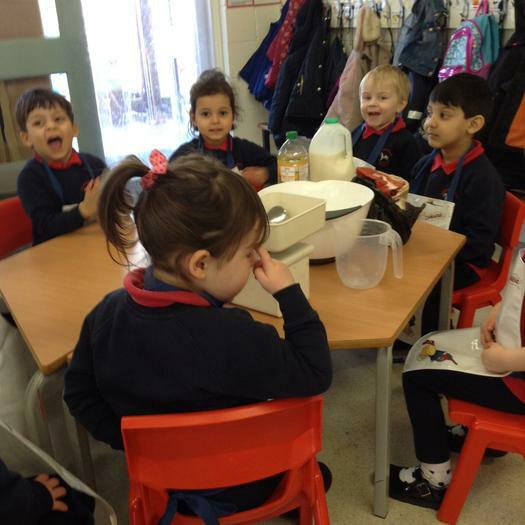 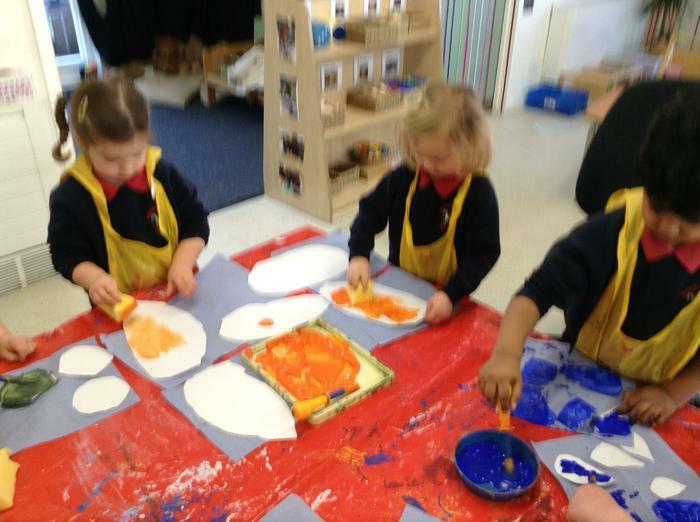 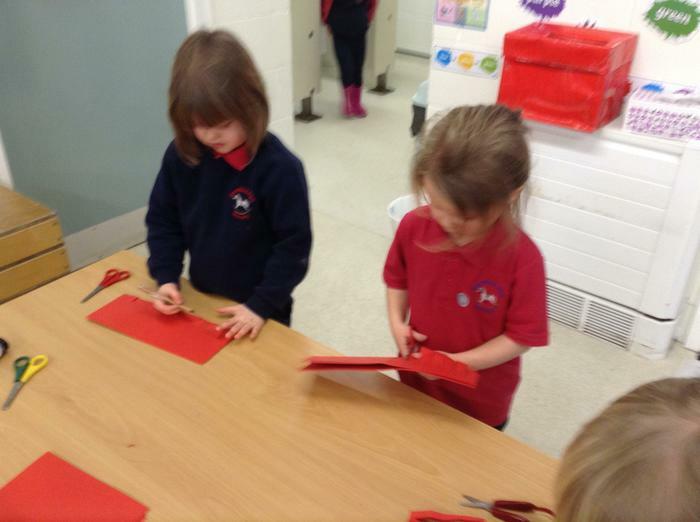 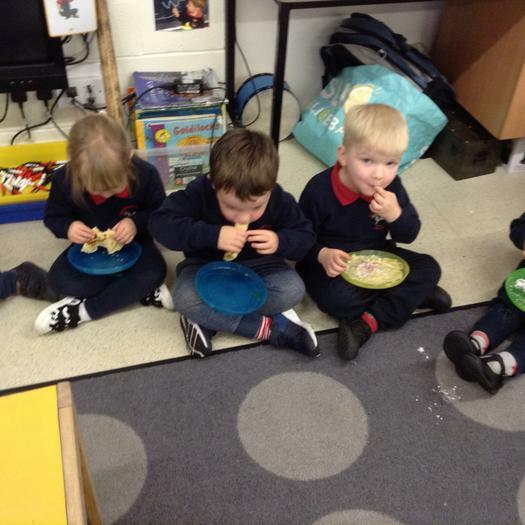 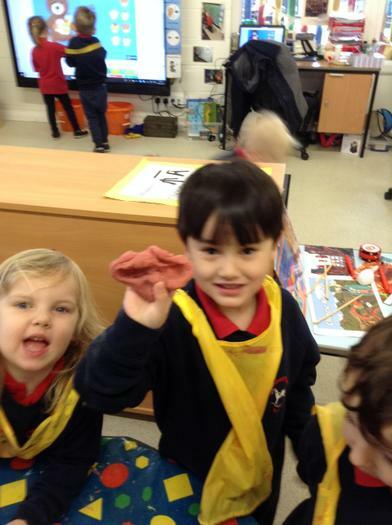 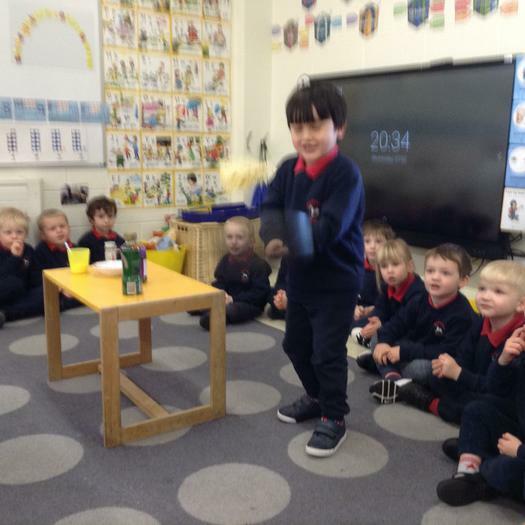 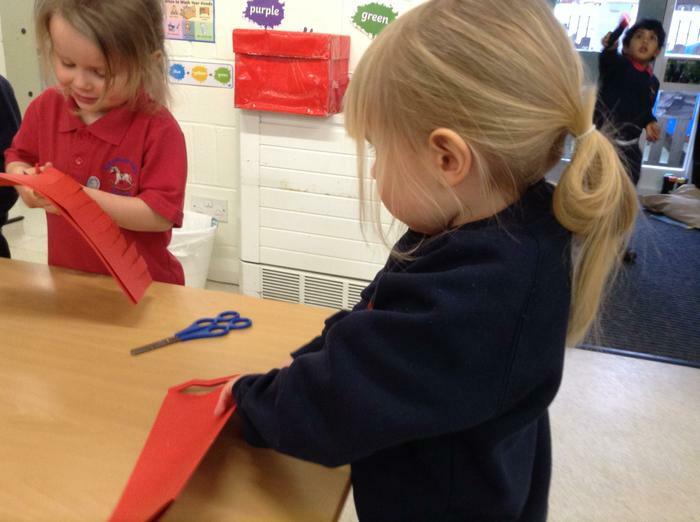 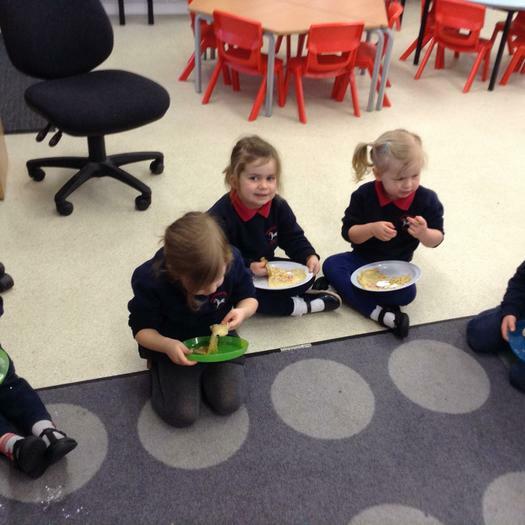 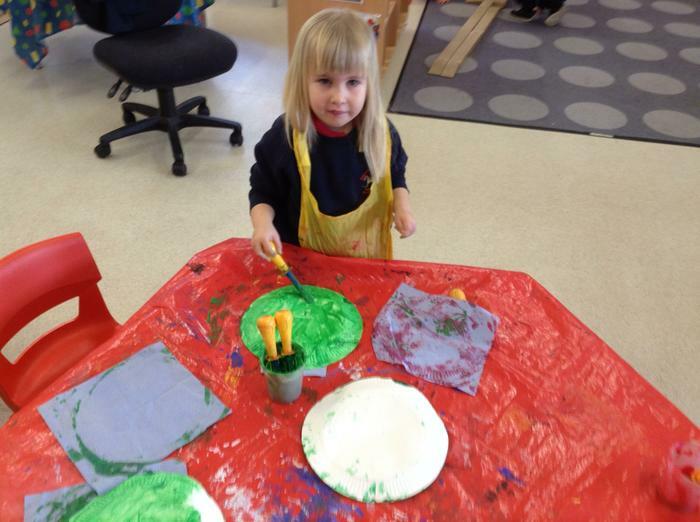 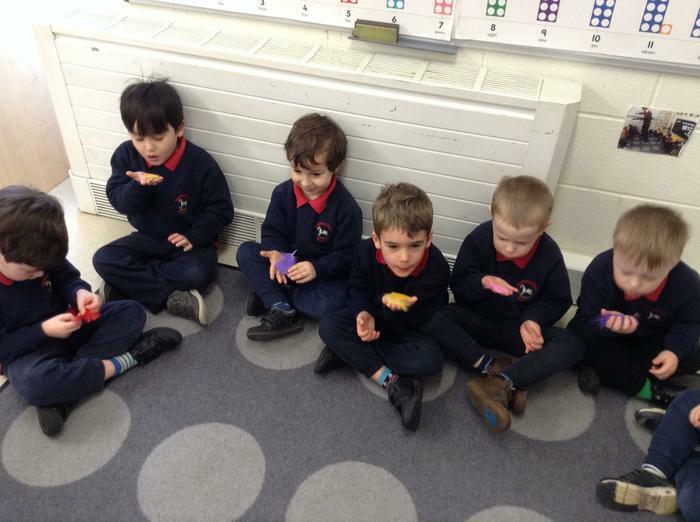 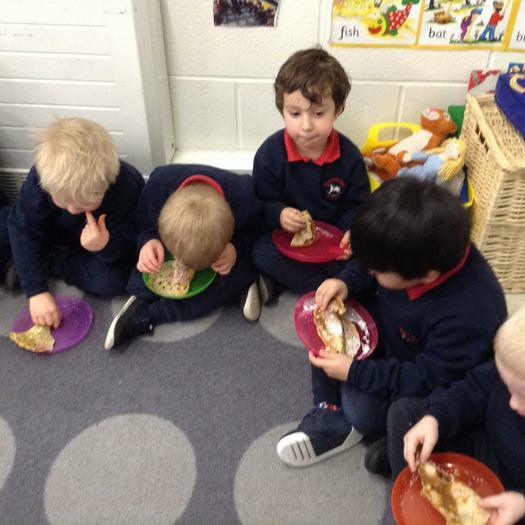 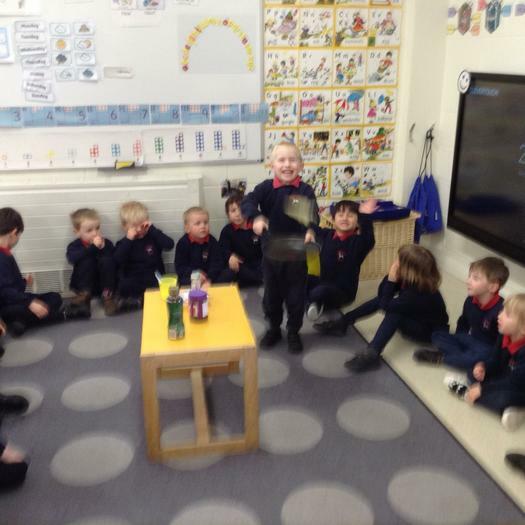 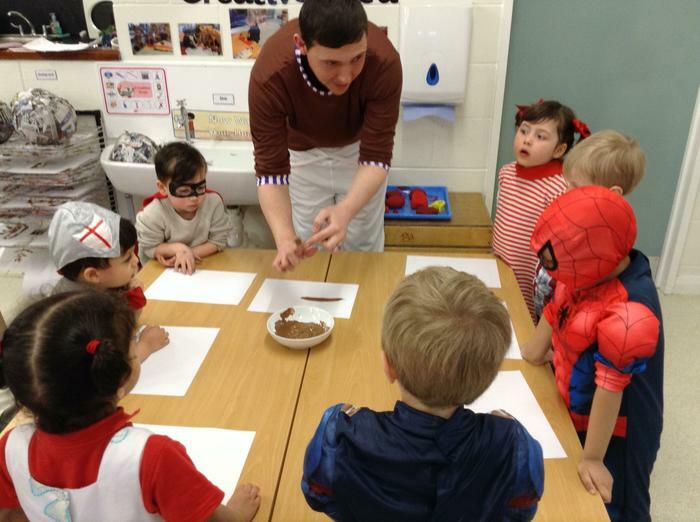 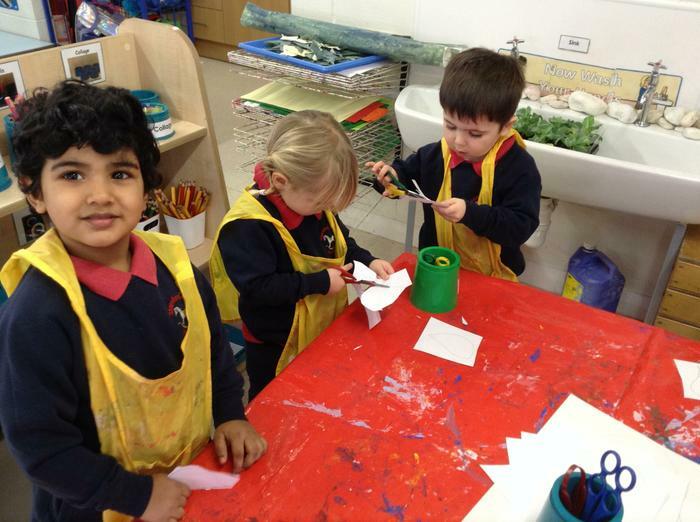 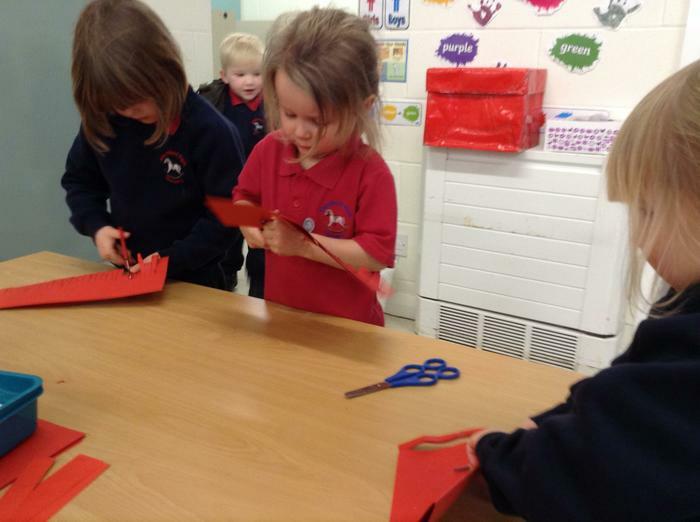 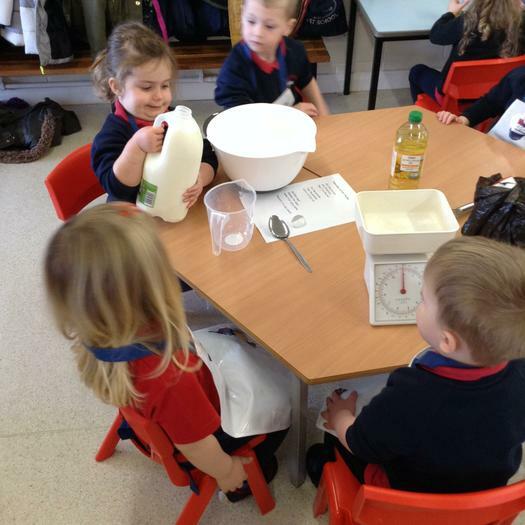 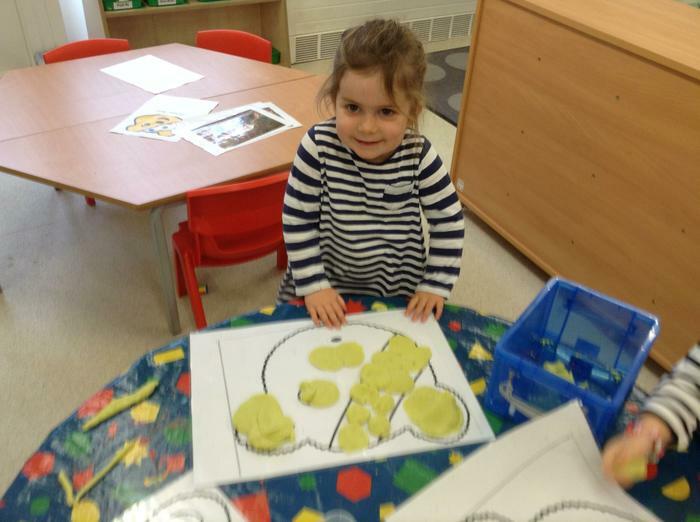 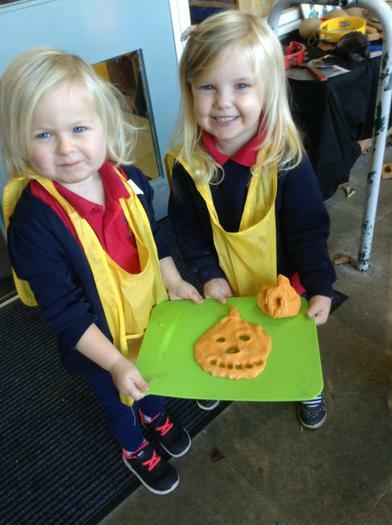 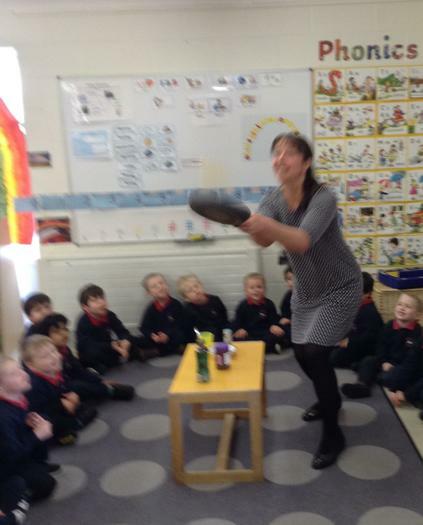 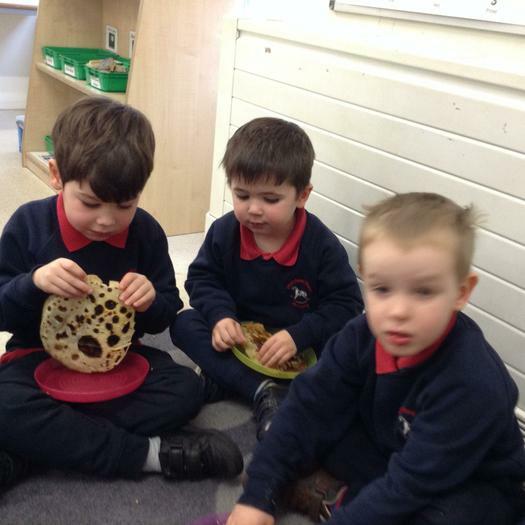 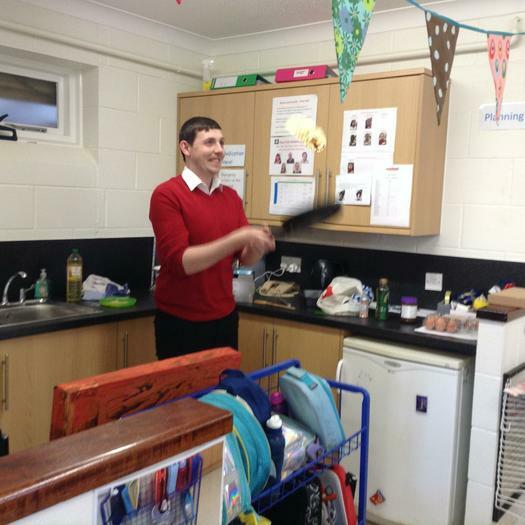 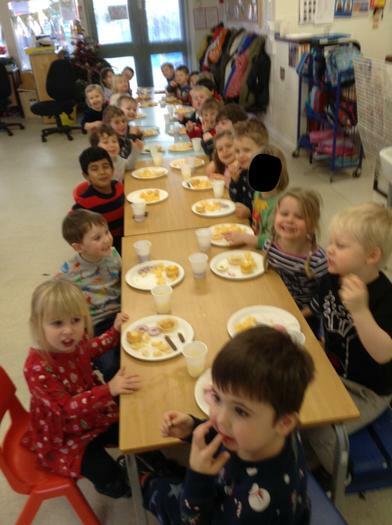 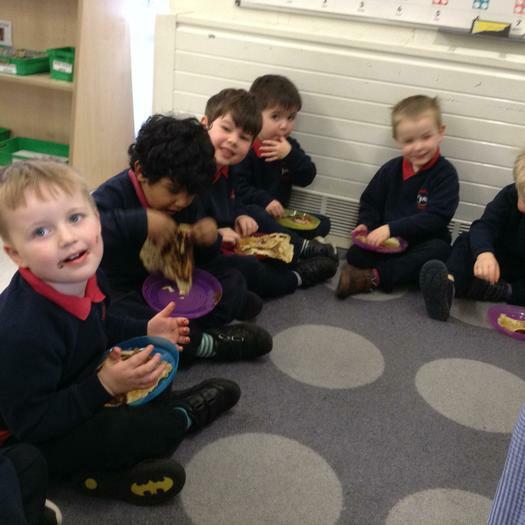 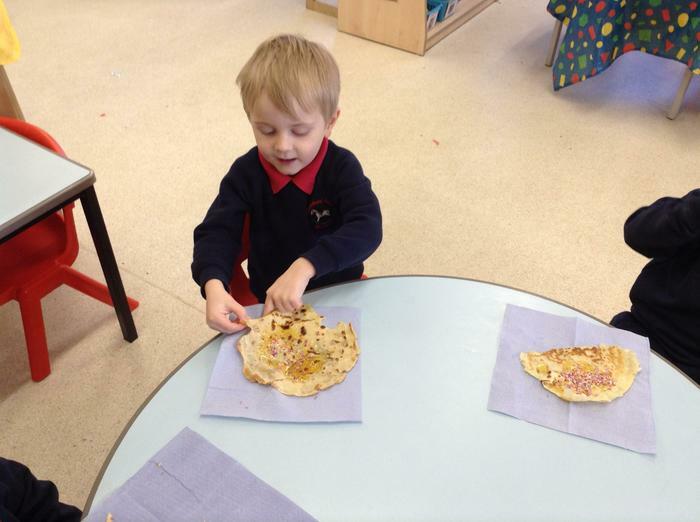 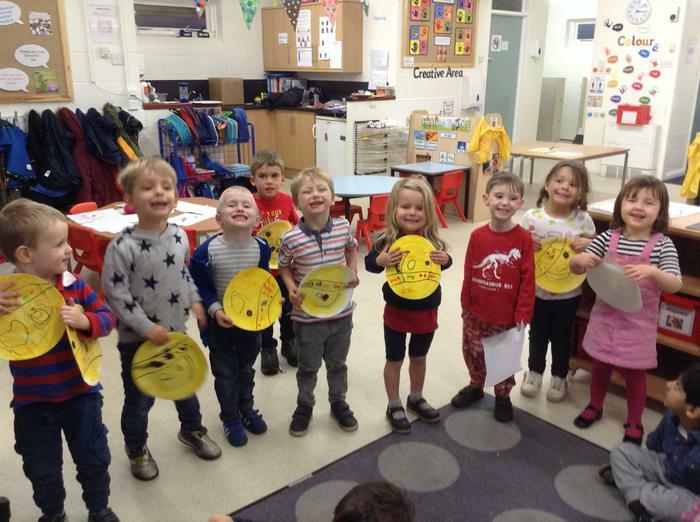 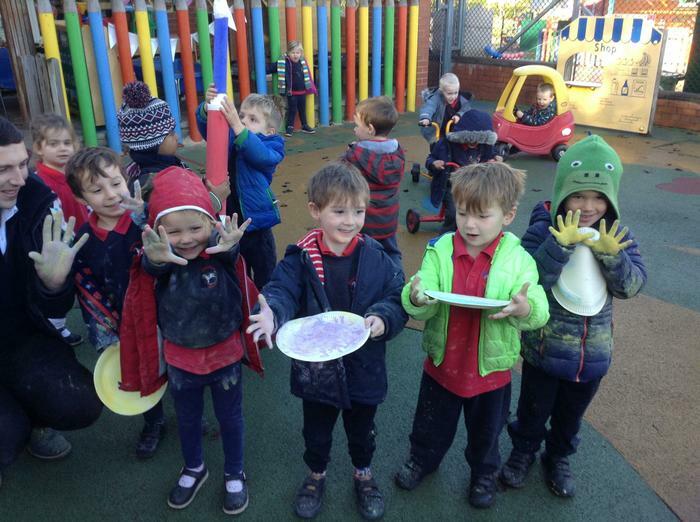 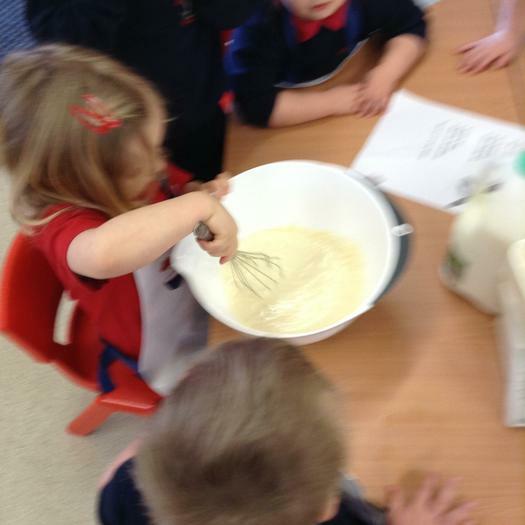 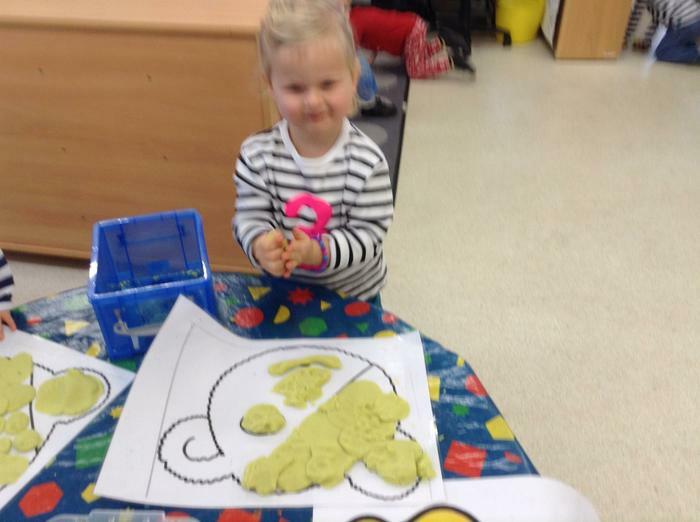 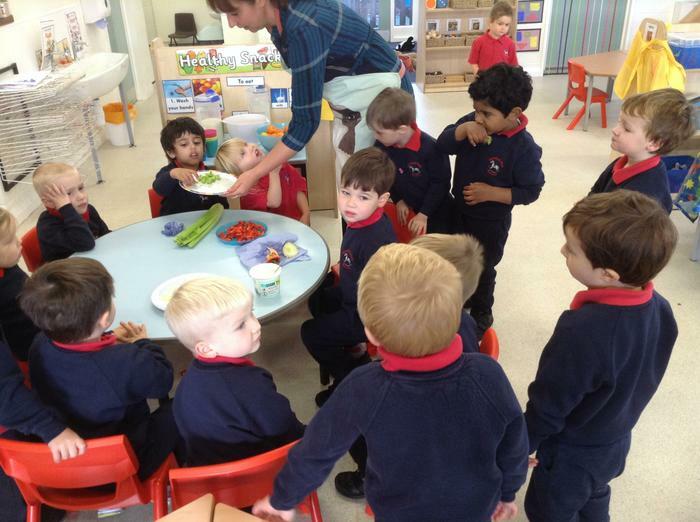 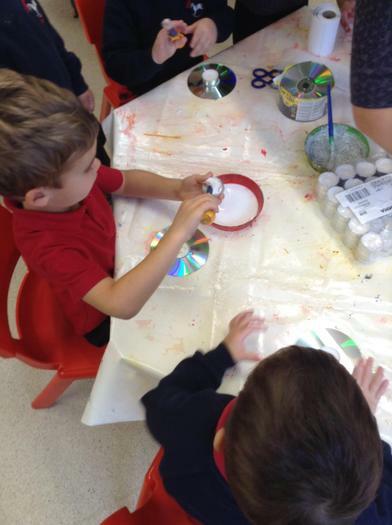 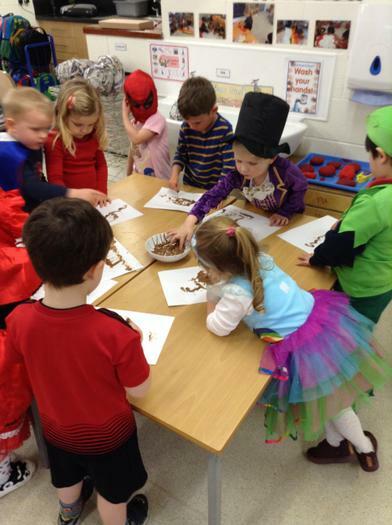 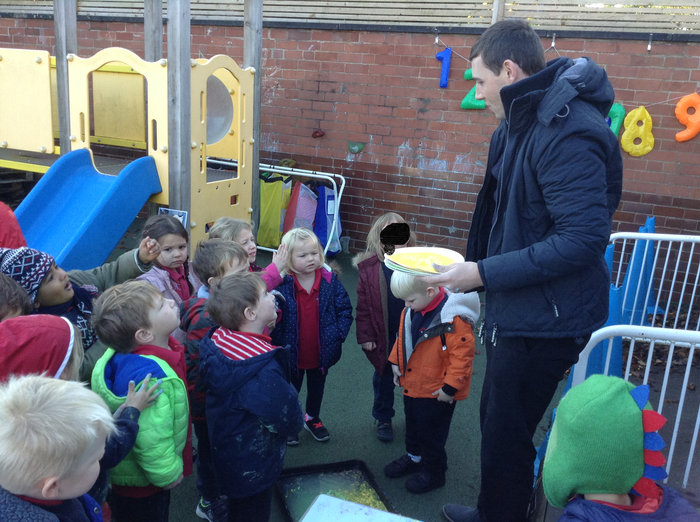 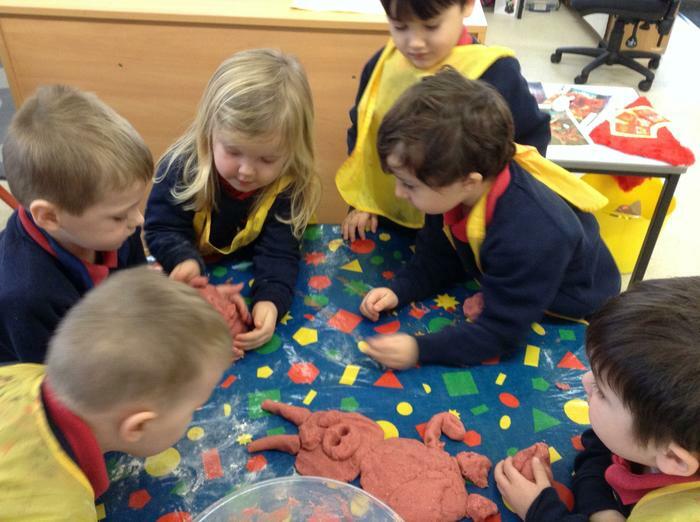 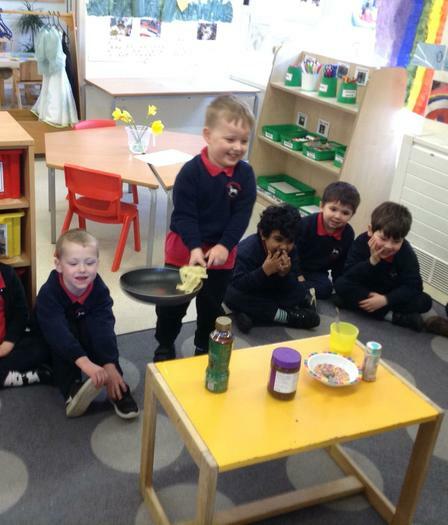 We celebrated Shrove Tuesday by making our own pancakes in Nursery. 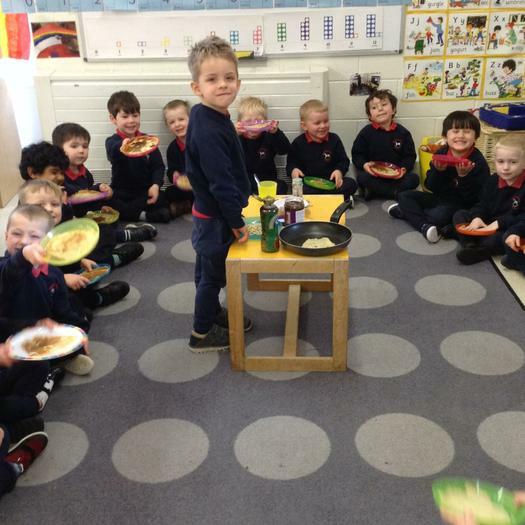 When our pancakes were fried, we waited for them to cool down before having a turn at flipping them. 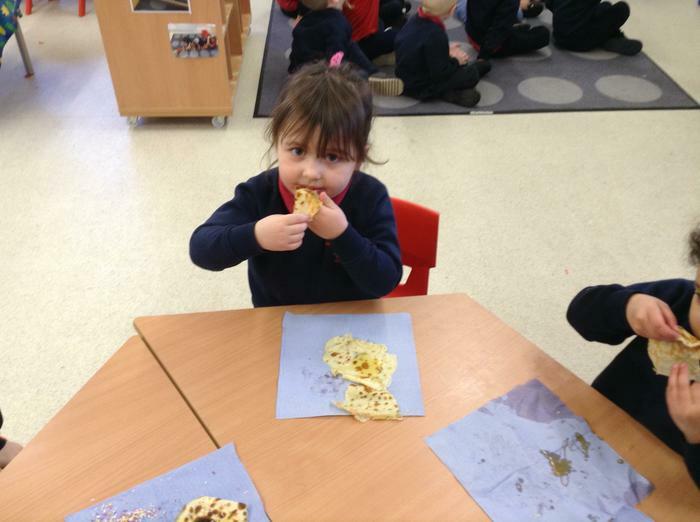 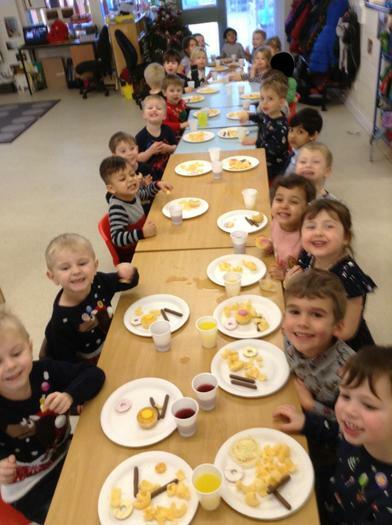 Our favourite part was eating the pancakes with some of our favourite toppings. 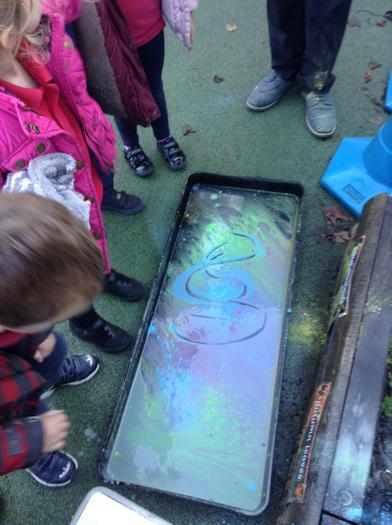 We saw a rainbow outside recently, so we discussed where it may have come from. 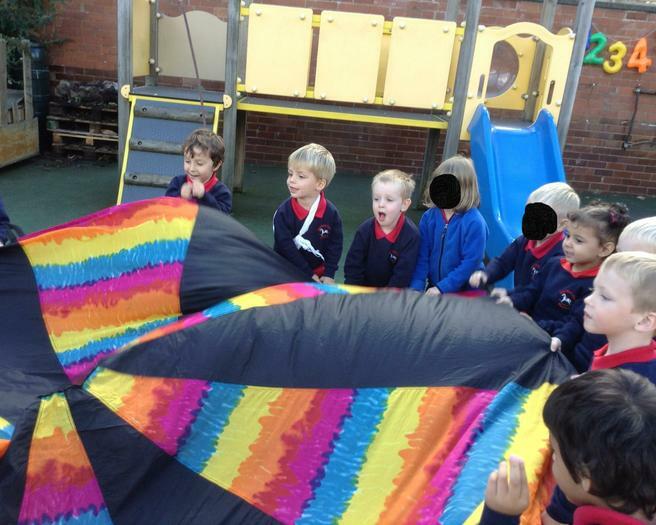 We watched a short video of some rainbows and found out that it takes rain and sunshine to make a rainbow. 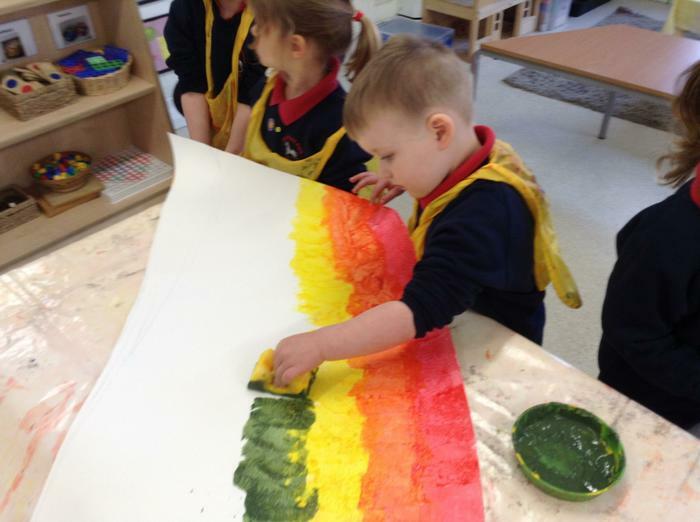 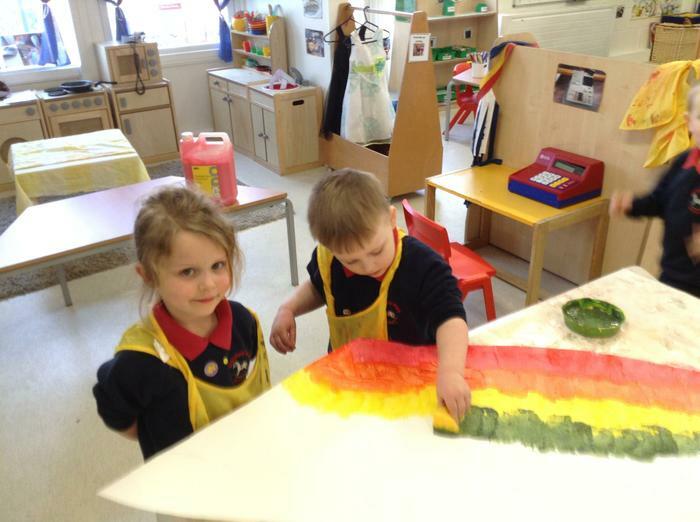 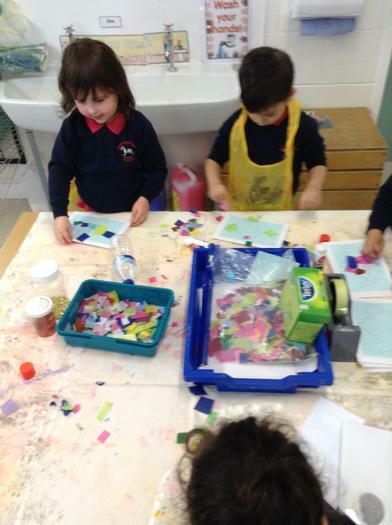 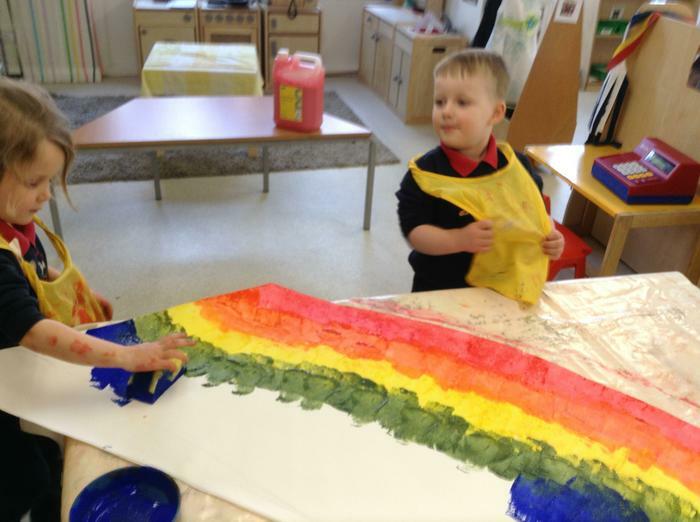 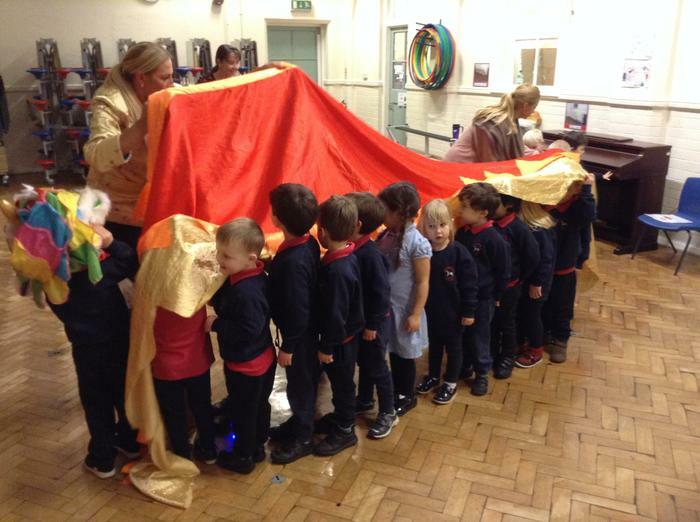 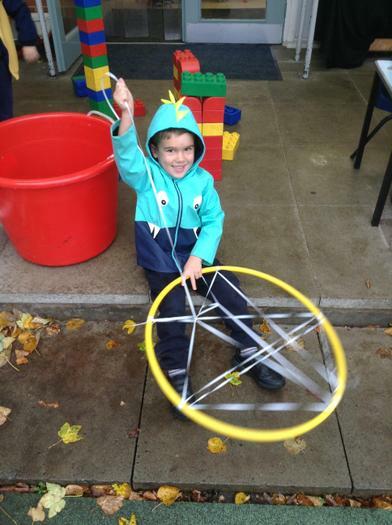 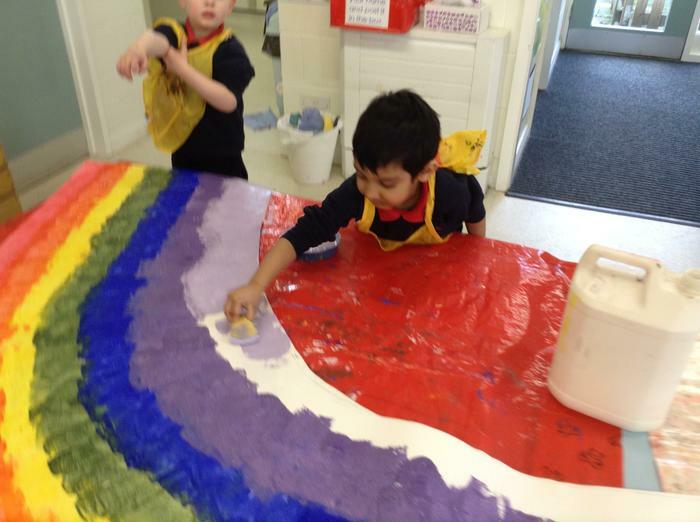 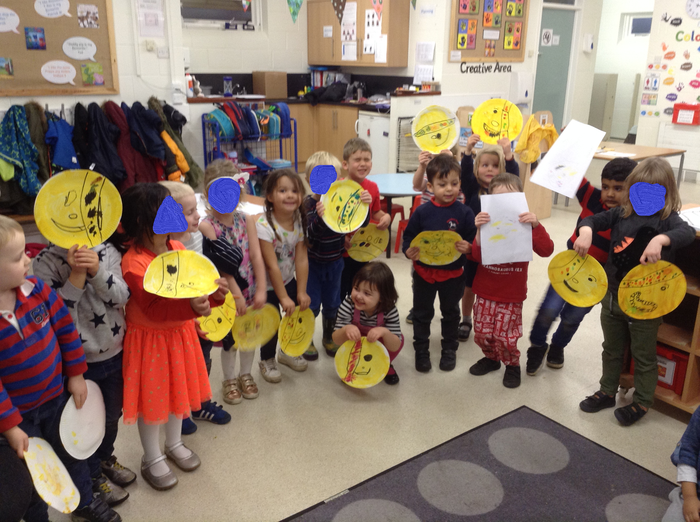 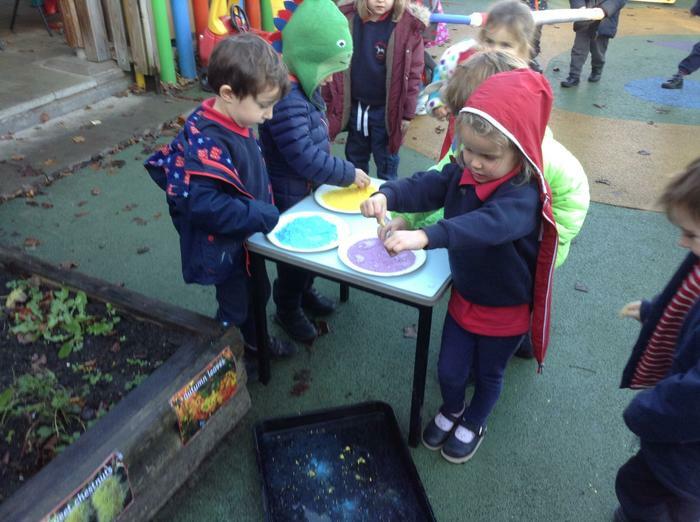 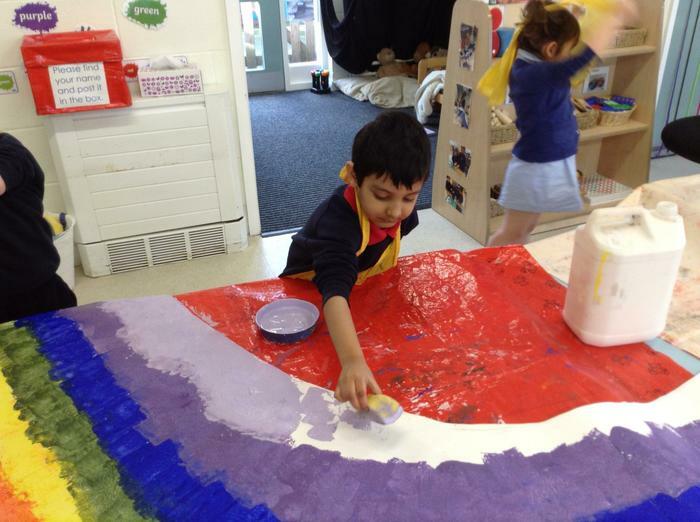 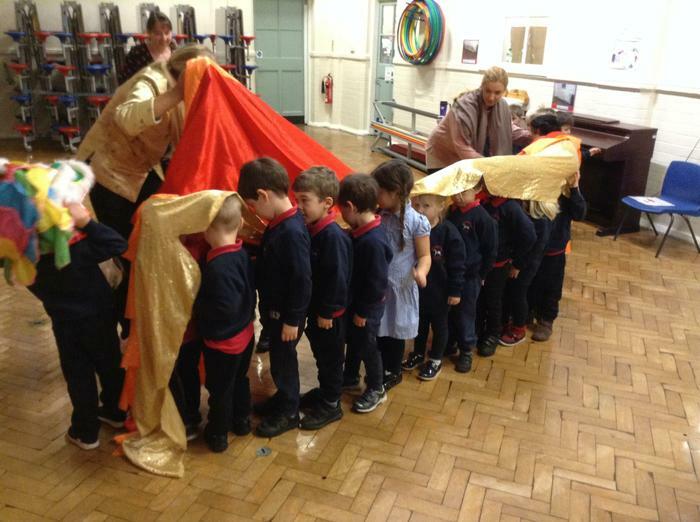 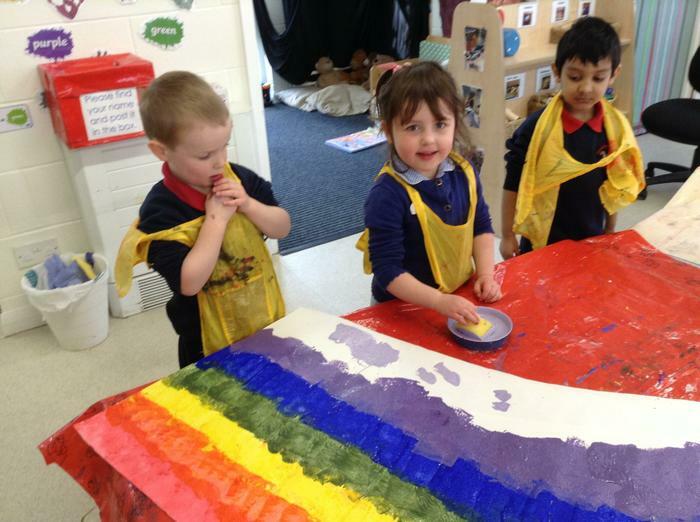 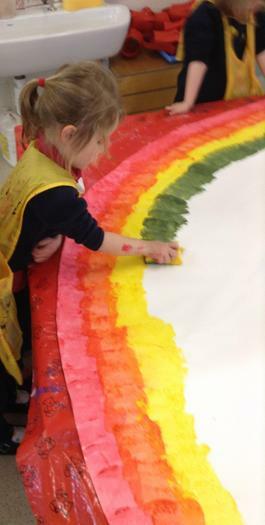 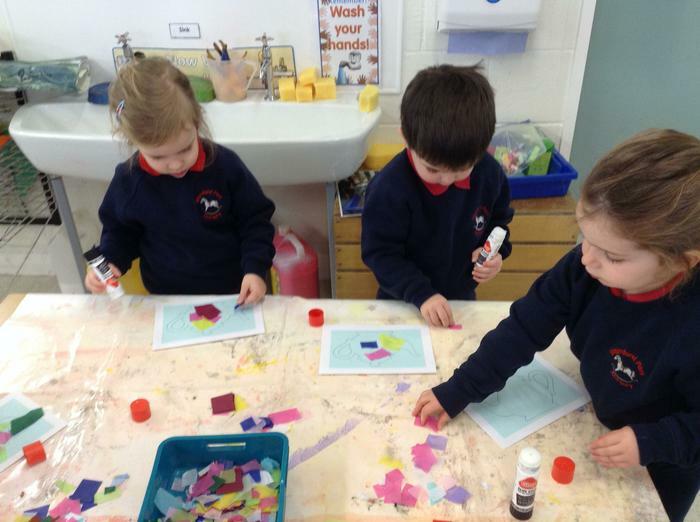 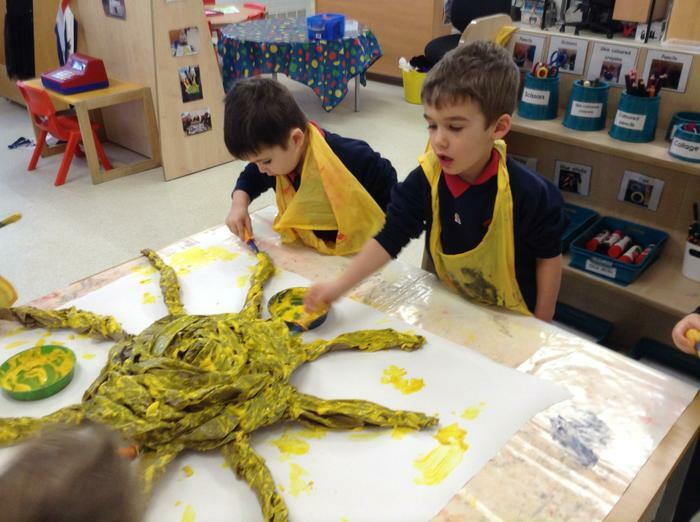 The children set out to make their own rainbow with a big sun and raincloud. 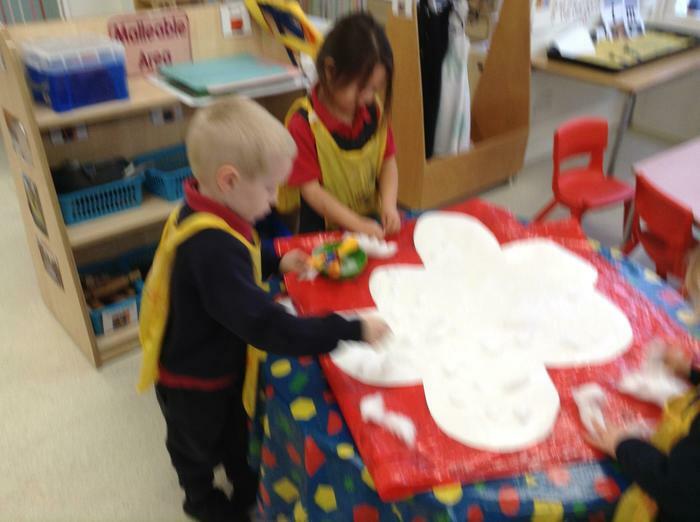 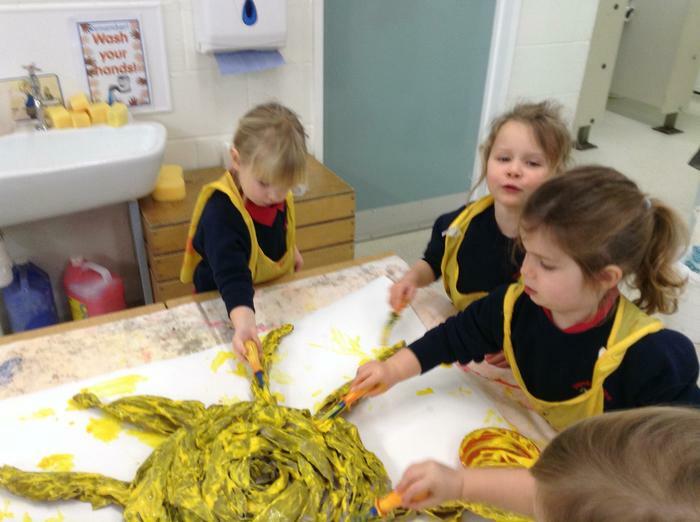 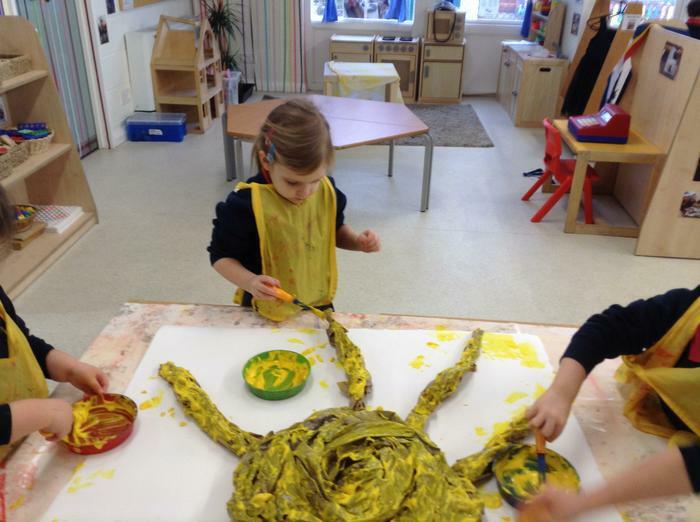 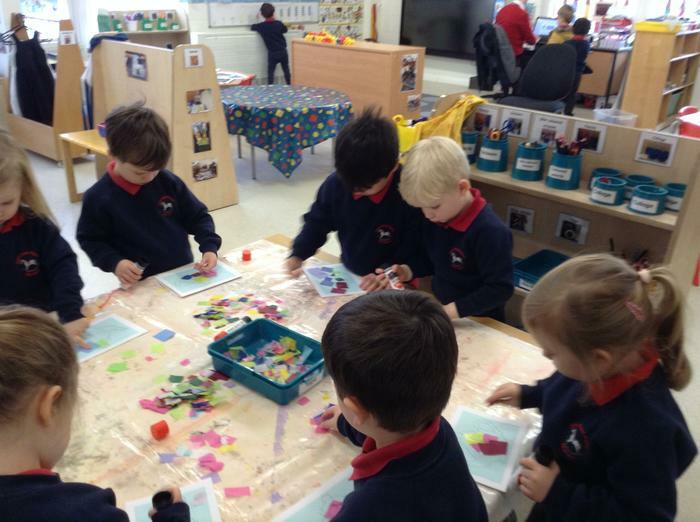 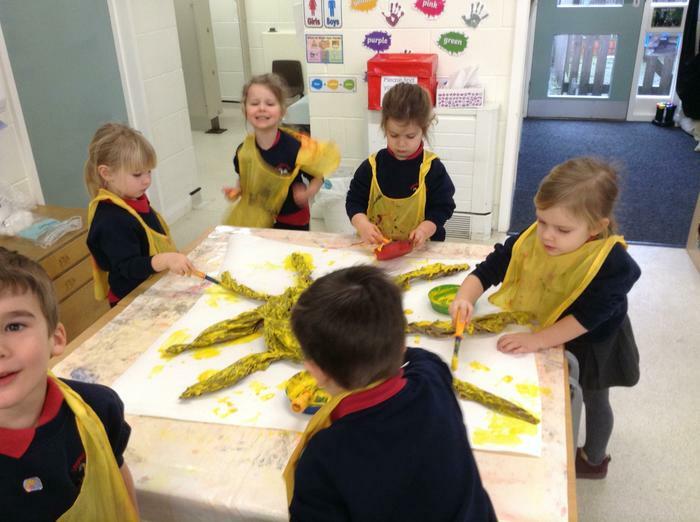 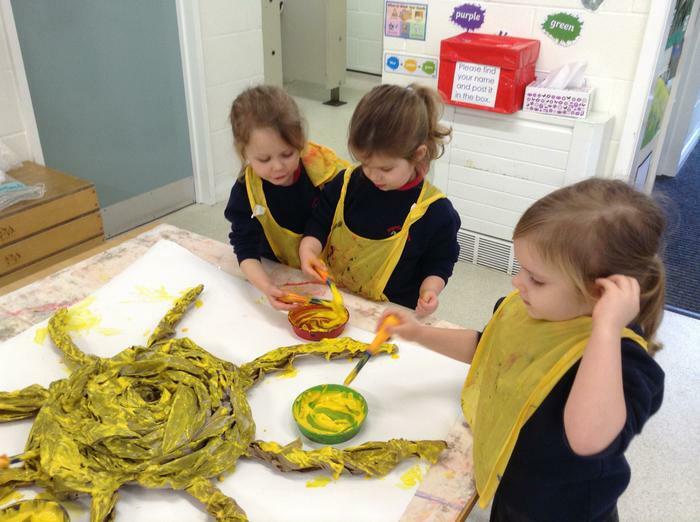 Lots of children said that flowers also need the sun and the rain so we created some large flowers for Nursery. 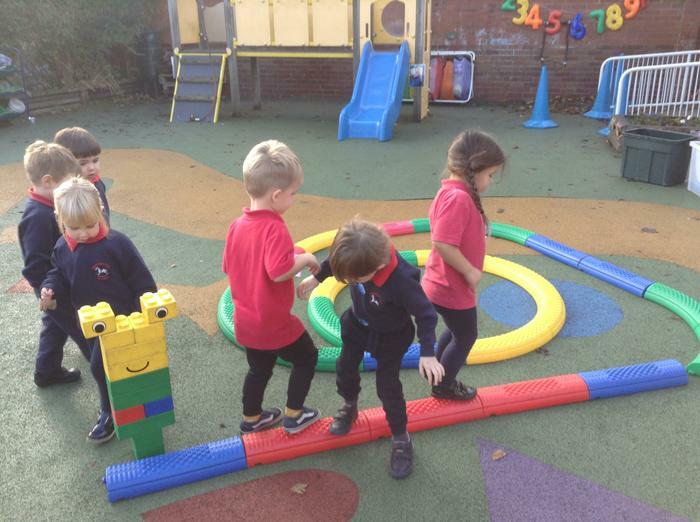 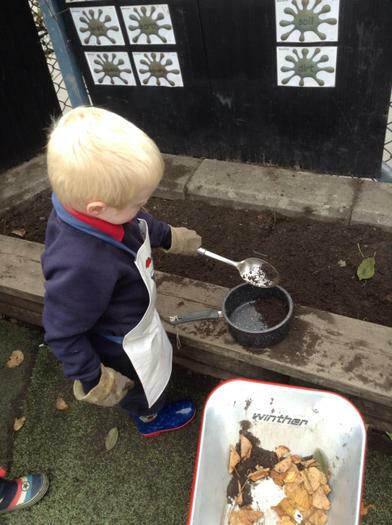 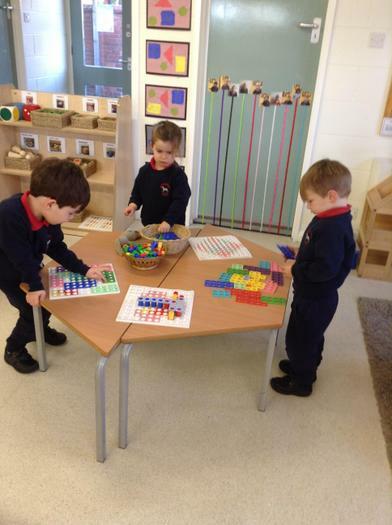 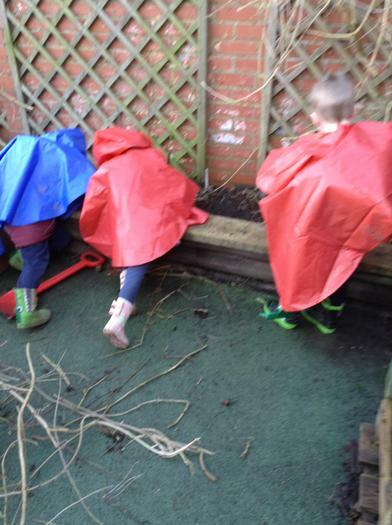 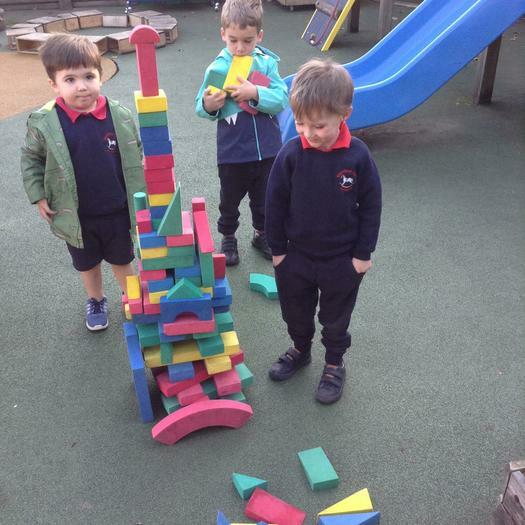 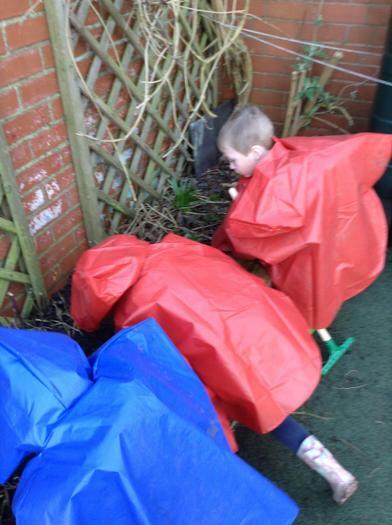 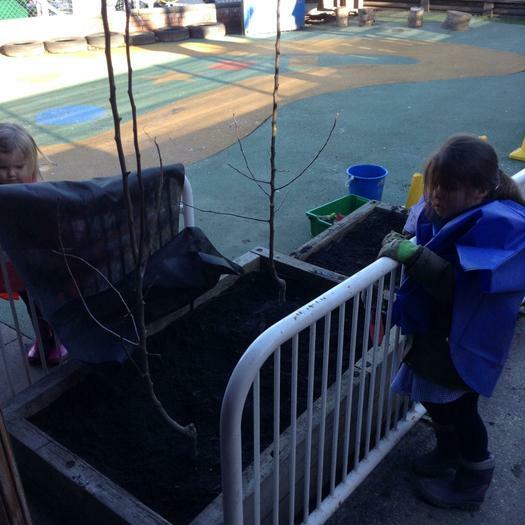 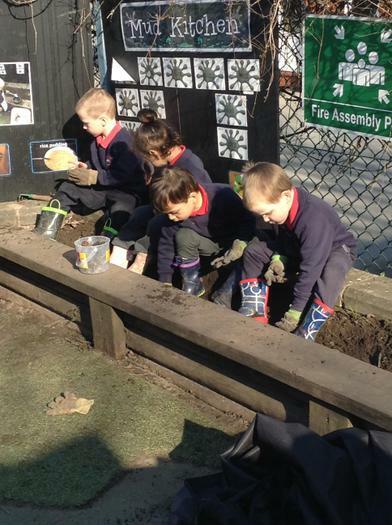 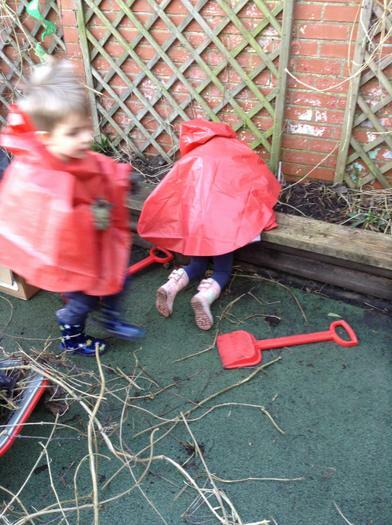 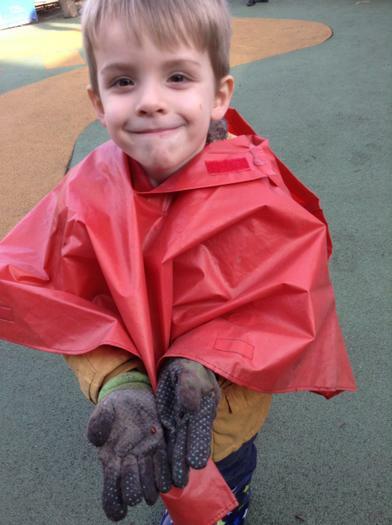 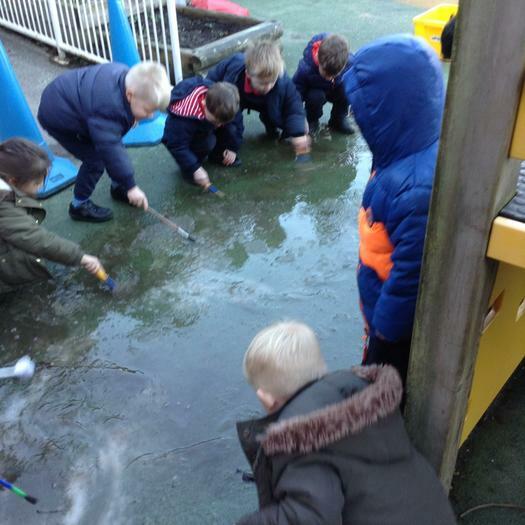 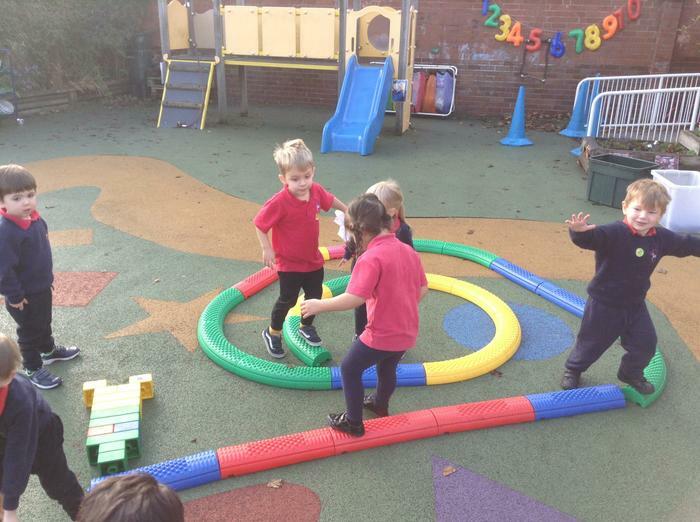 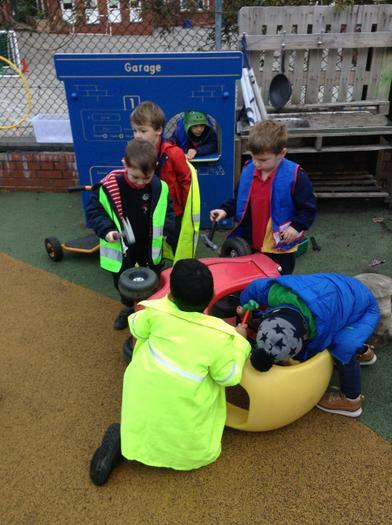 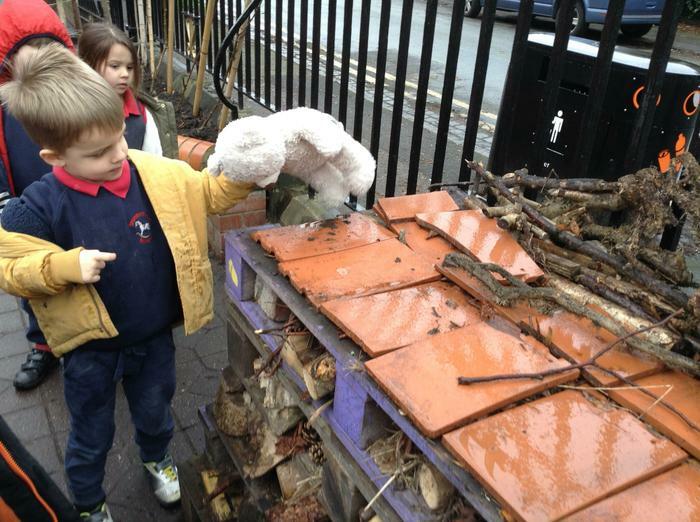 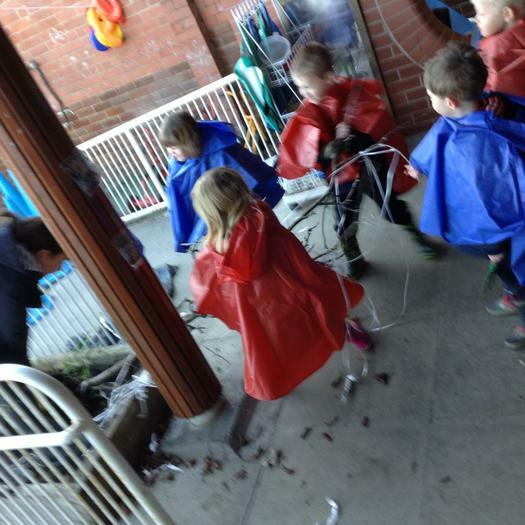 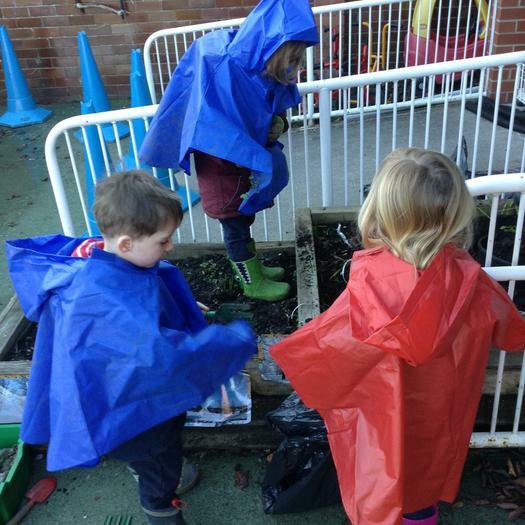 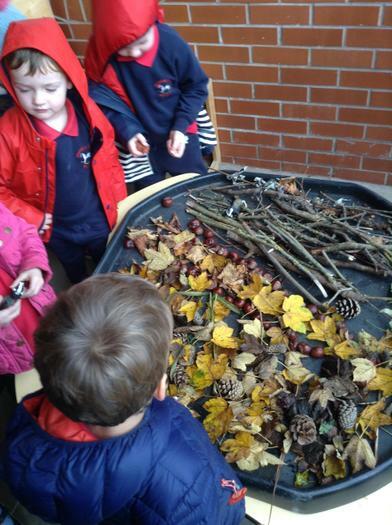 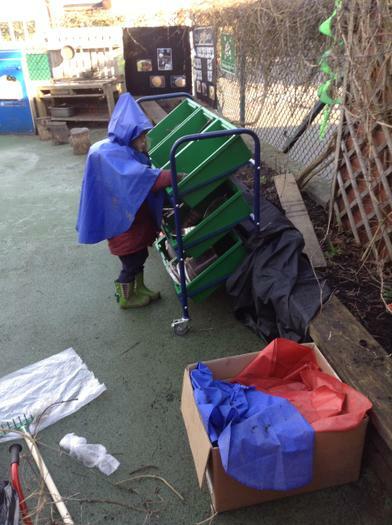 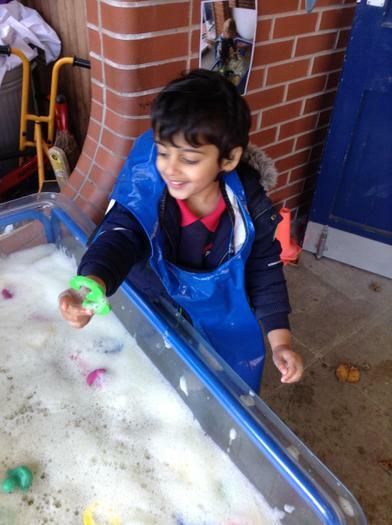 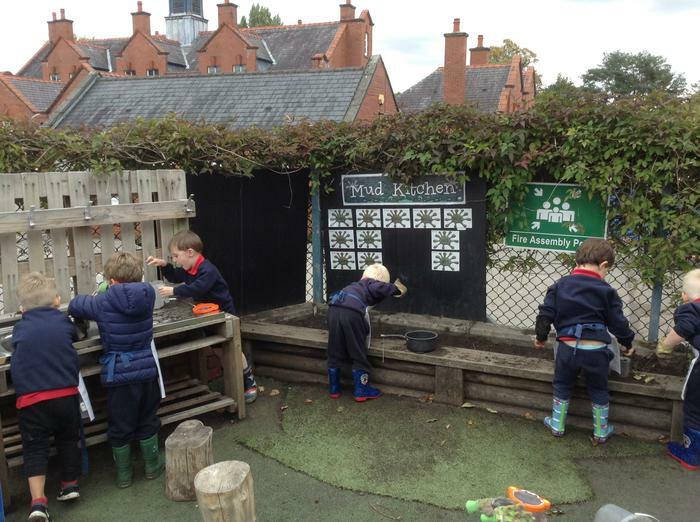 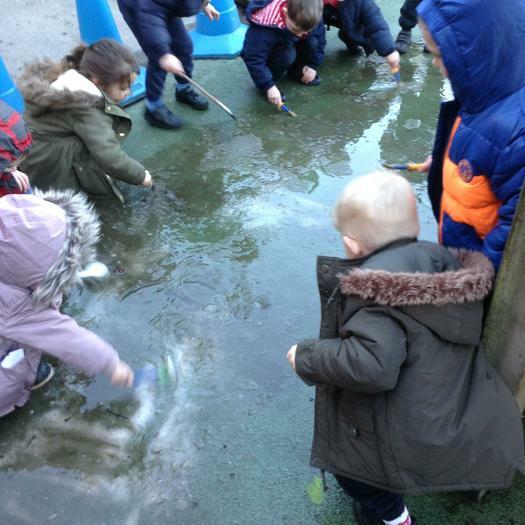 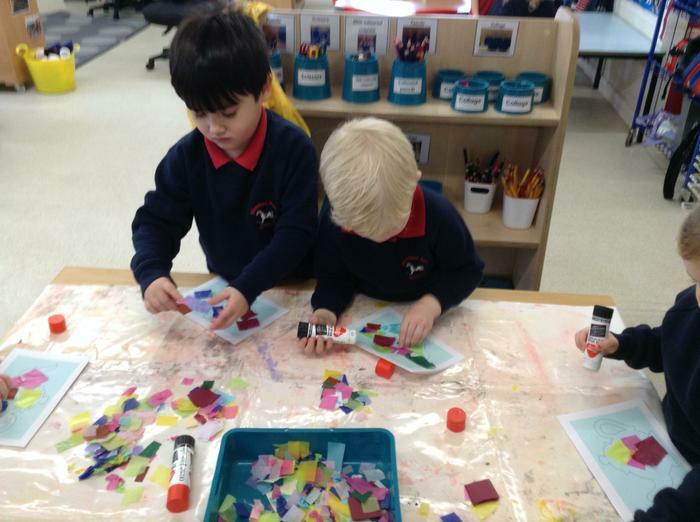 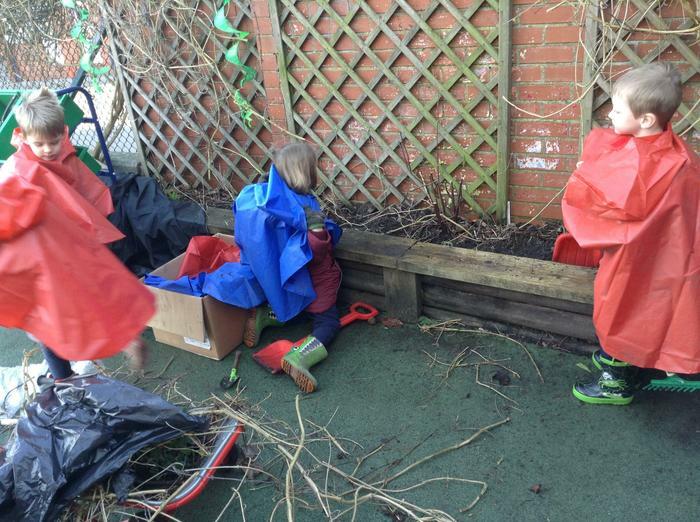 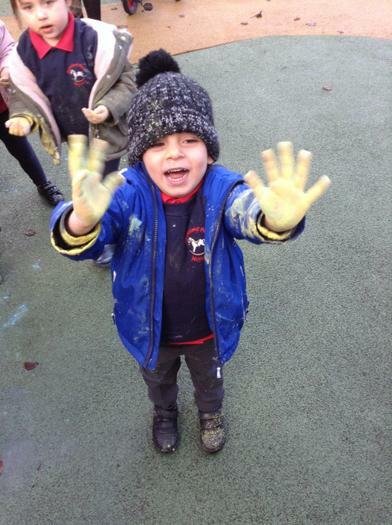 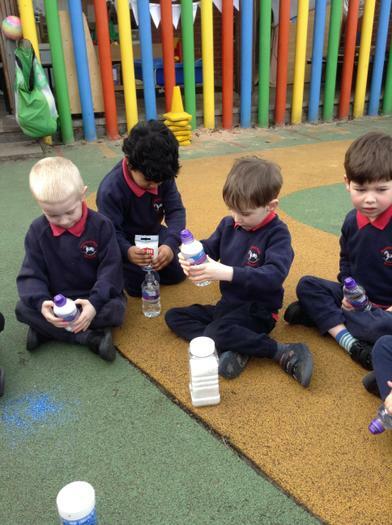 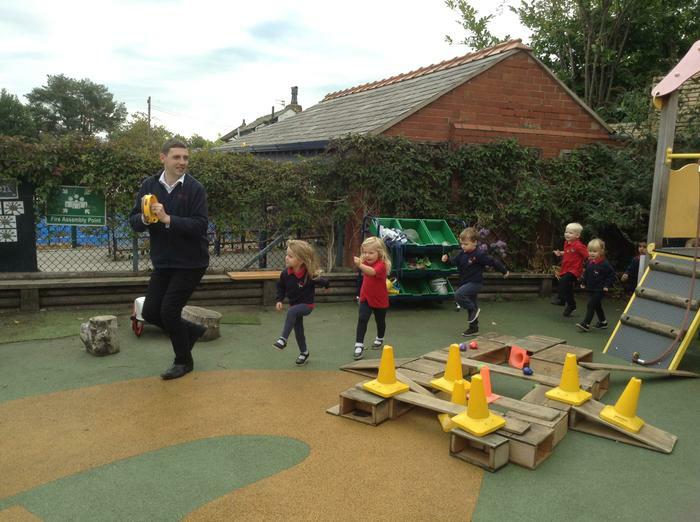 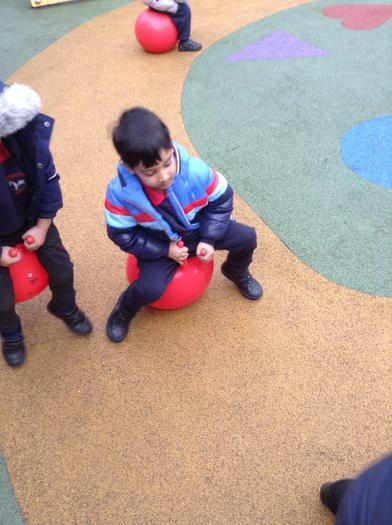 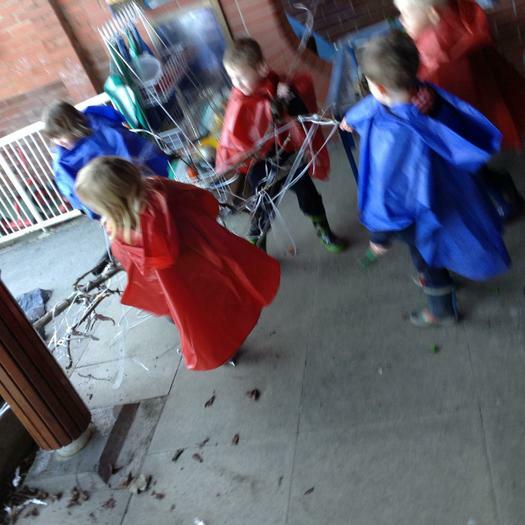 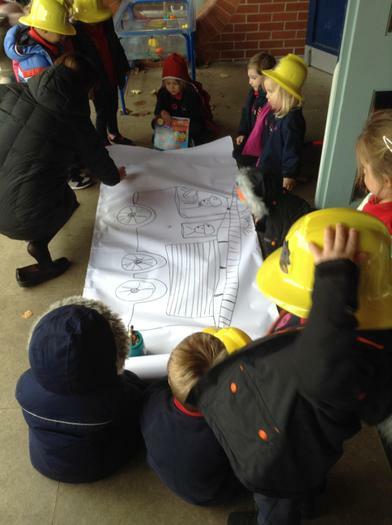 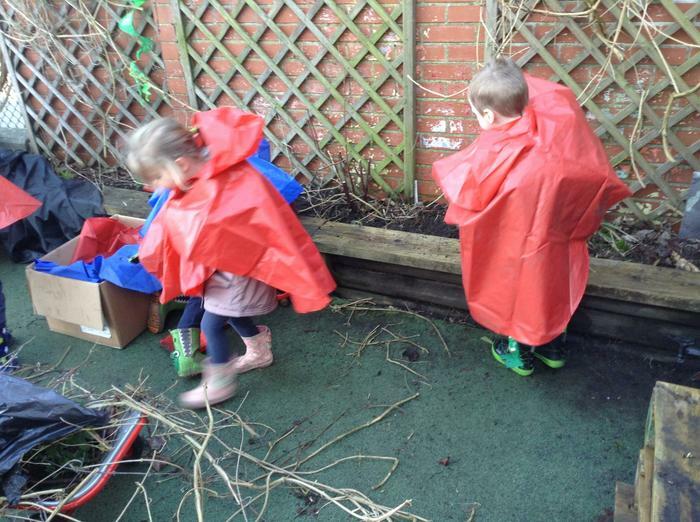 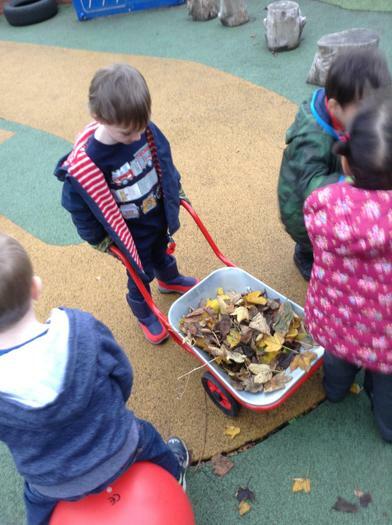 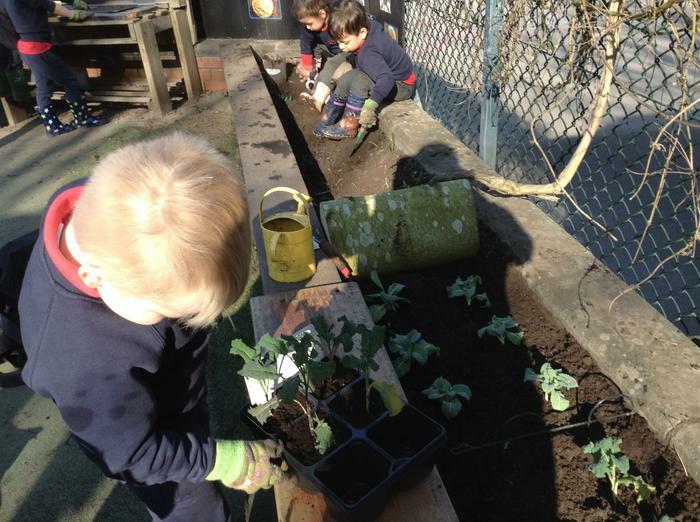 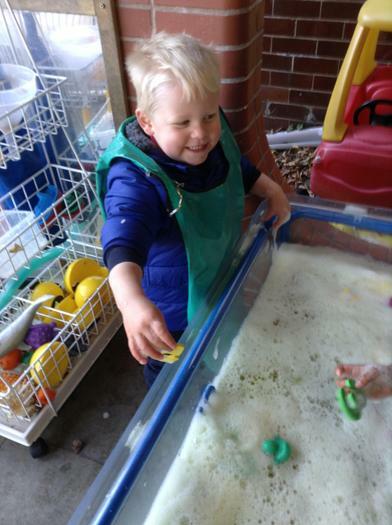 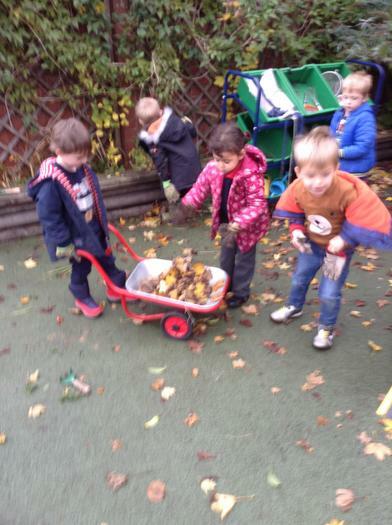 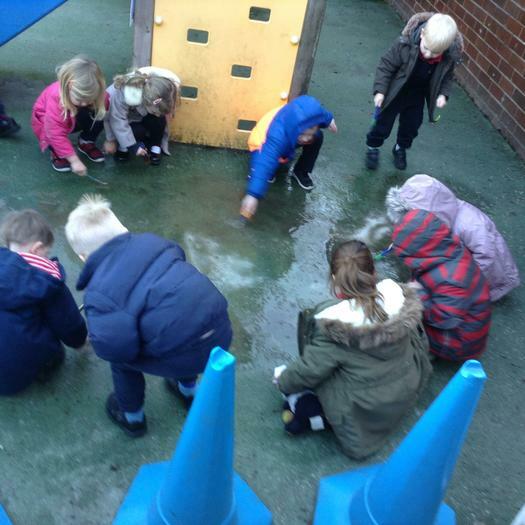 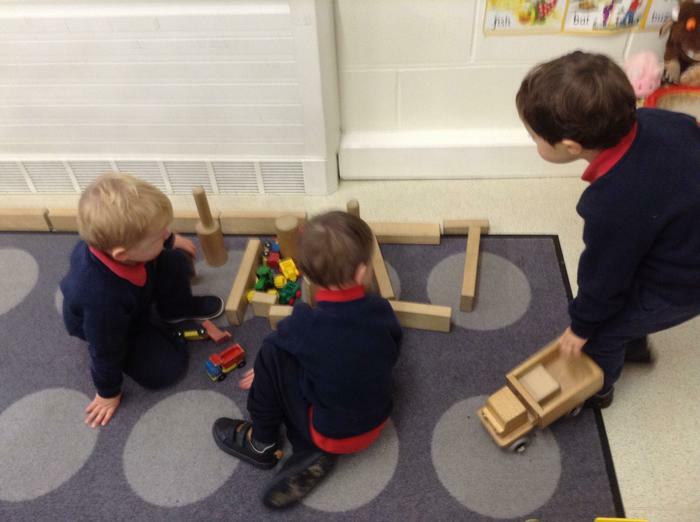 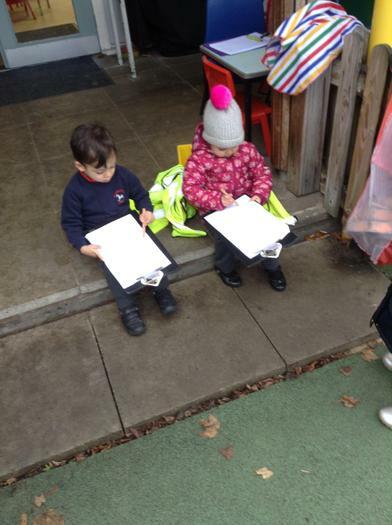 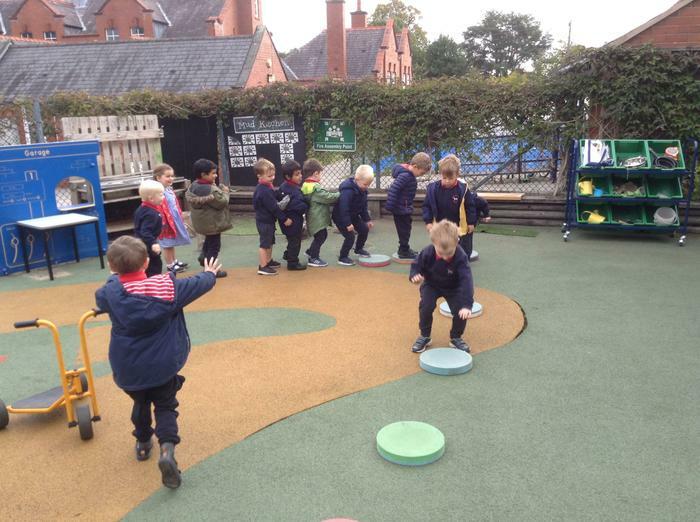 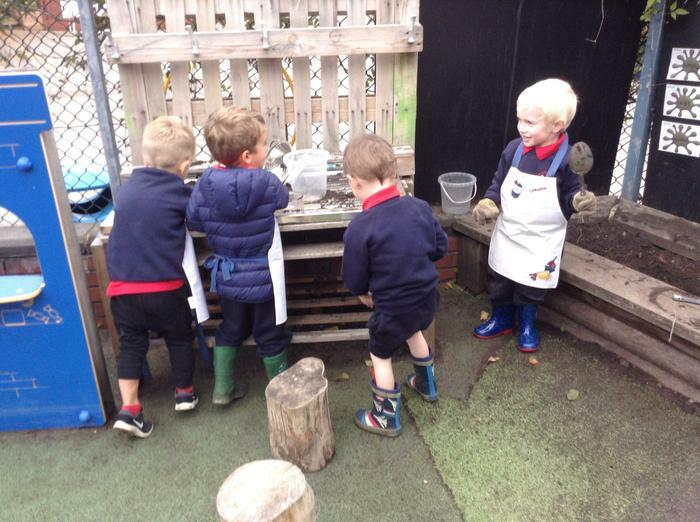 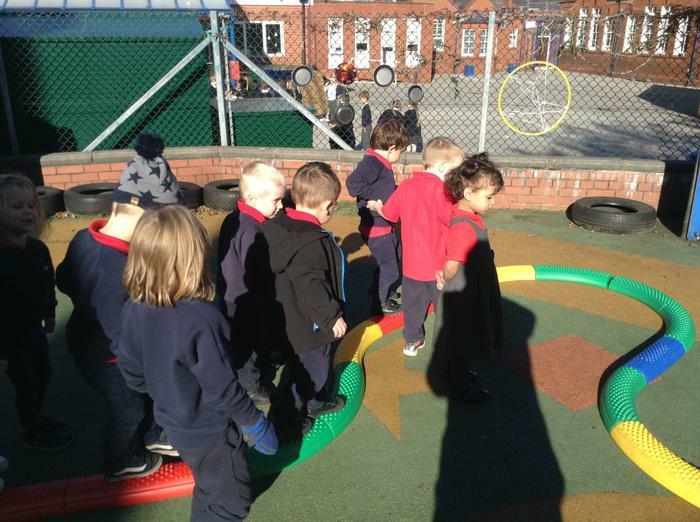 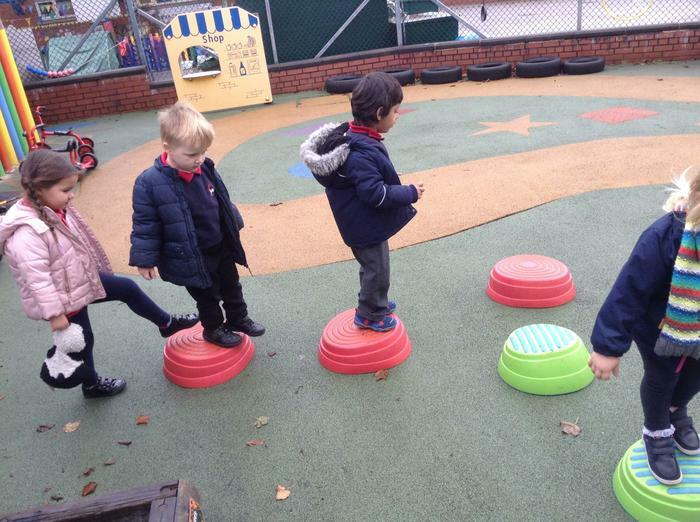 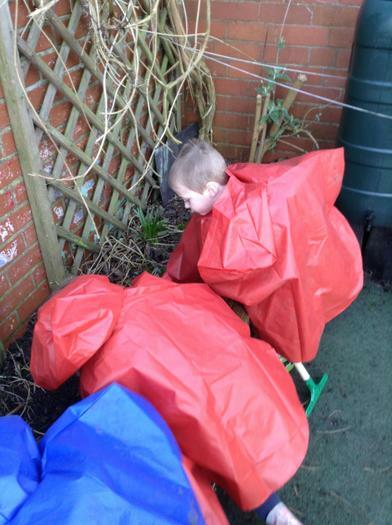 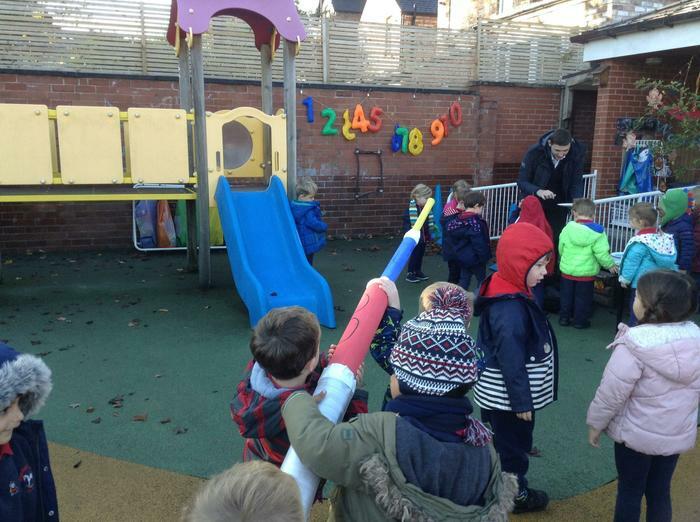 We have been developing our Nursery outdoor area. 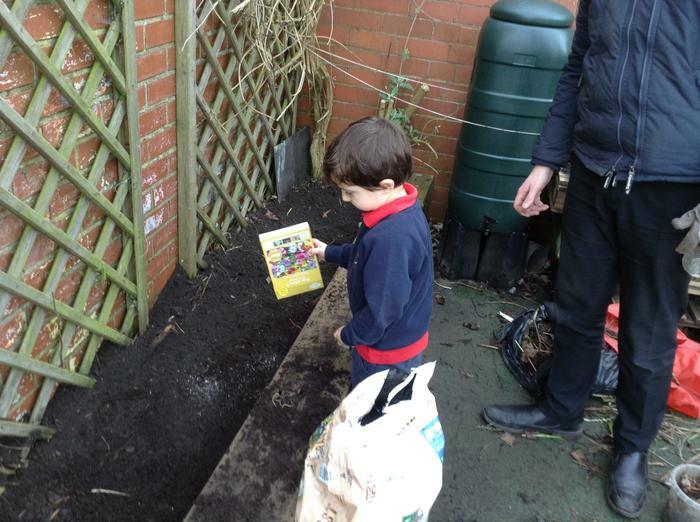 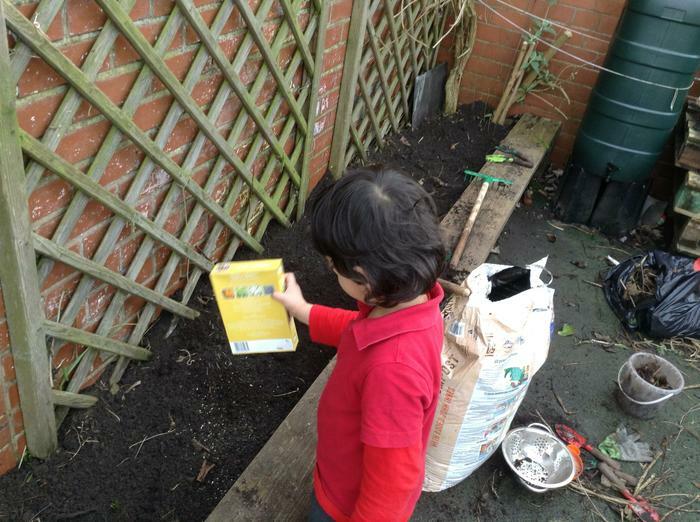 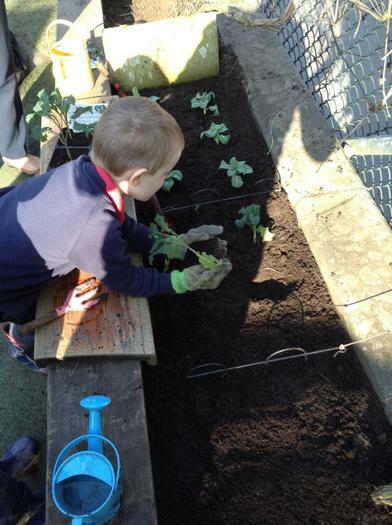 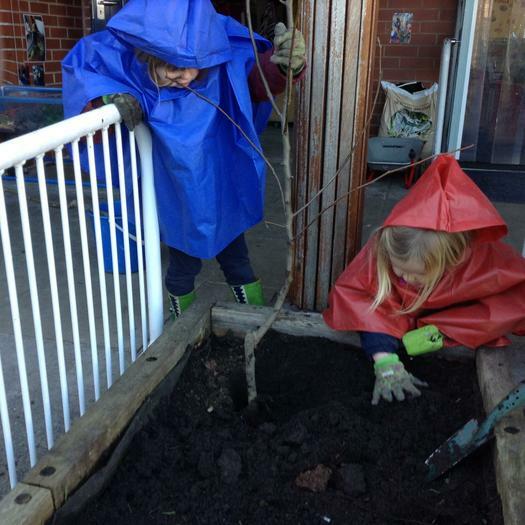 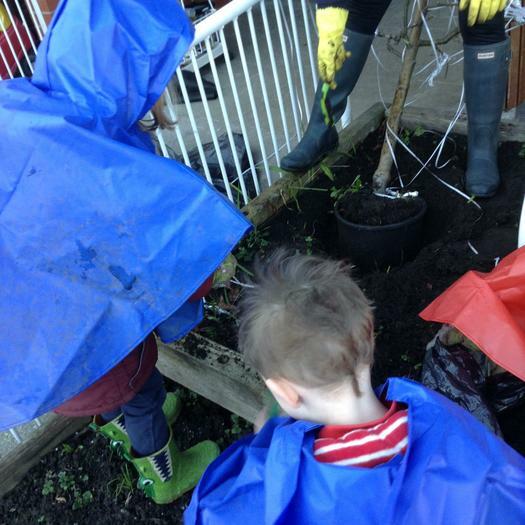 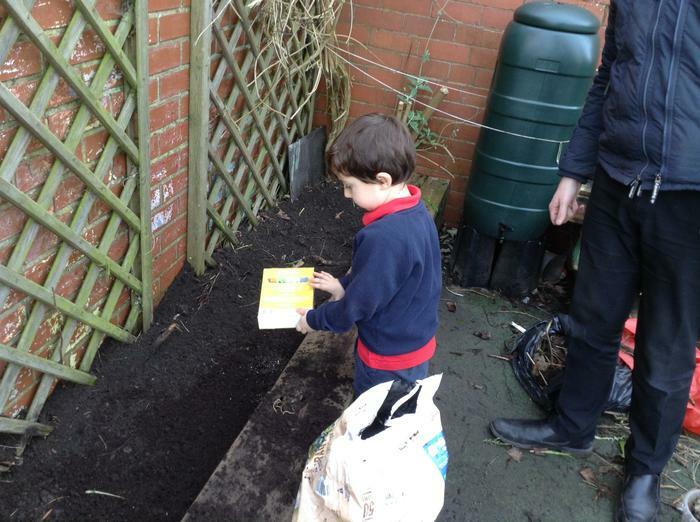 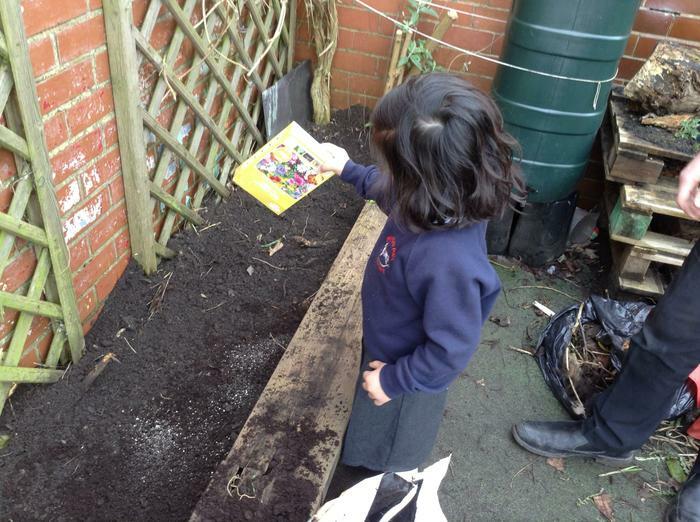 We have been planting a vegetable patch, herb garden and fruit trees, along with a mini beast investigation area. 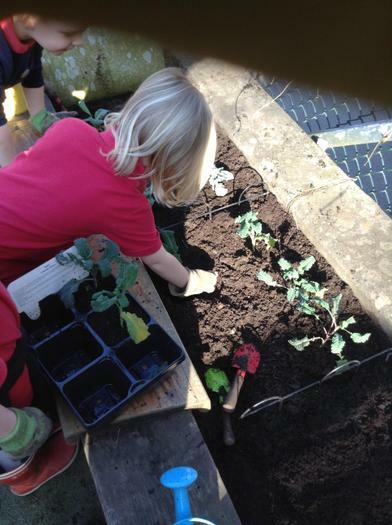 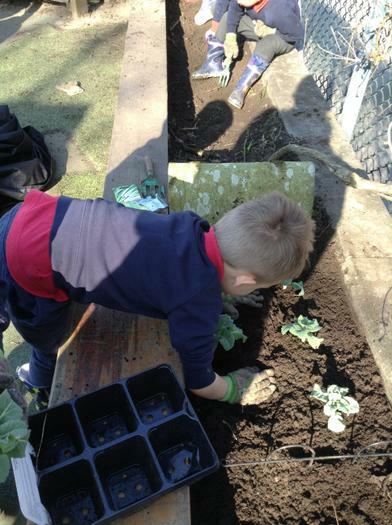 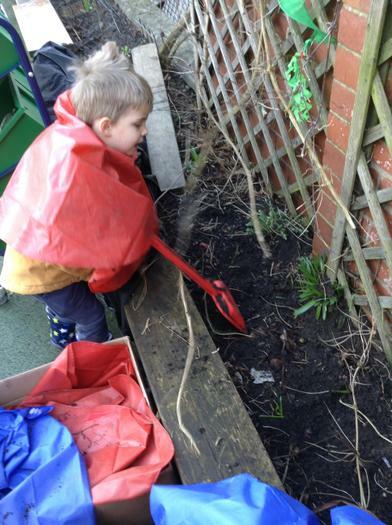 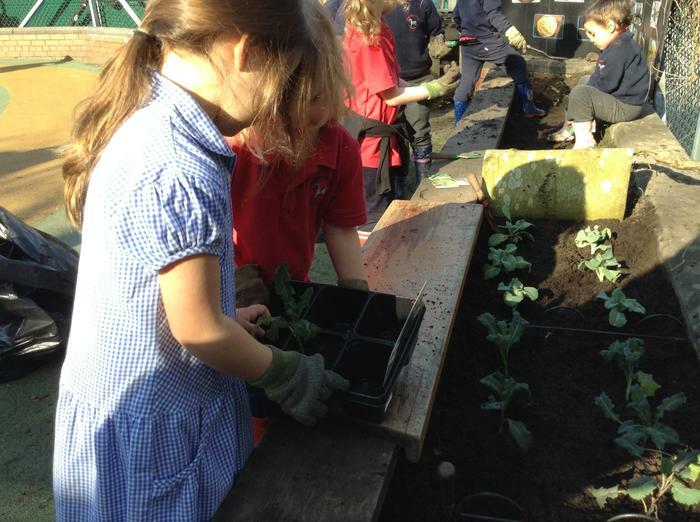 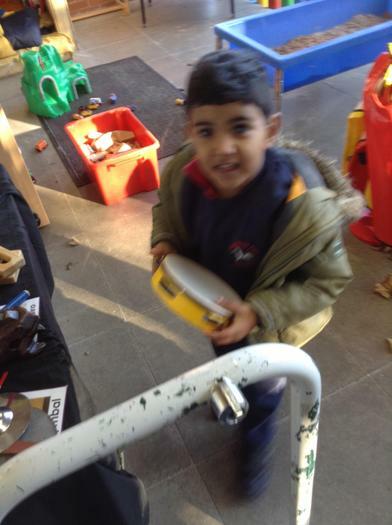 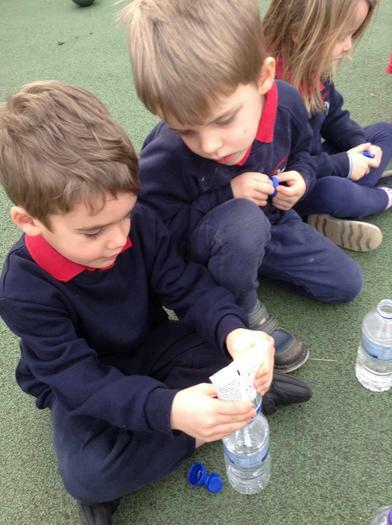 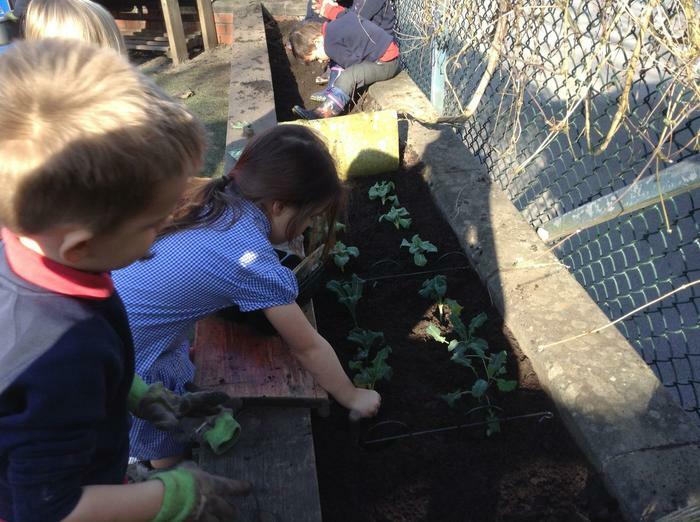 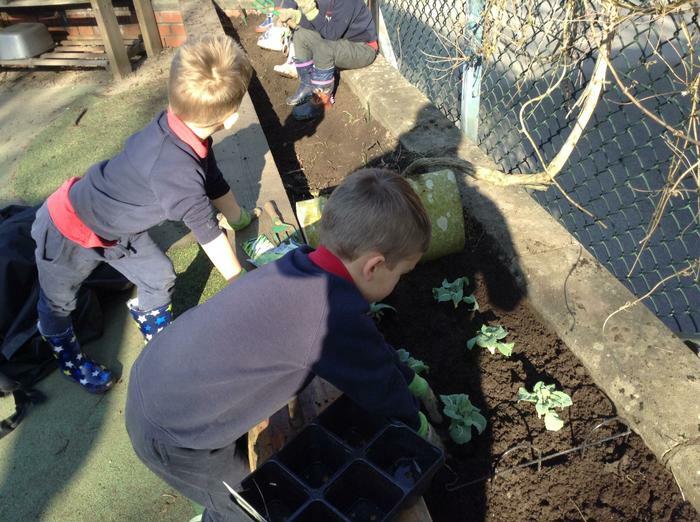 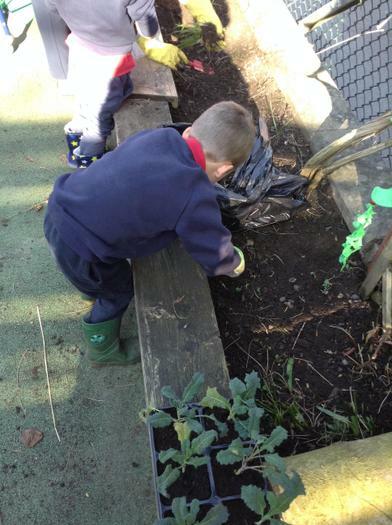 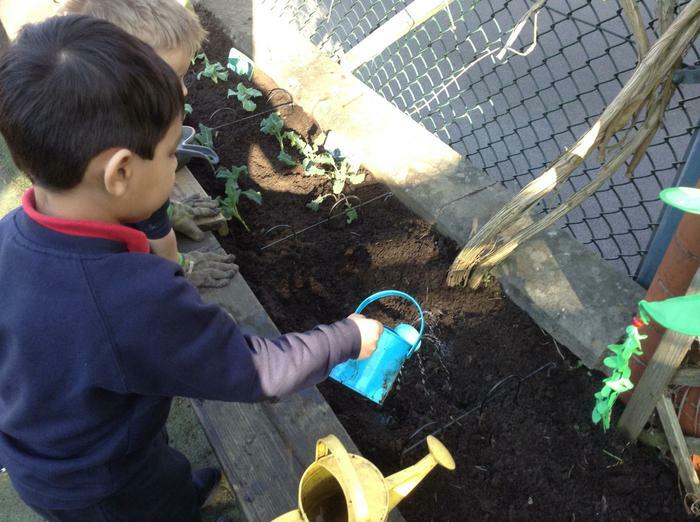 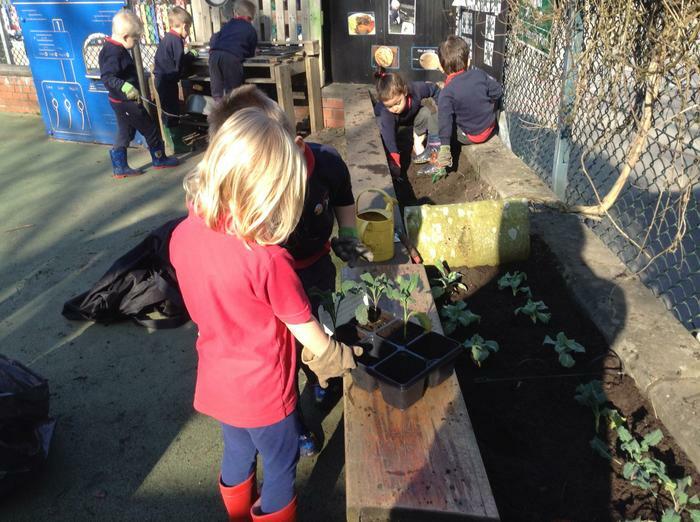 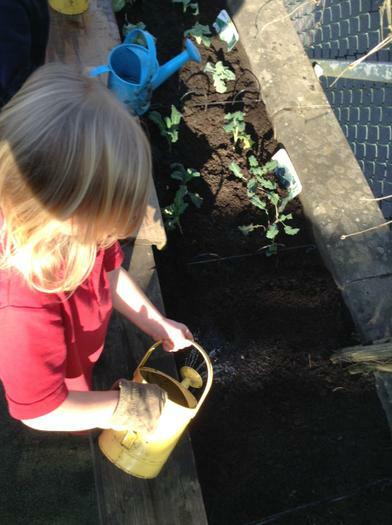 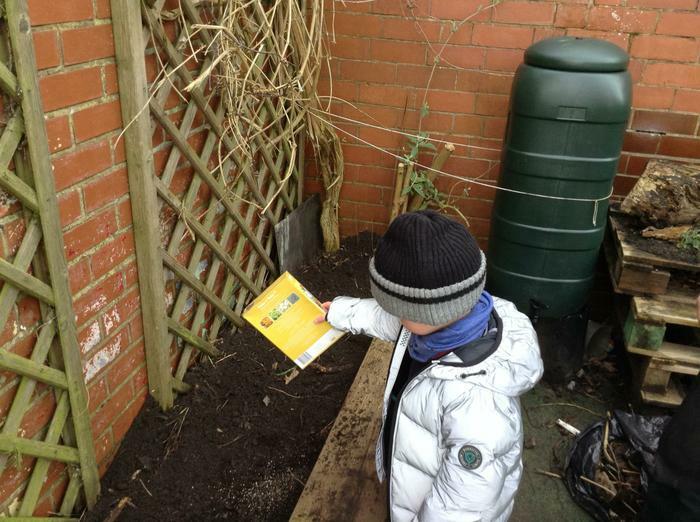 The children have loved discussing what the plants need to grow and have been watering their new gardening areas. 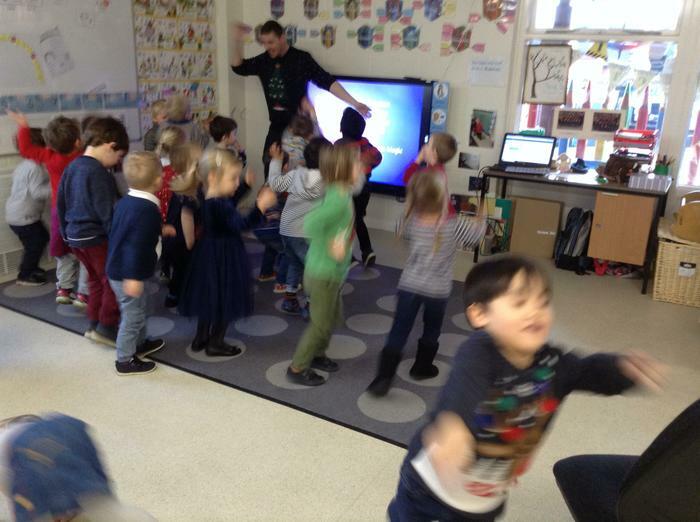 We celebrated Wellness Wednesday with our school. 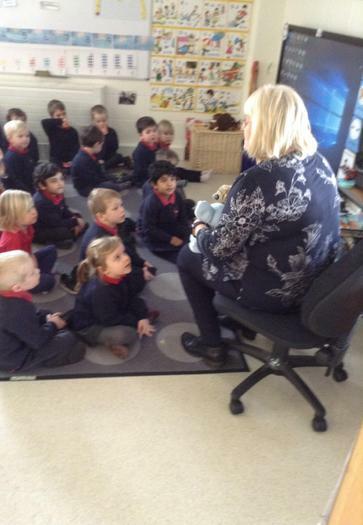 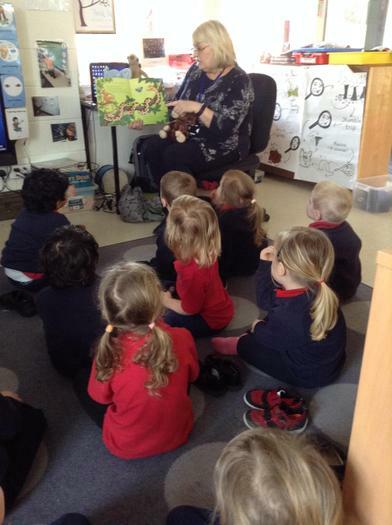 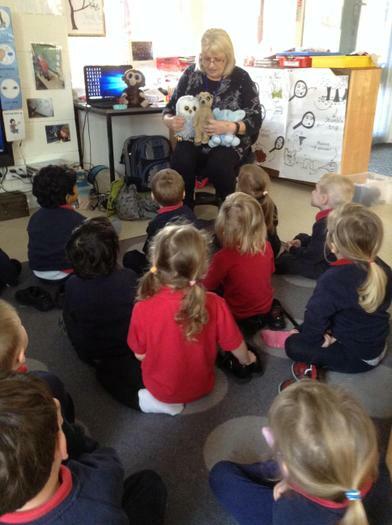 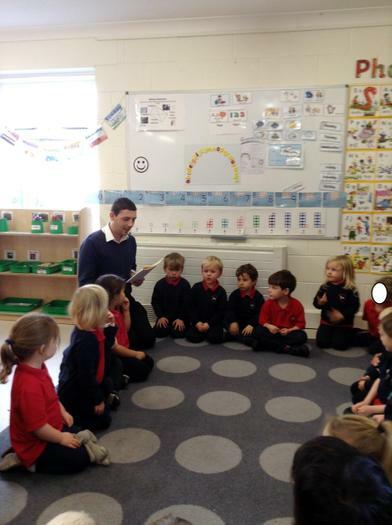 Mrs Graham came over to Nursery to read us a special story and showed us all how to be calm and caring. 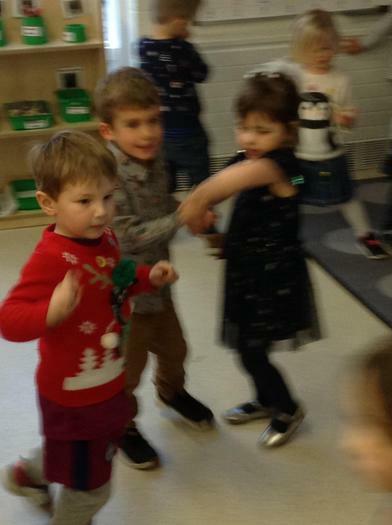 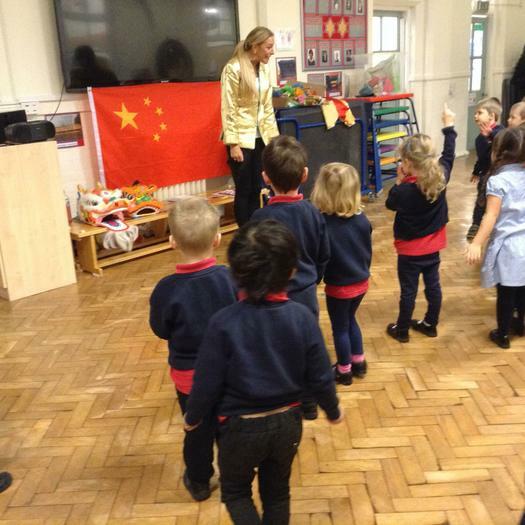 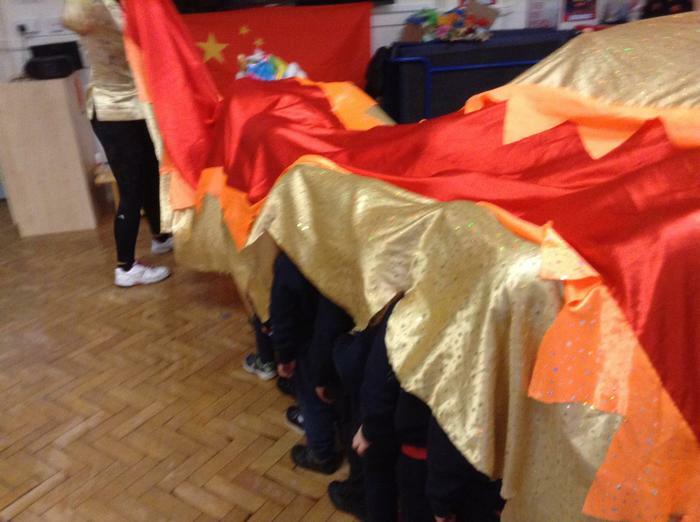 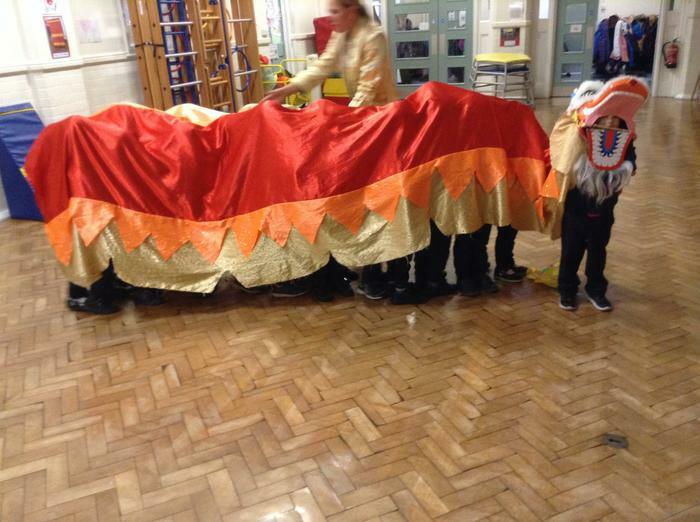 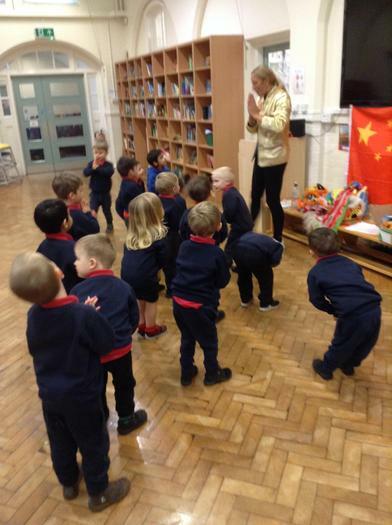 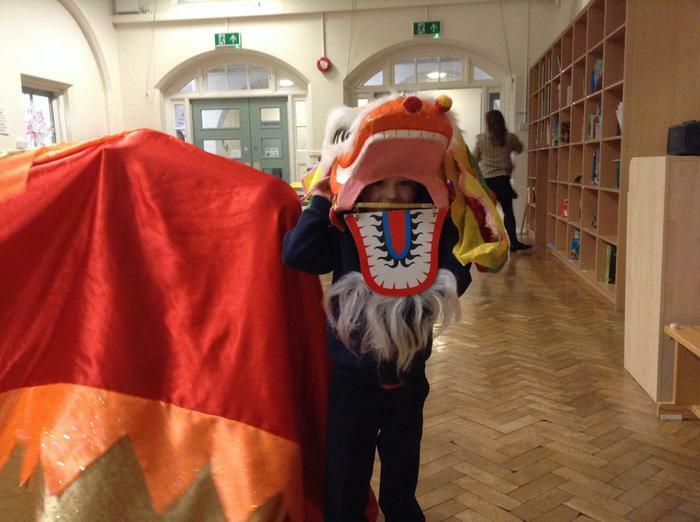 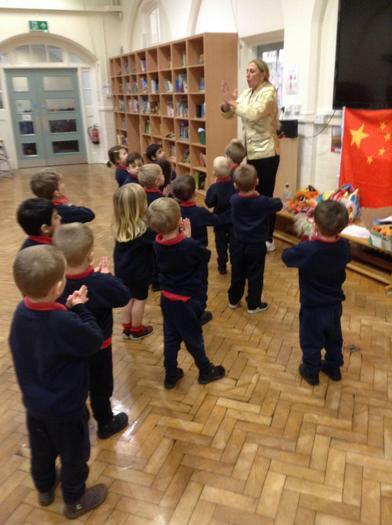 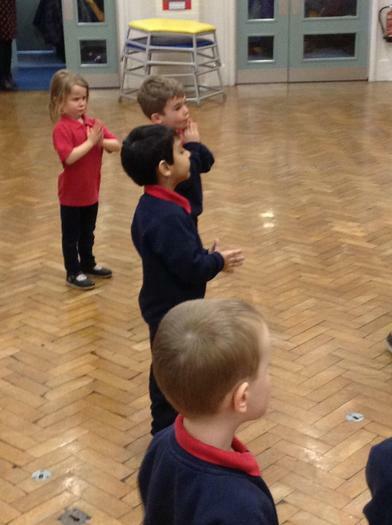 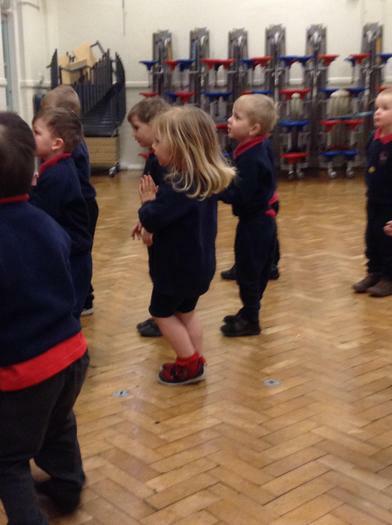 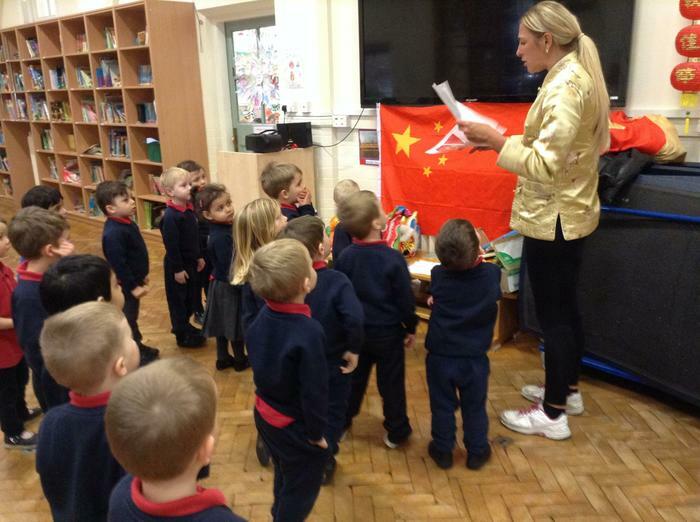 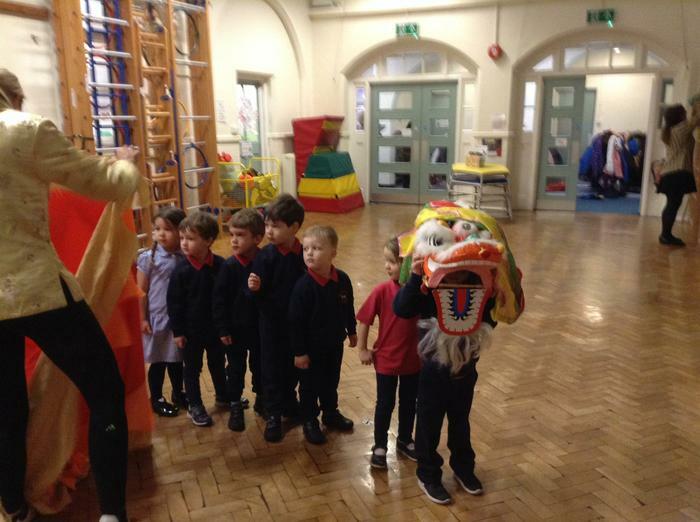 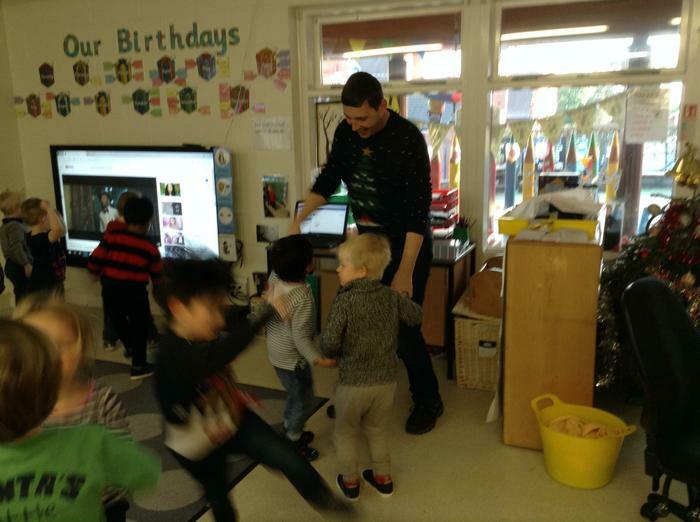 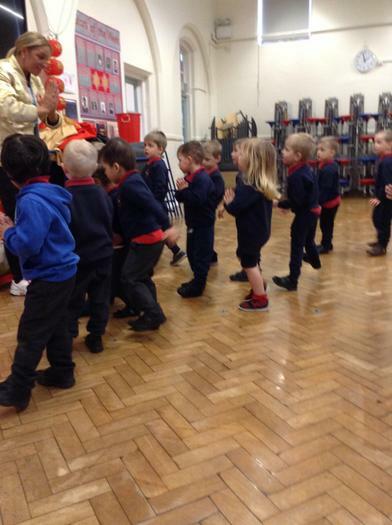 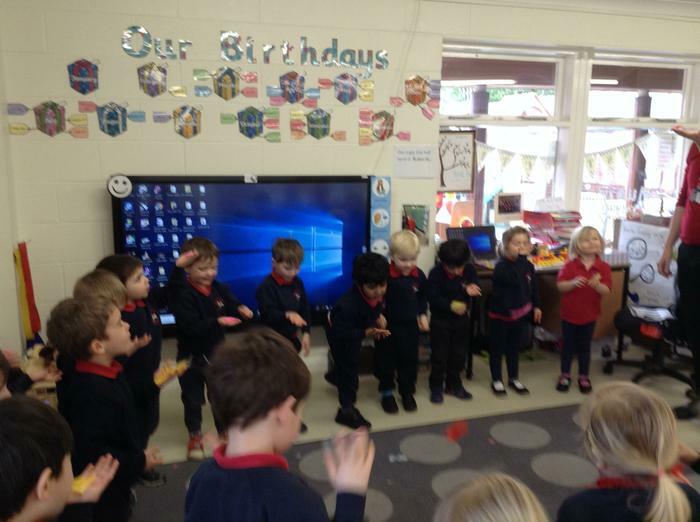 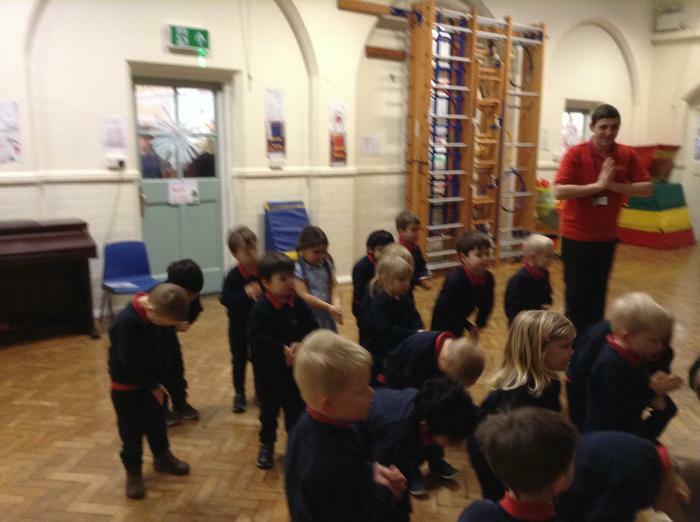 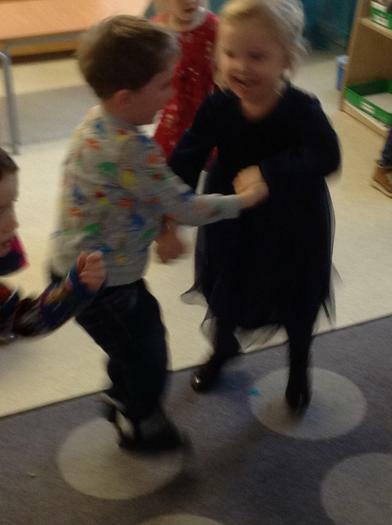 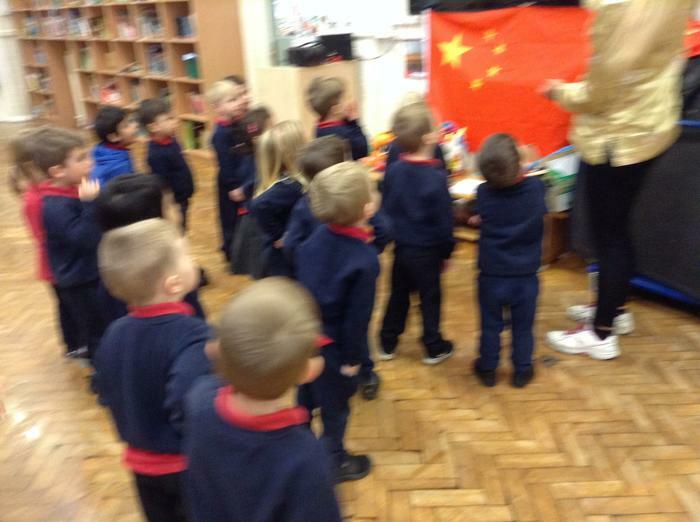 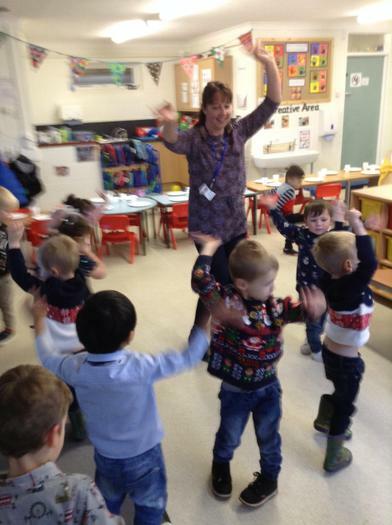 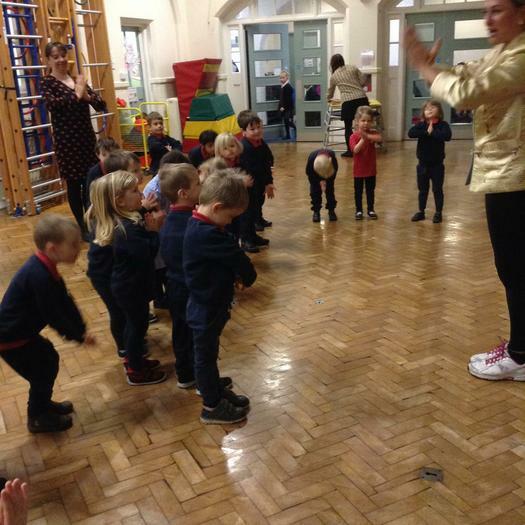 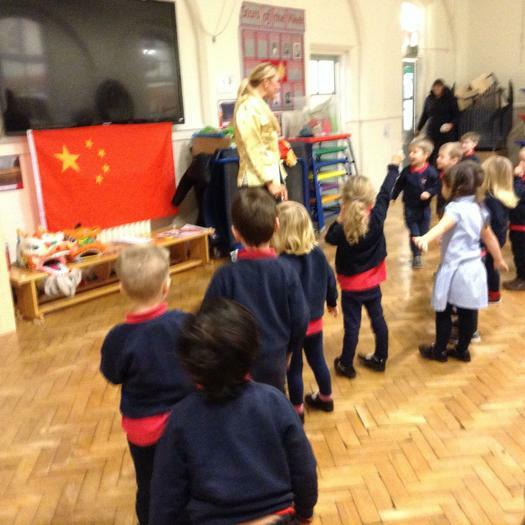 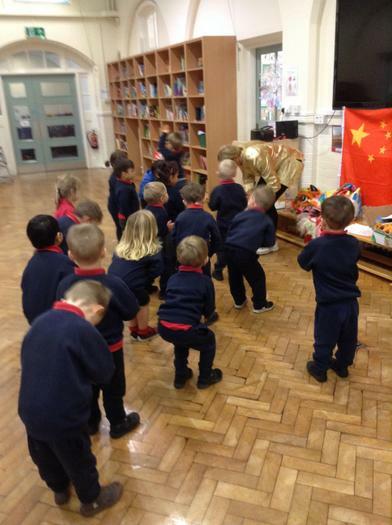 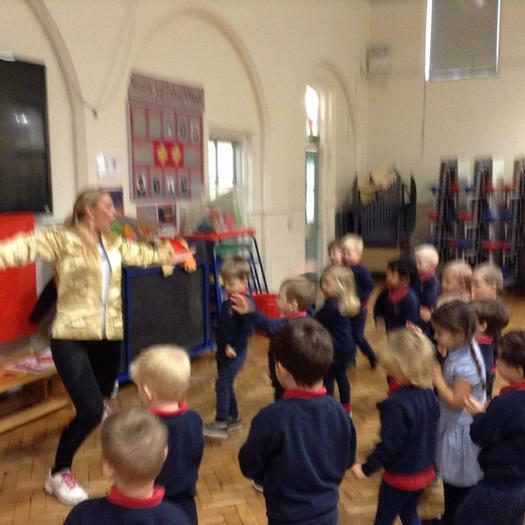 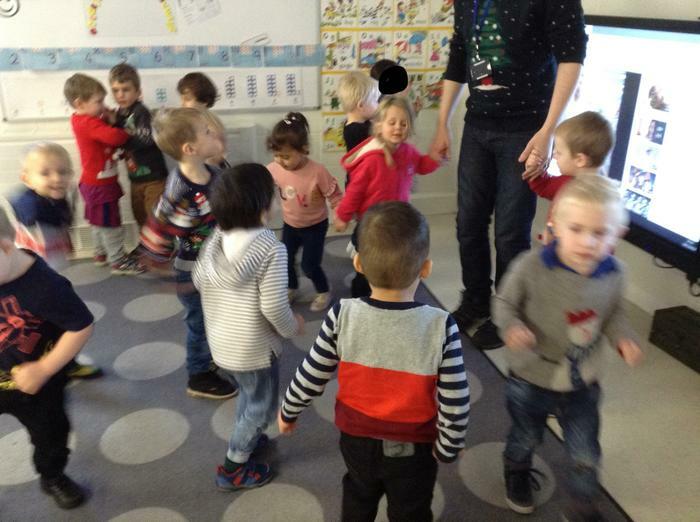 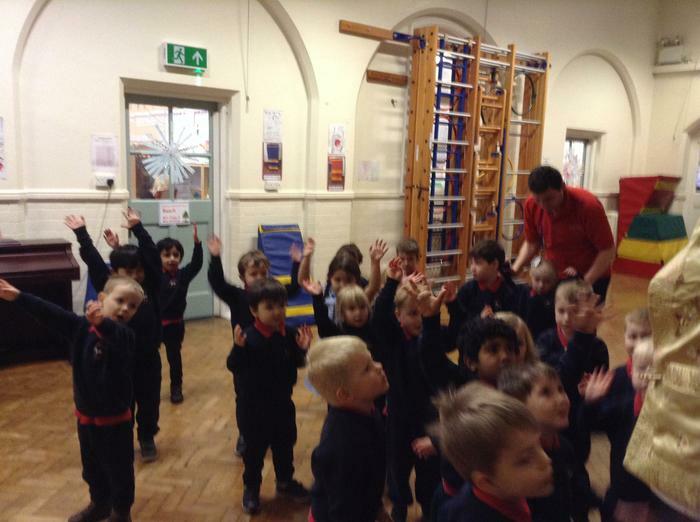 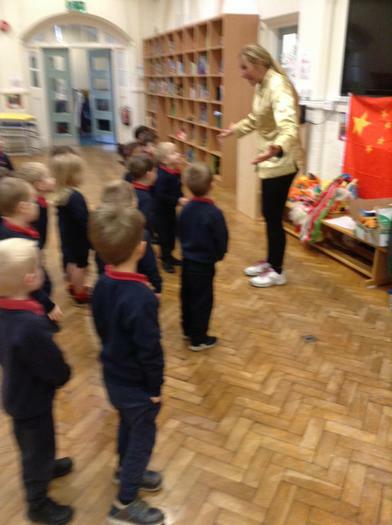 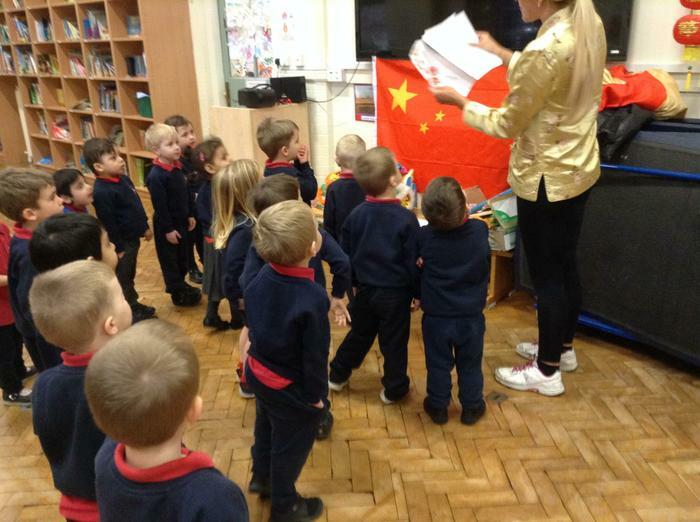 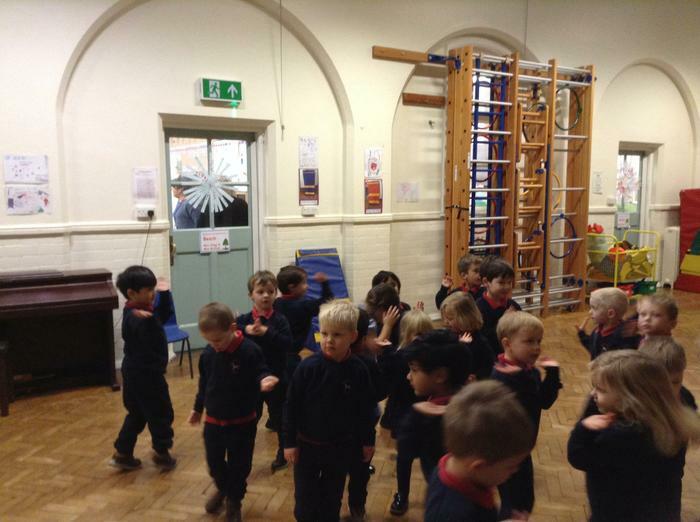 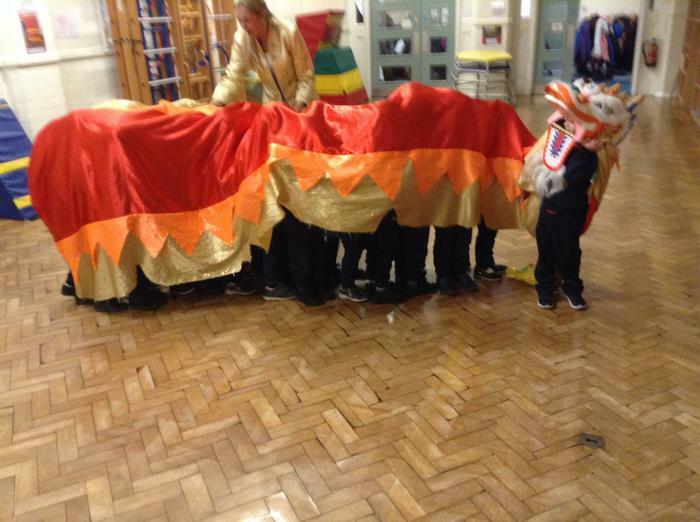 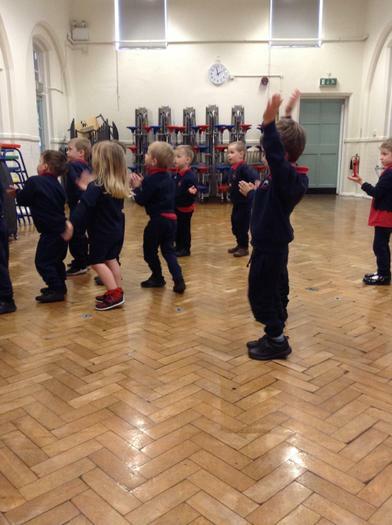 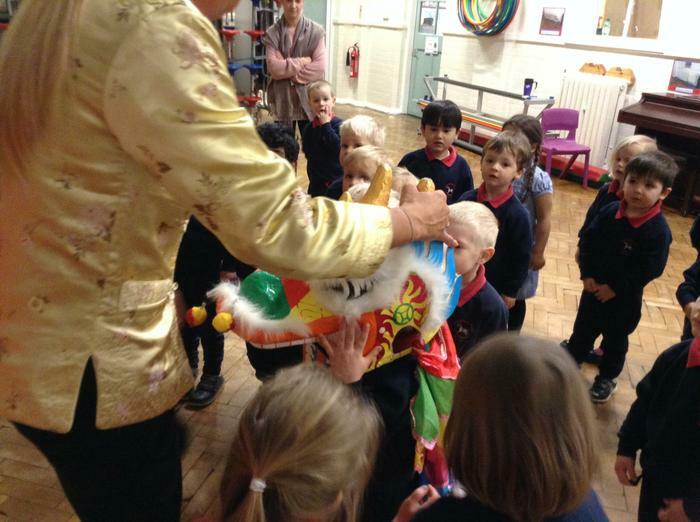 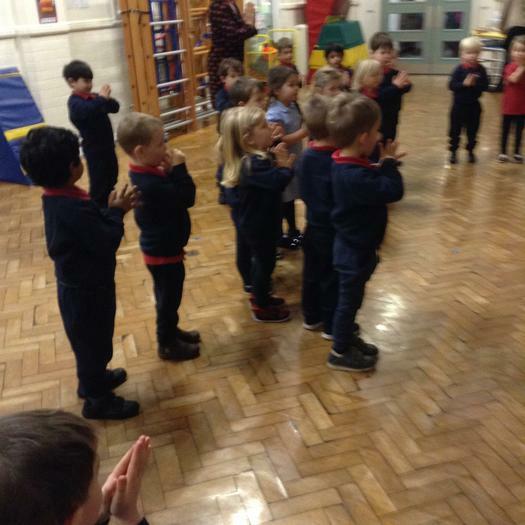 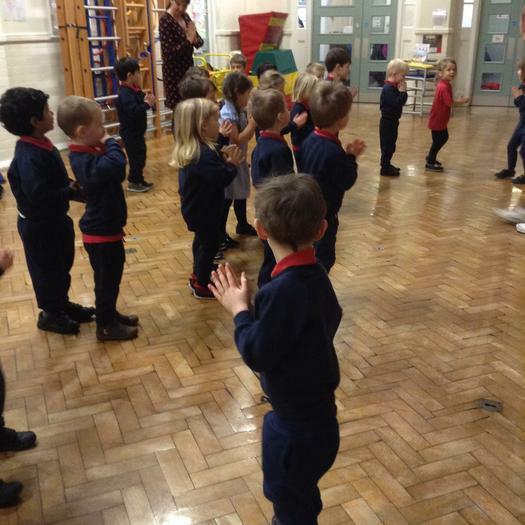 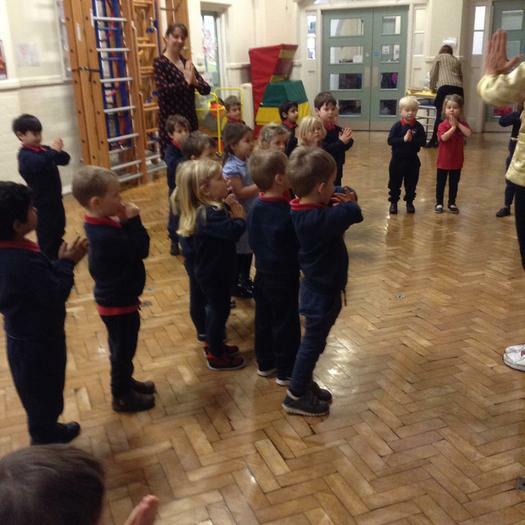 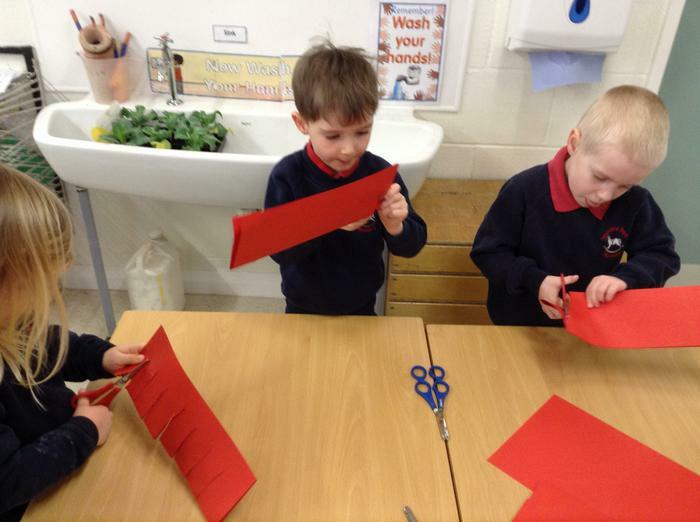 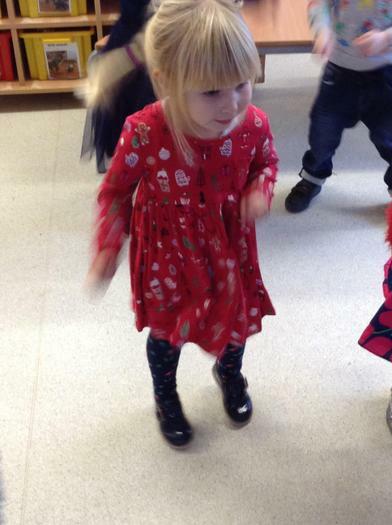 We had a special workshop to celebrate Chinese New Year with lots of dancing and music. 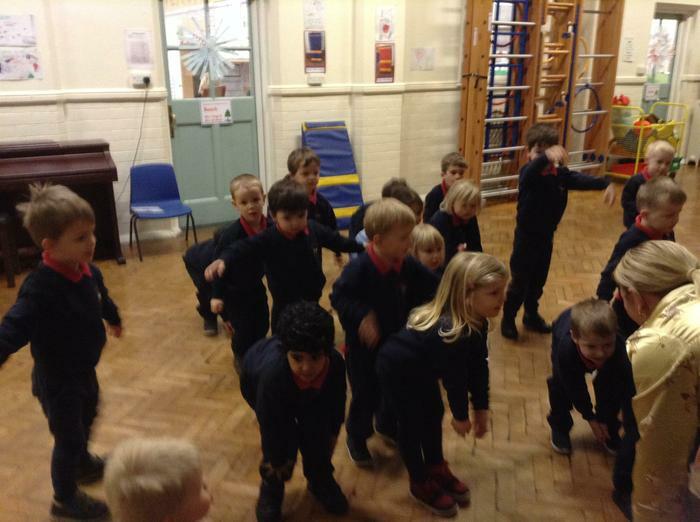 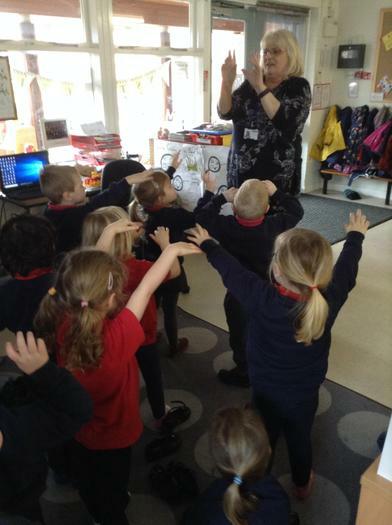 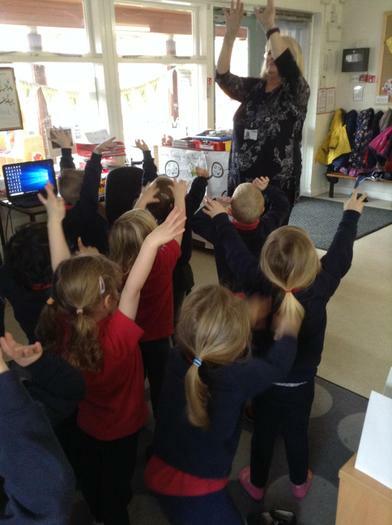 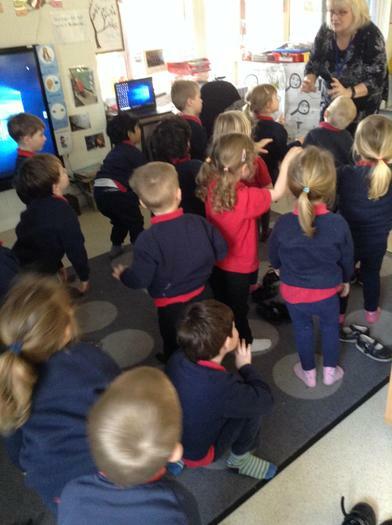 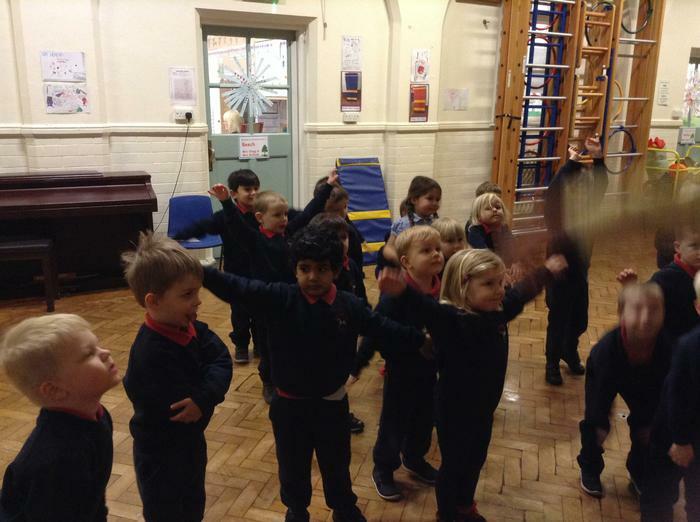 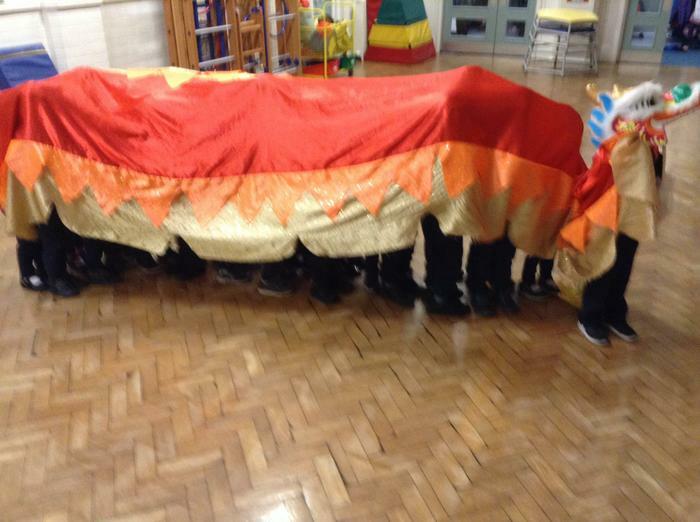 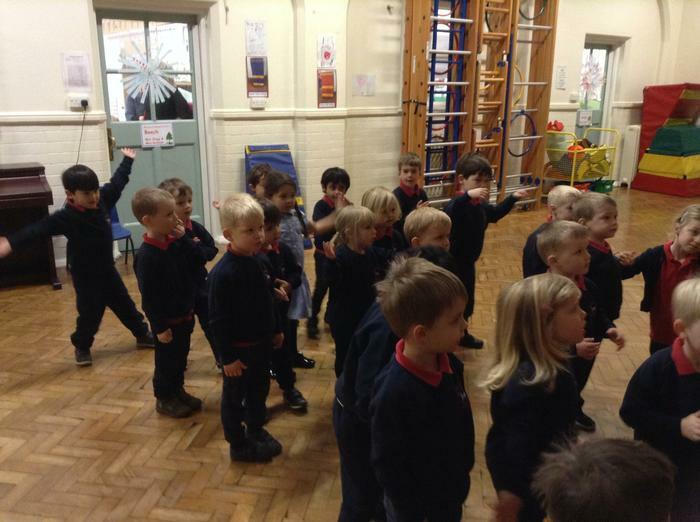 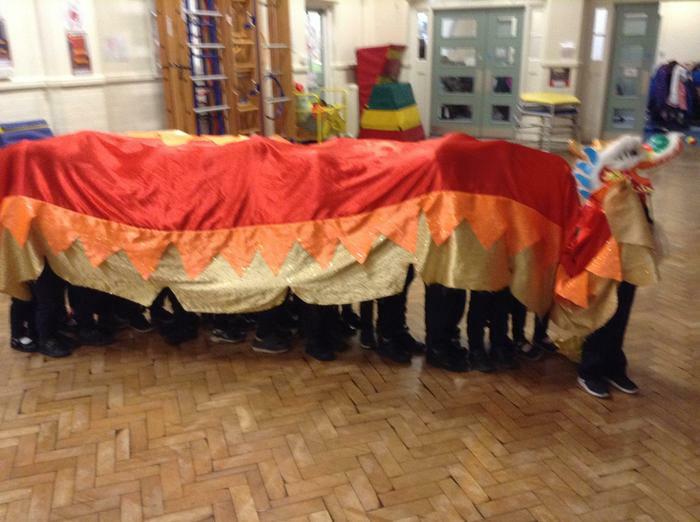 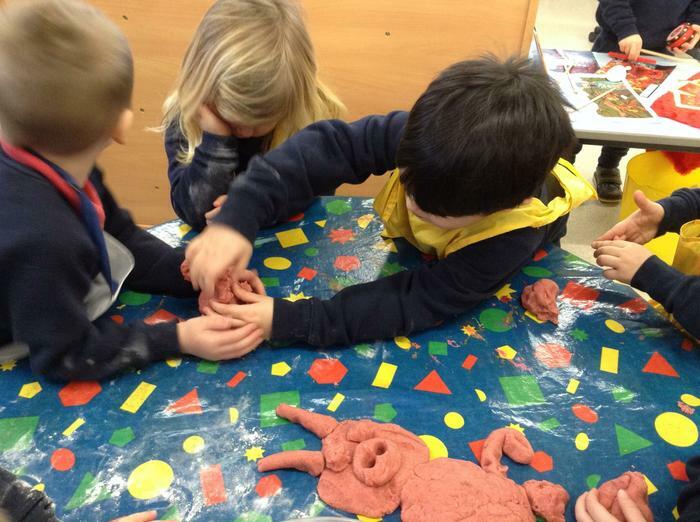 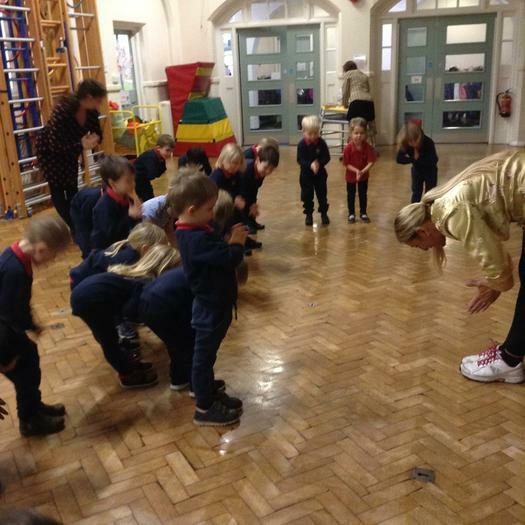 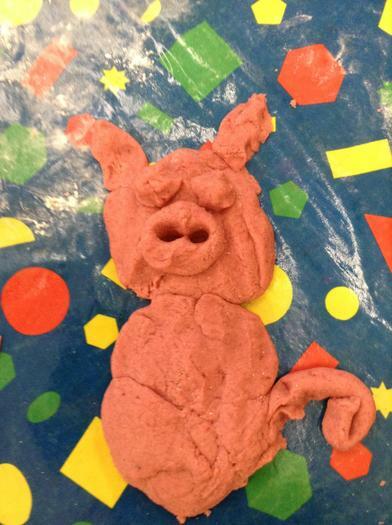 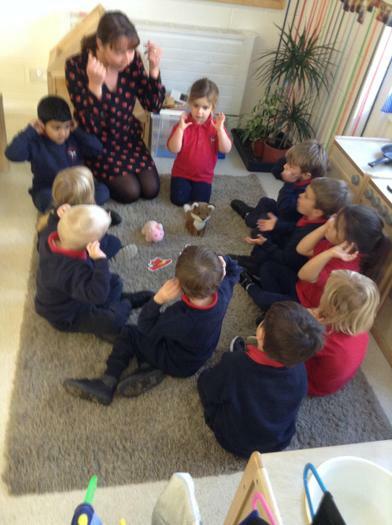 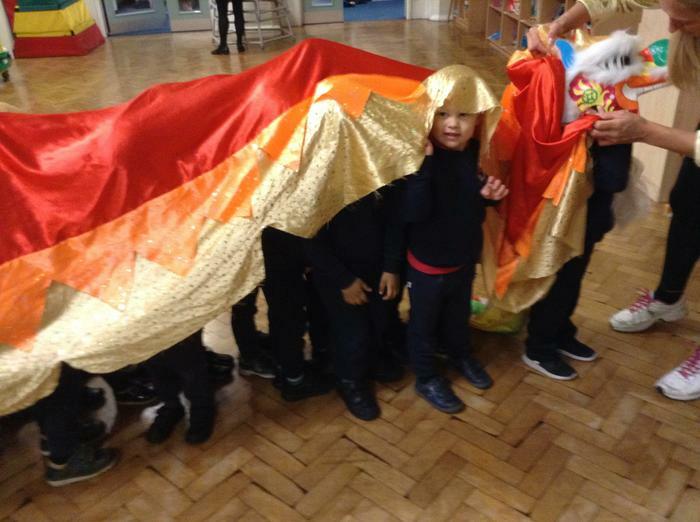 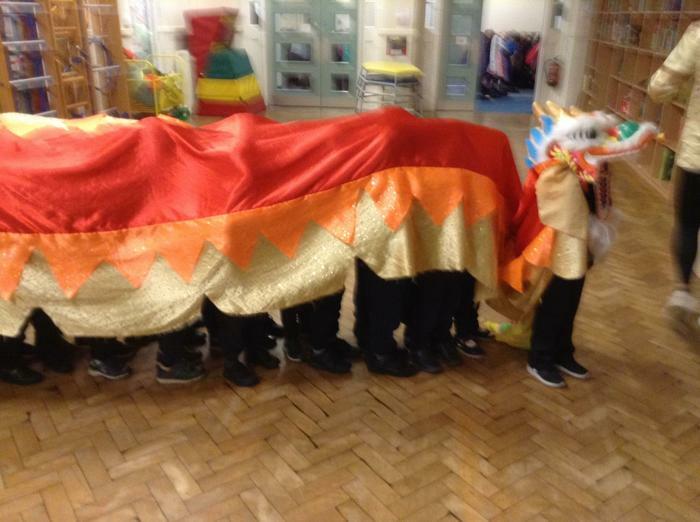 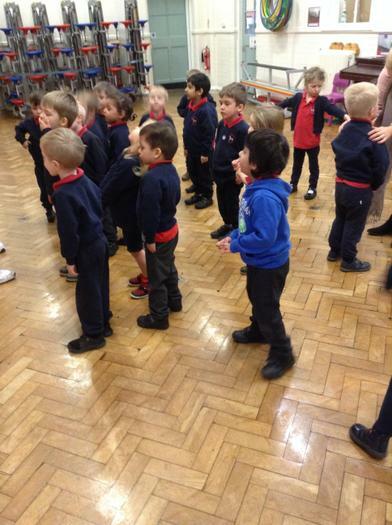 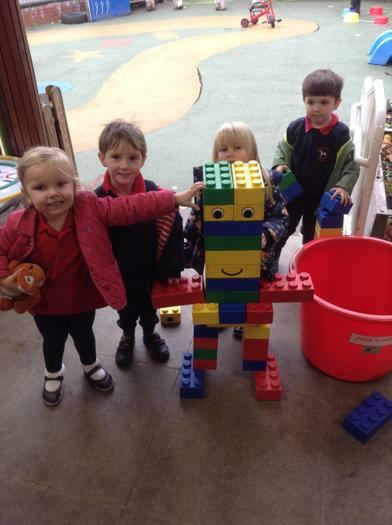 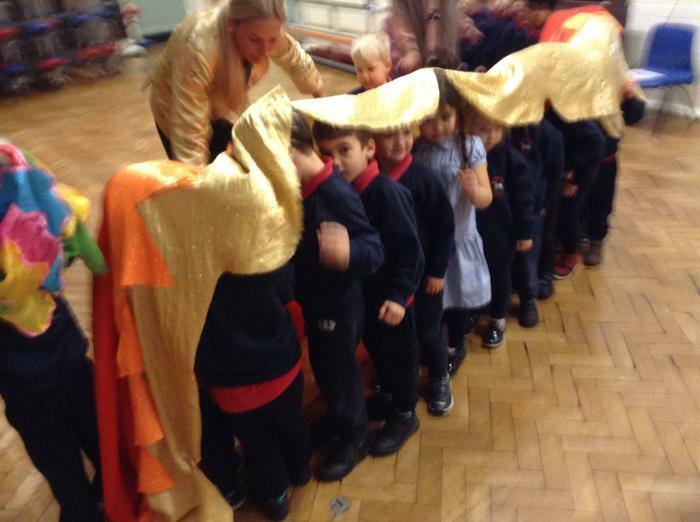 We even pretended to be a fantastic lion by acting as the lion's head and body. 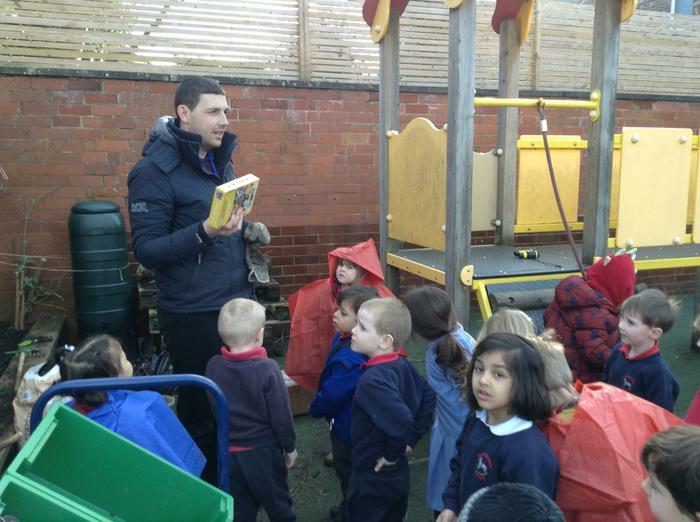 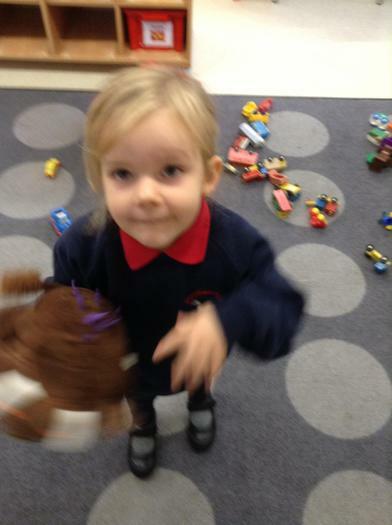 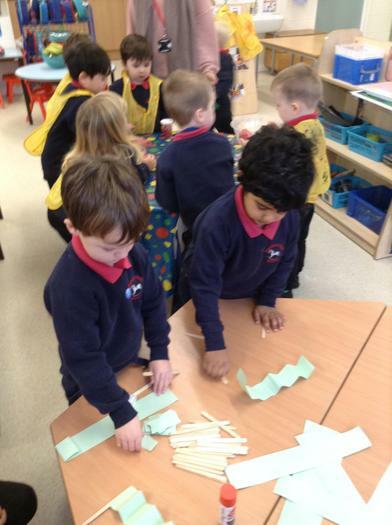 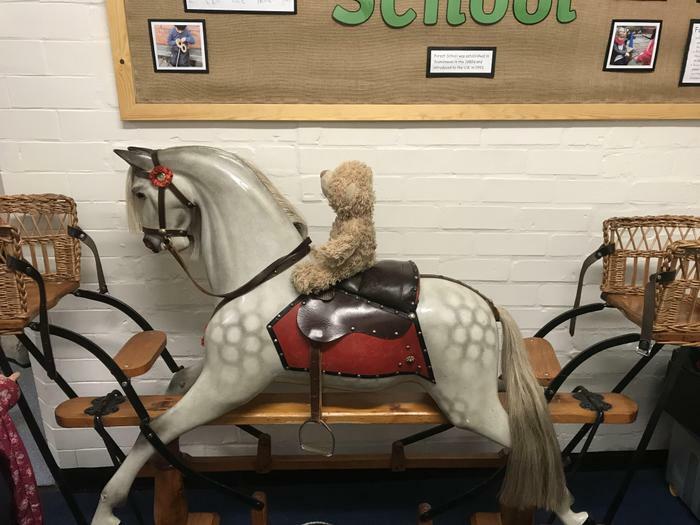 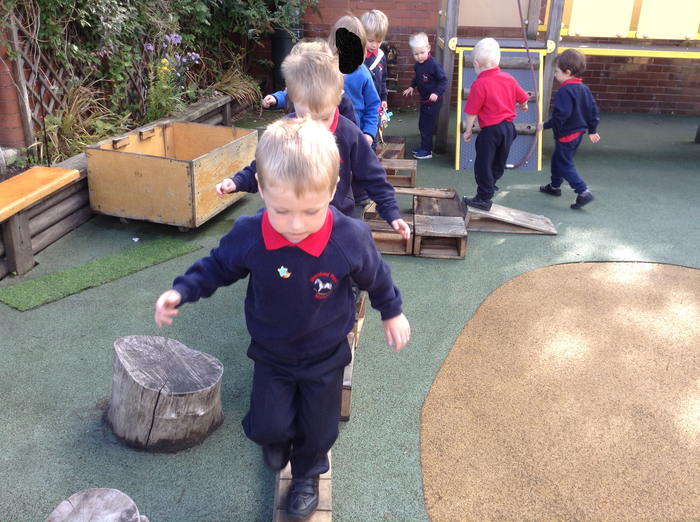 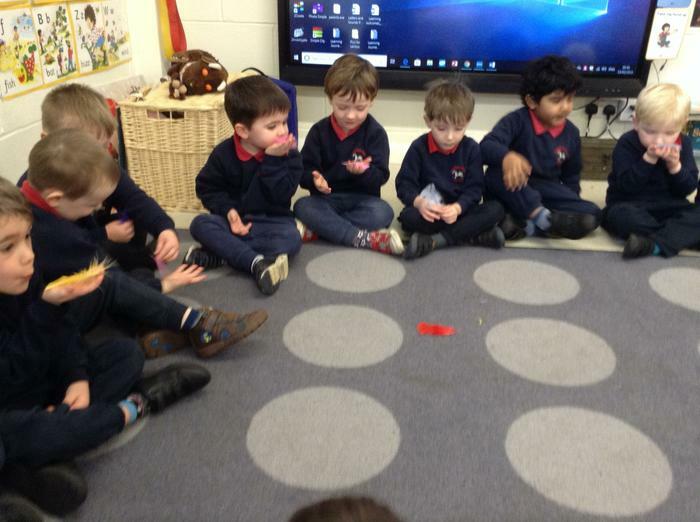 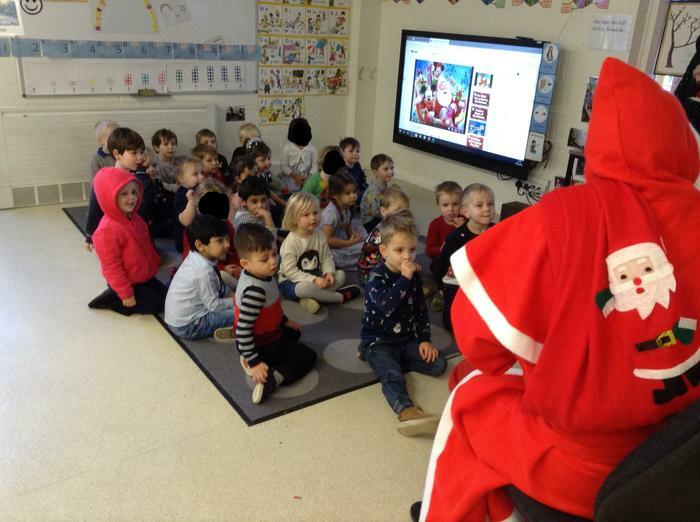 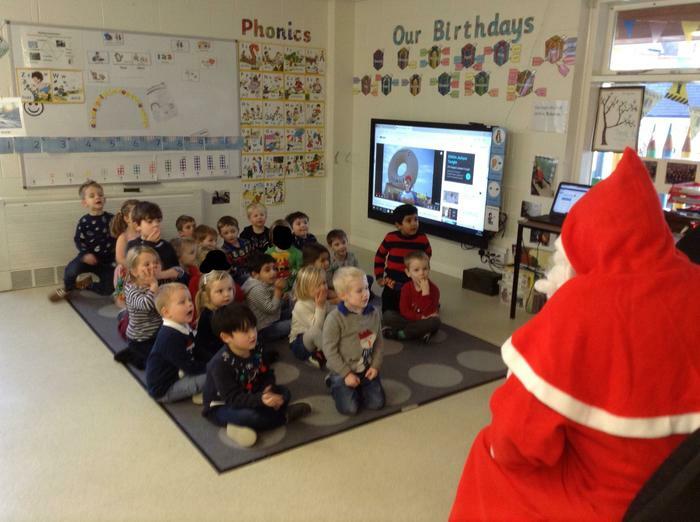 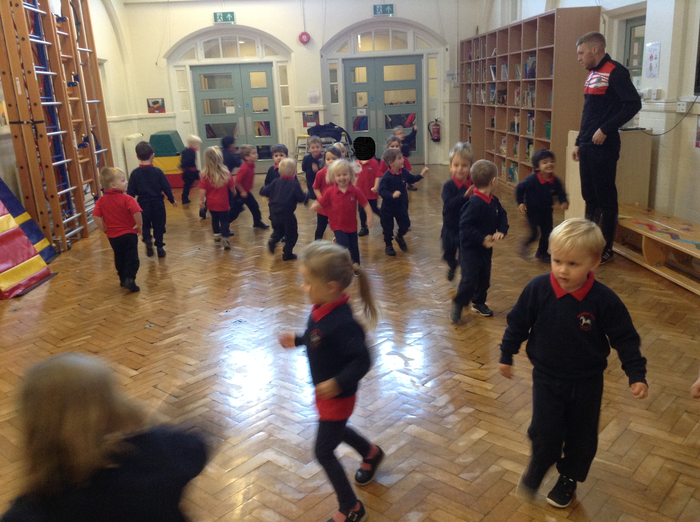 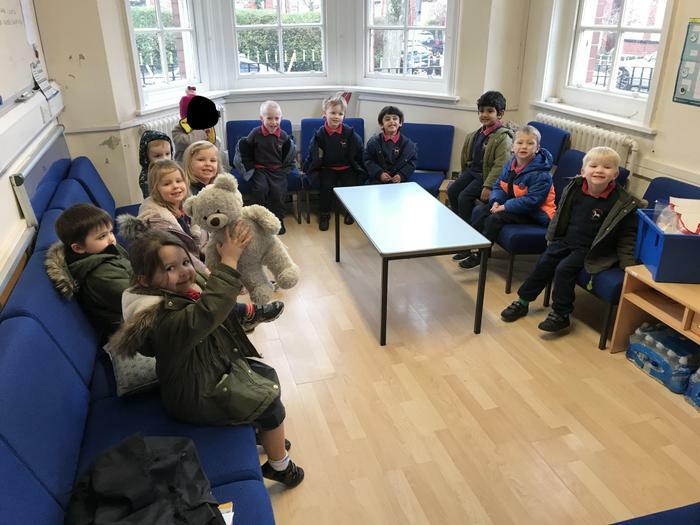 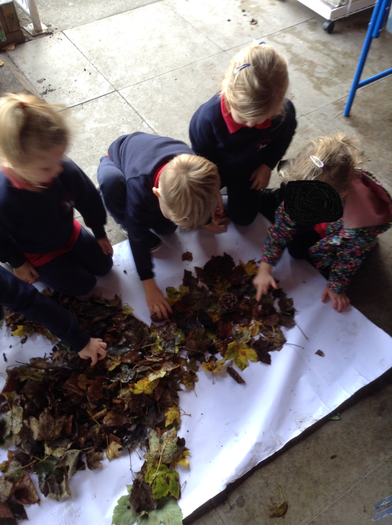 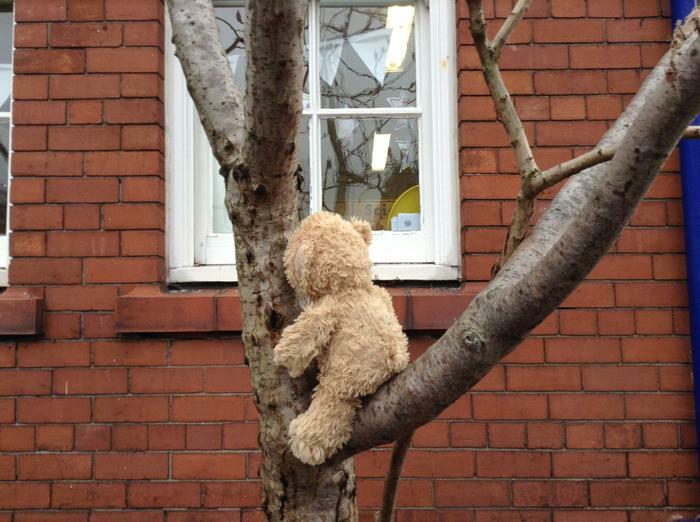 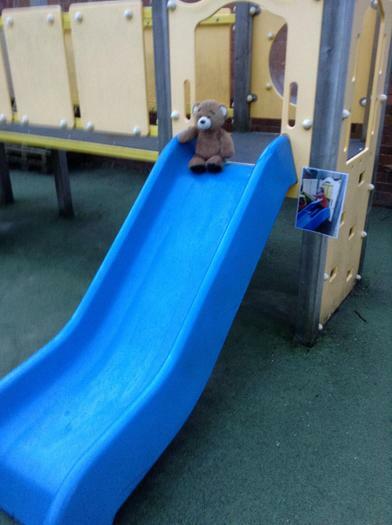 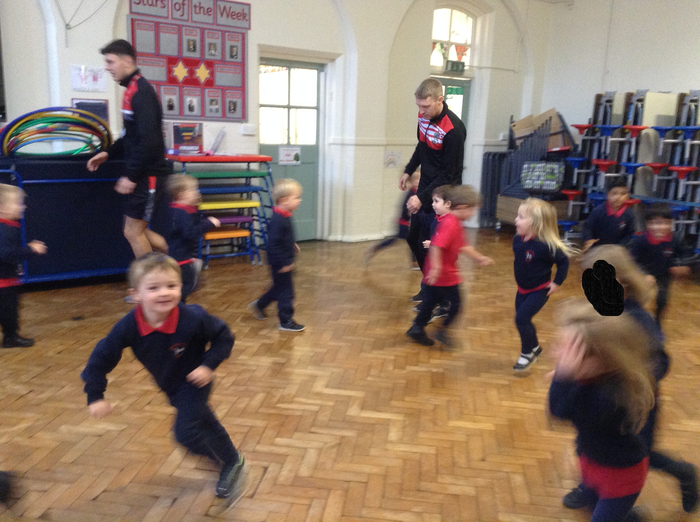 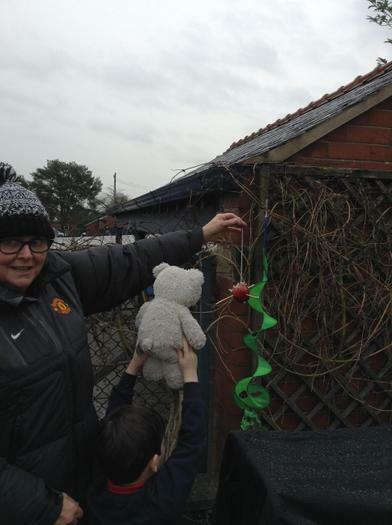 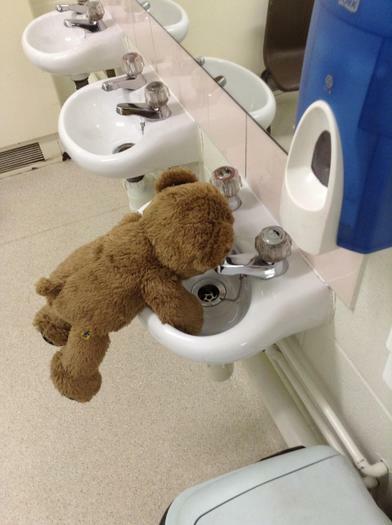 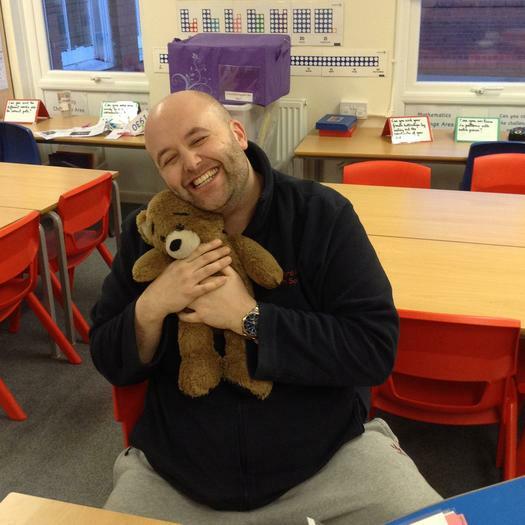 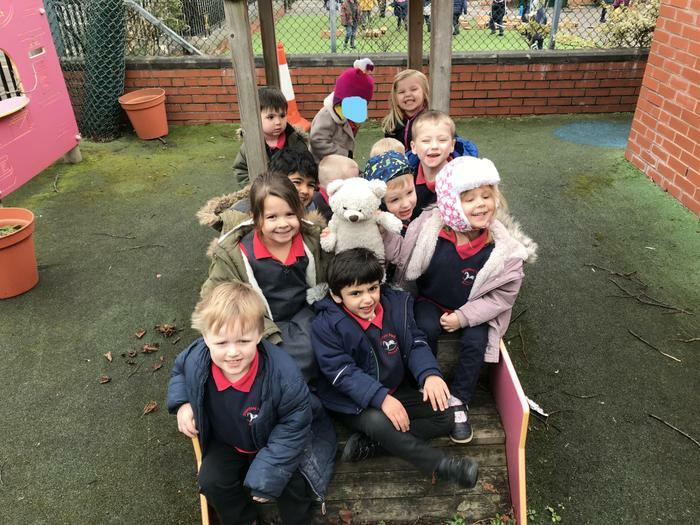 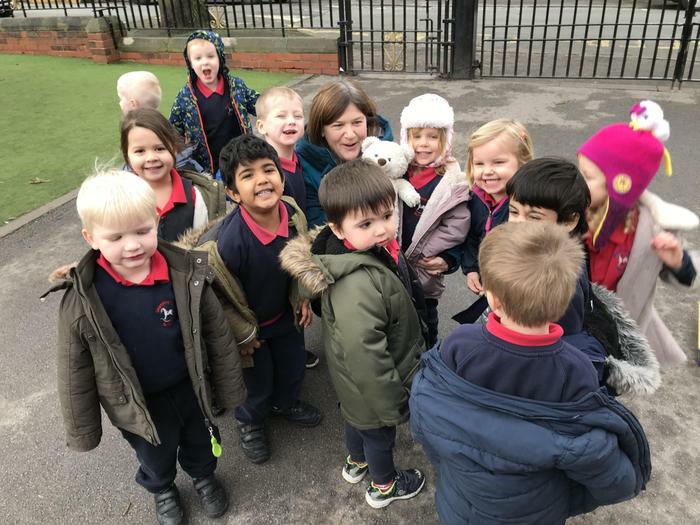 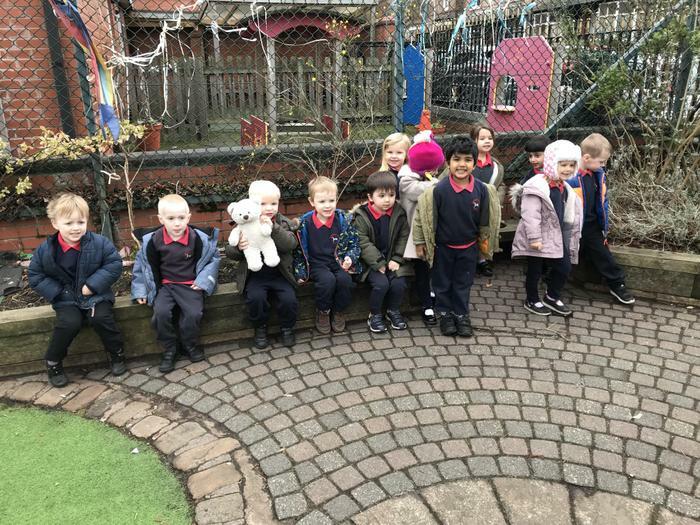 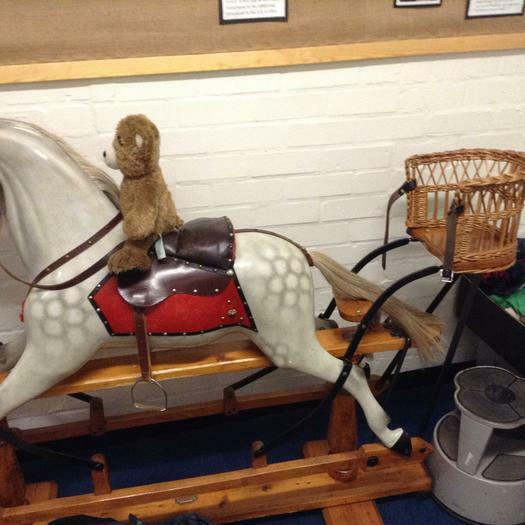 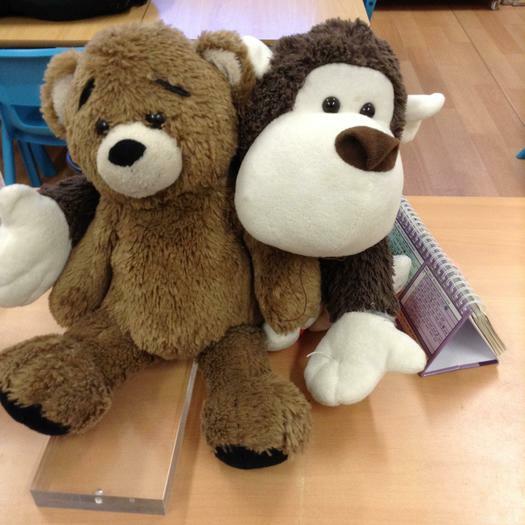 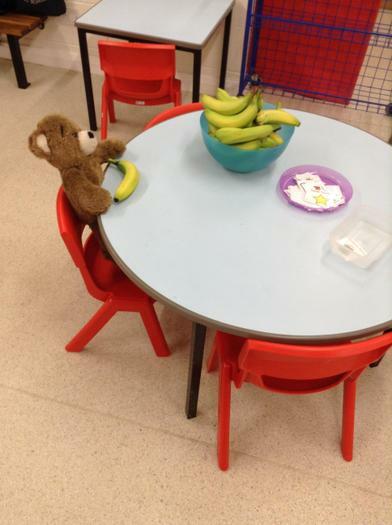 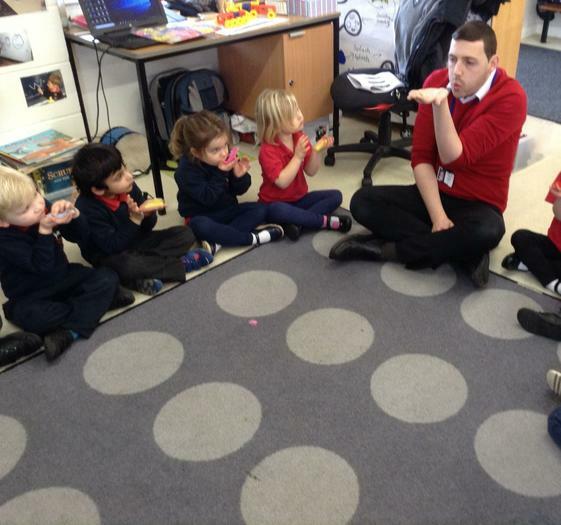 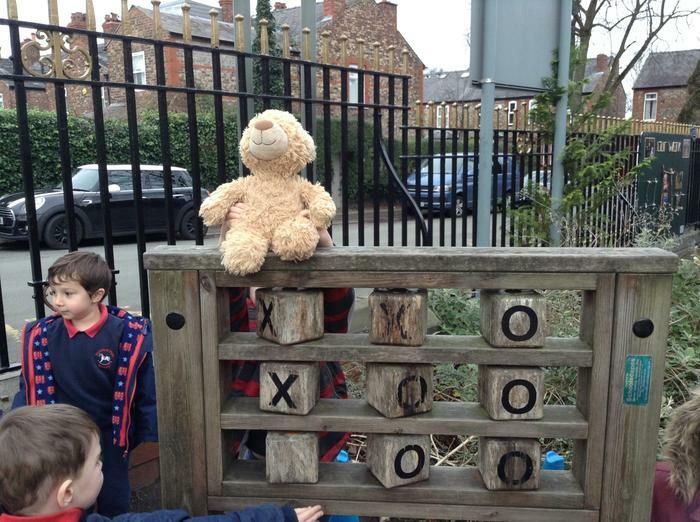 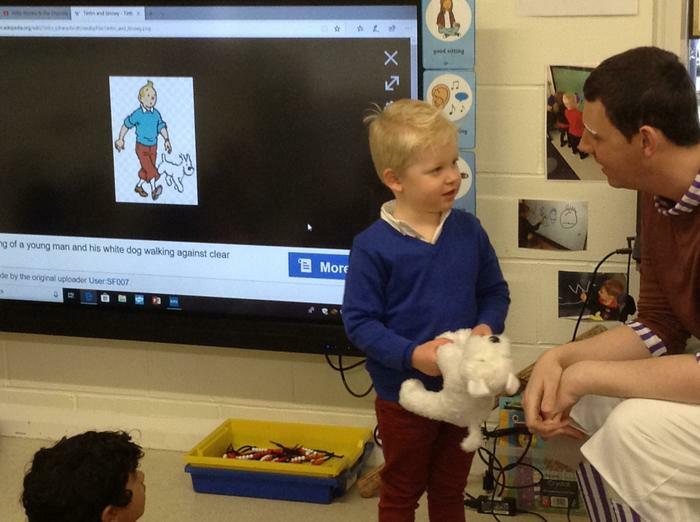 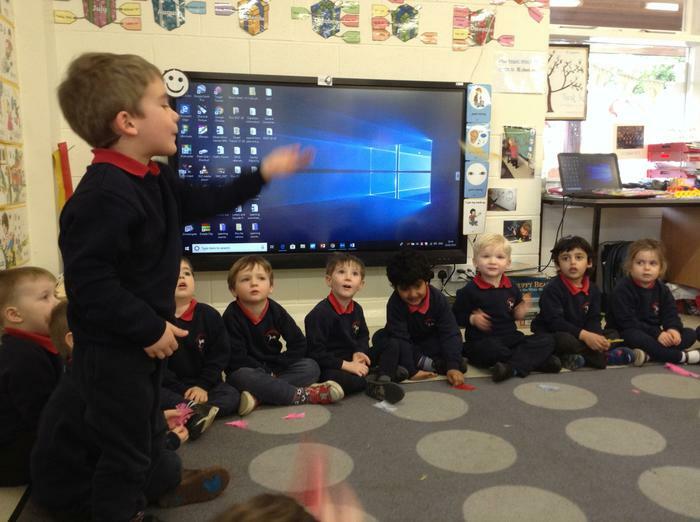 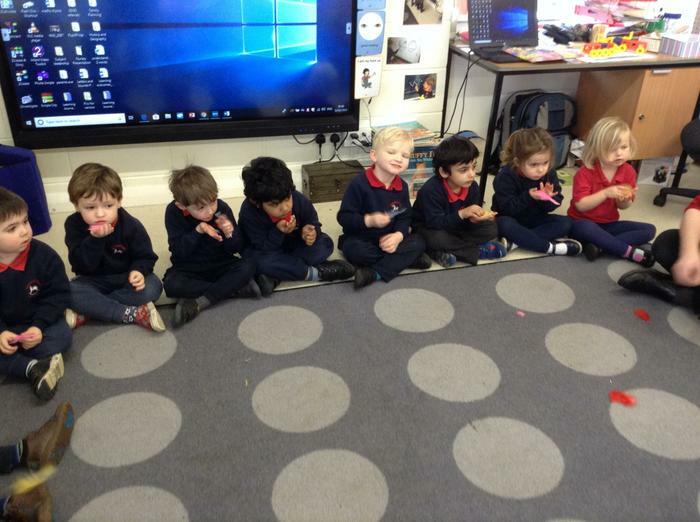 From our focus story, We're Going on a Bear Hunt (Michael Rosen), we decided to take our class bear around school on our own bear journey. 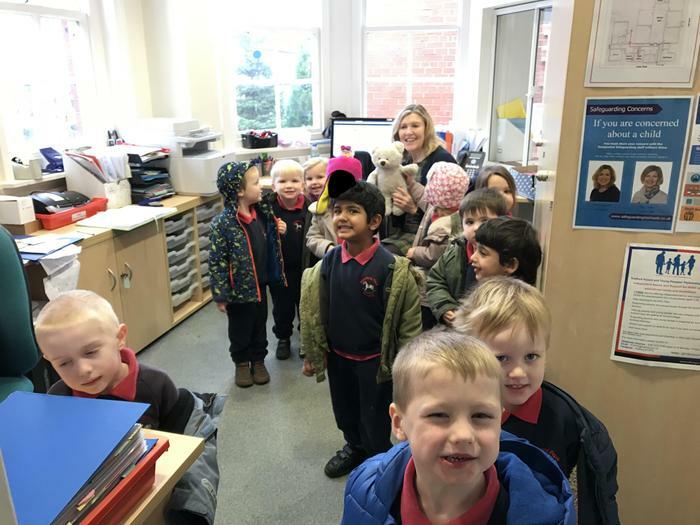 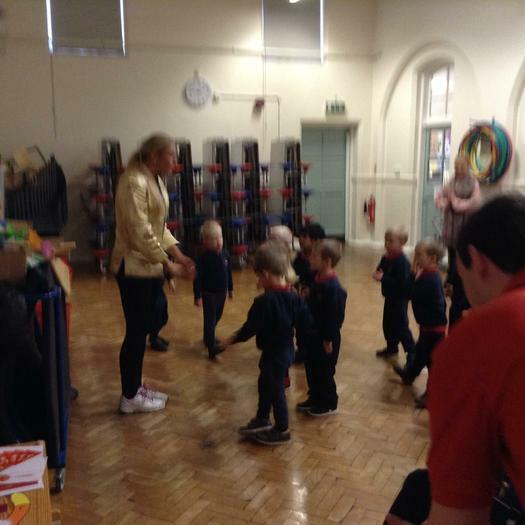 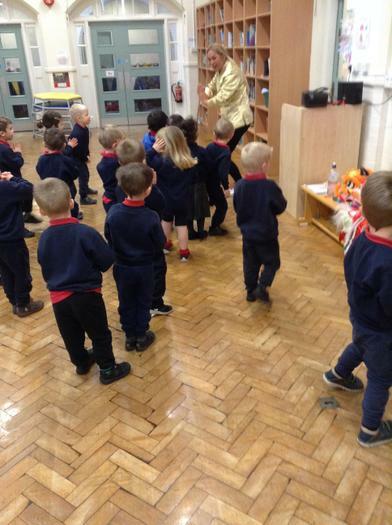 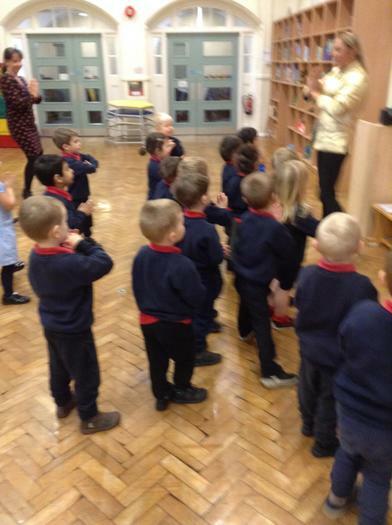 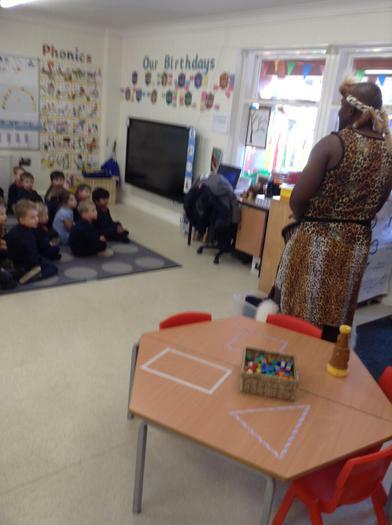 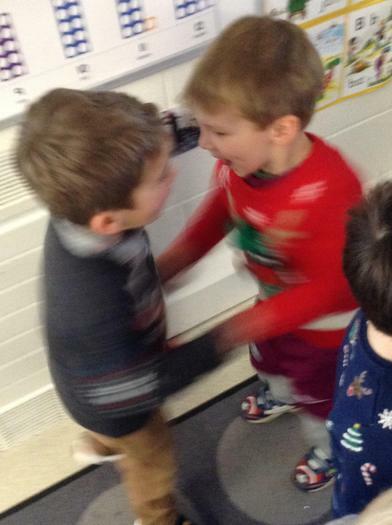 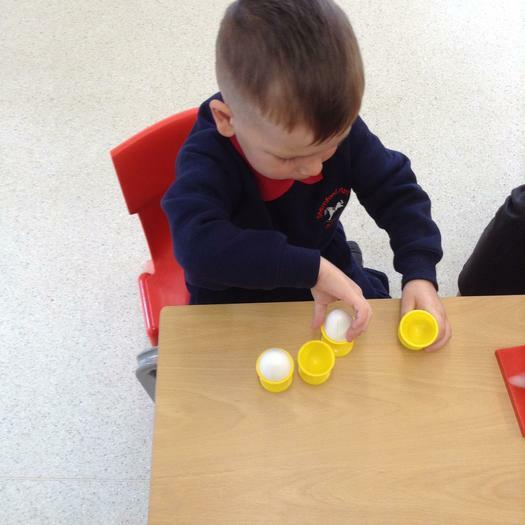 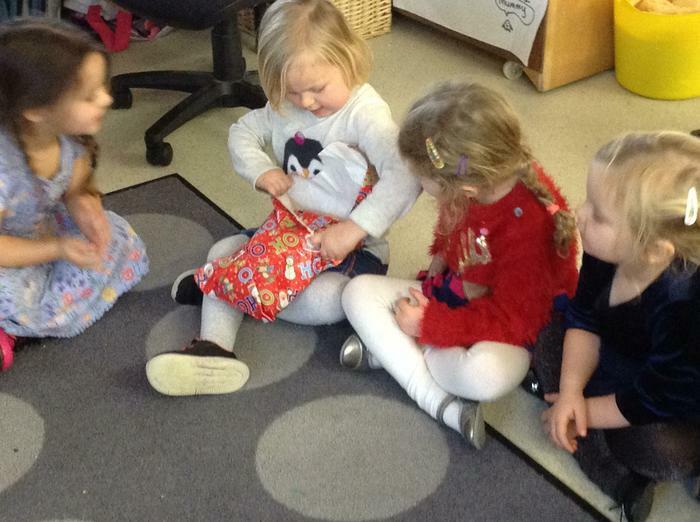 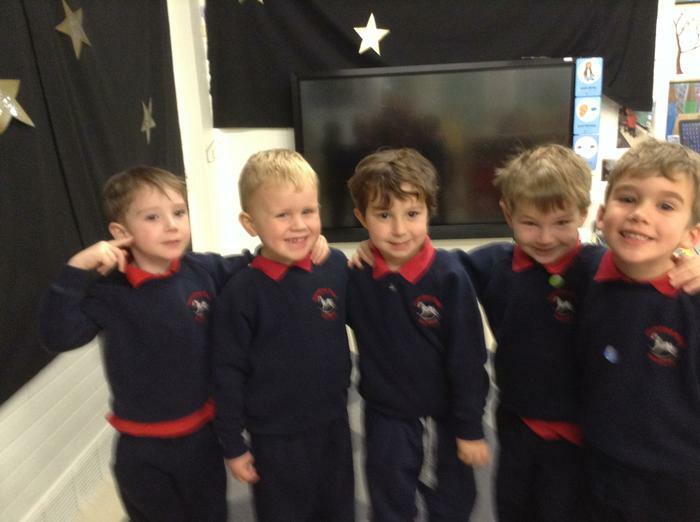 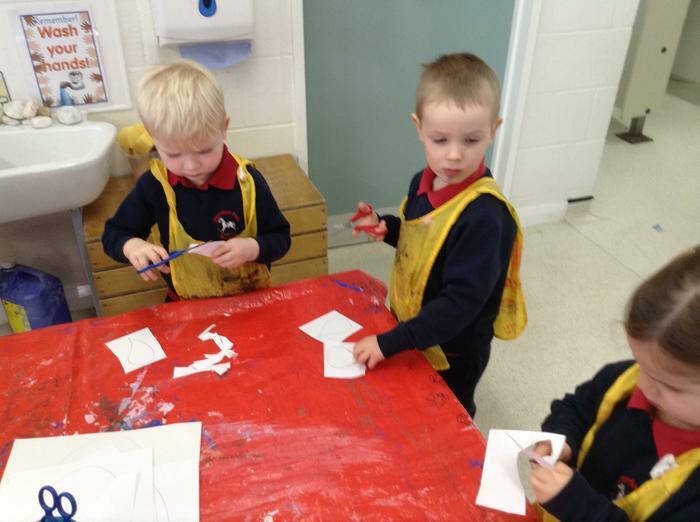 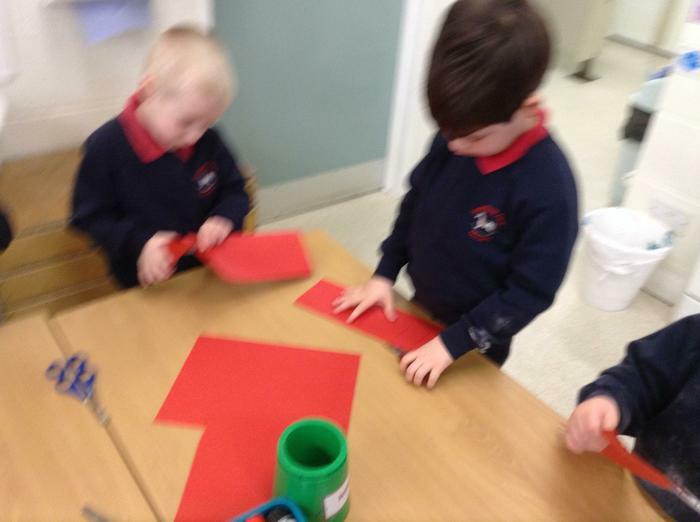 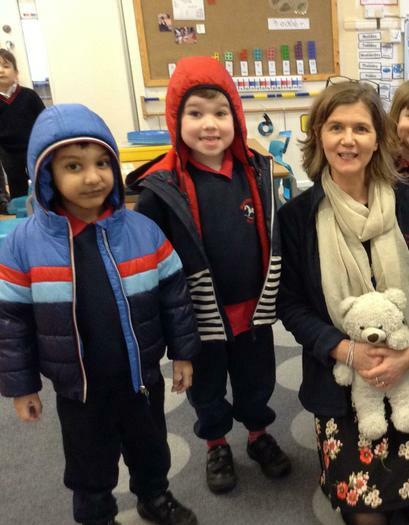 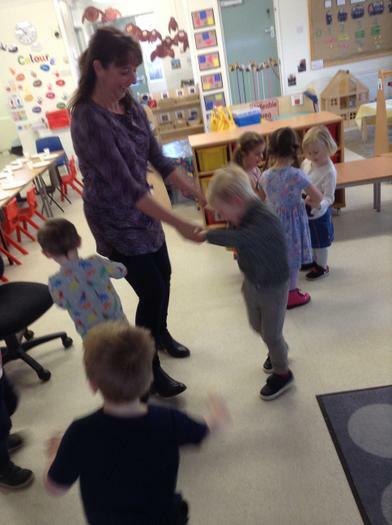 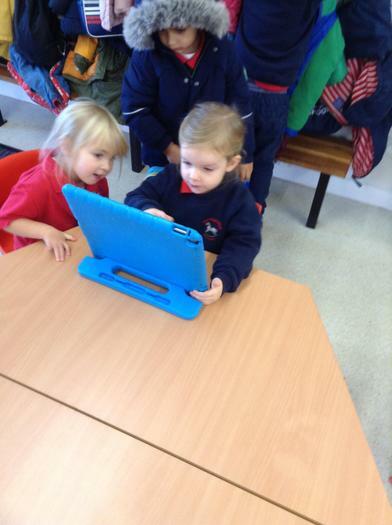 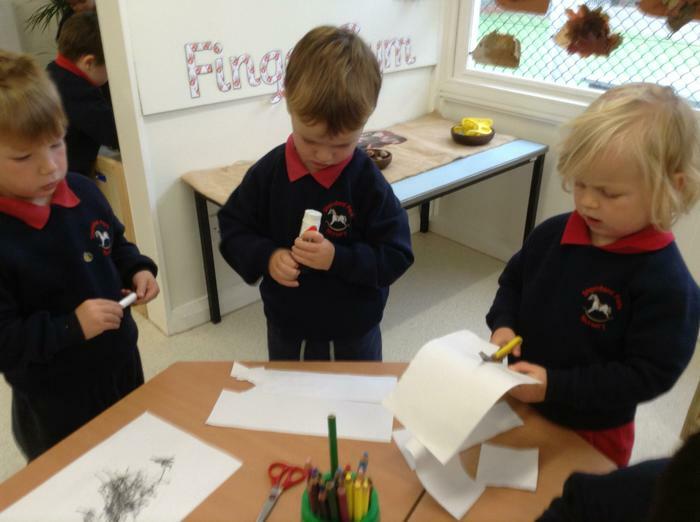 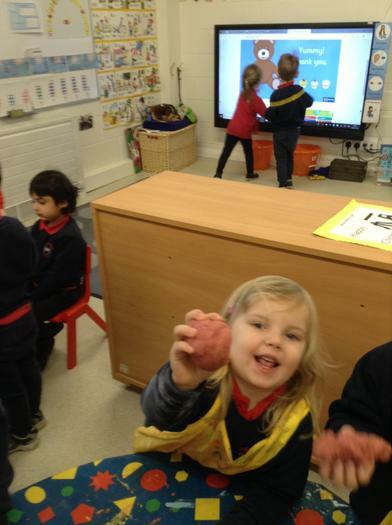 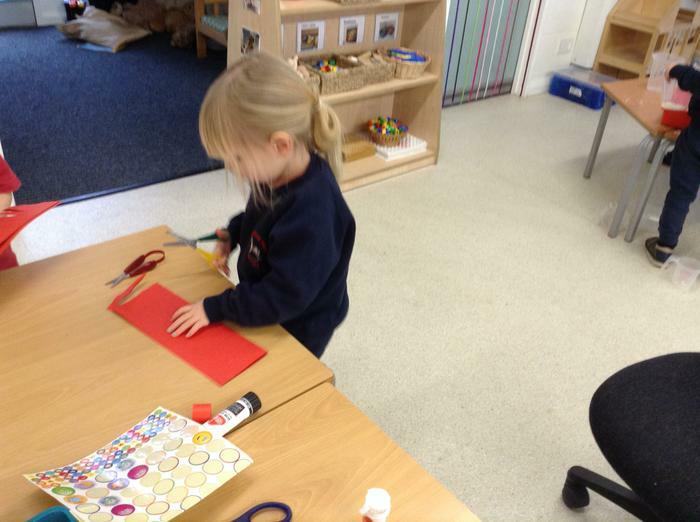 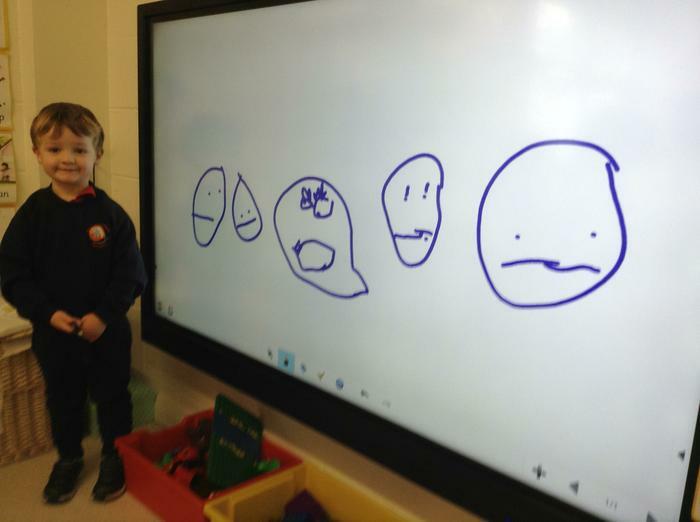 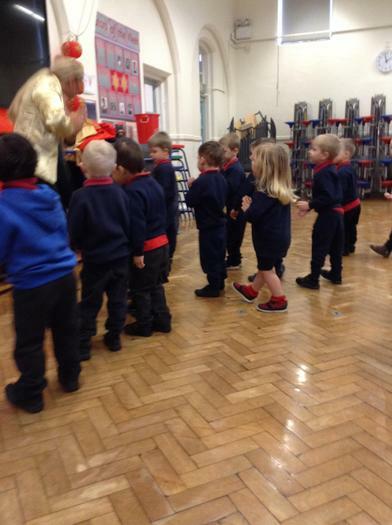 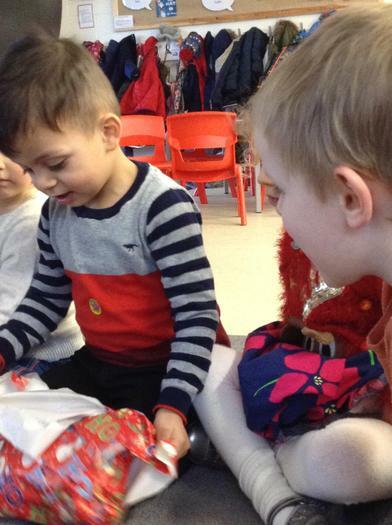 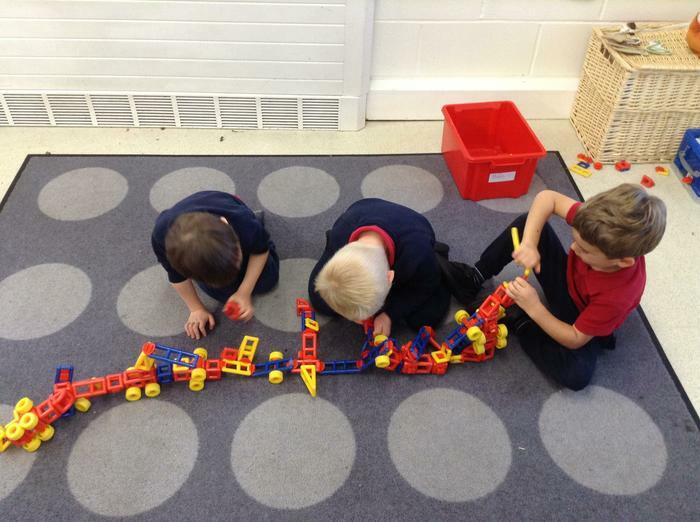 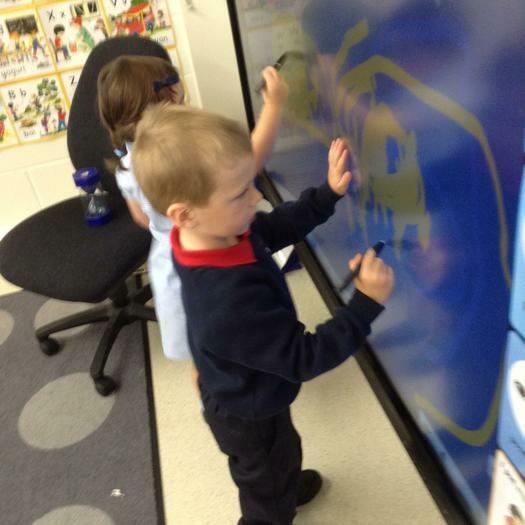 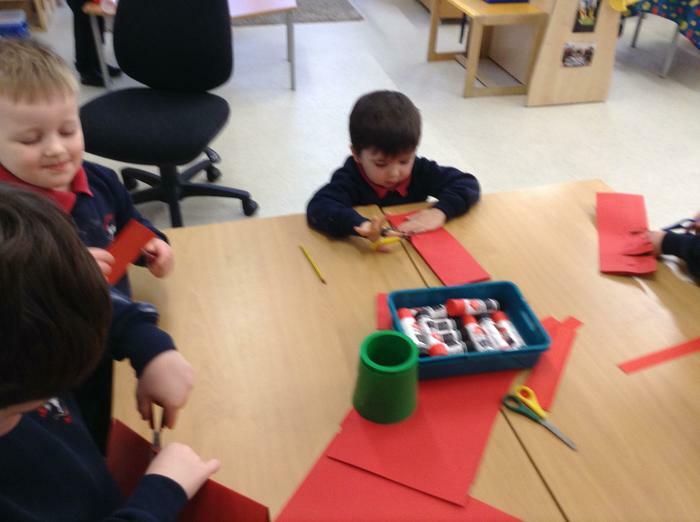 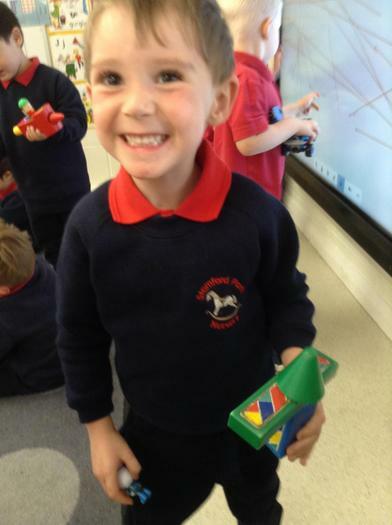 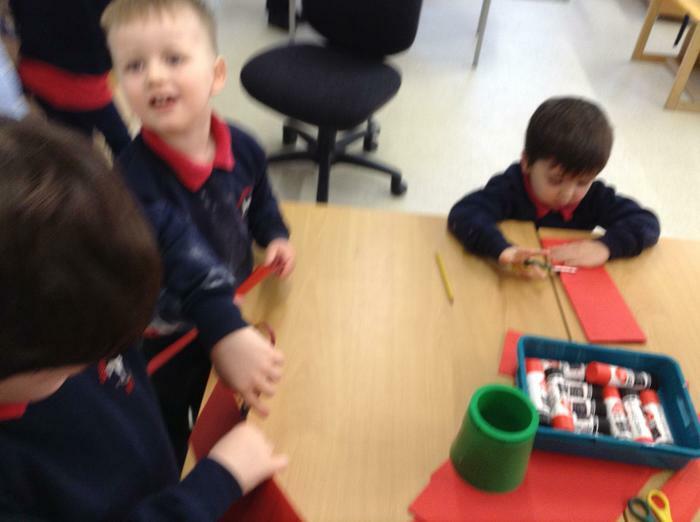 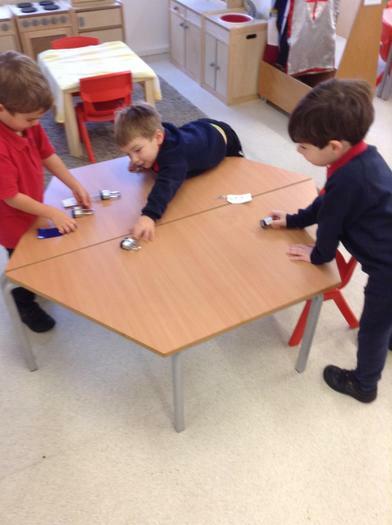 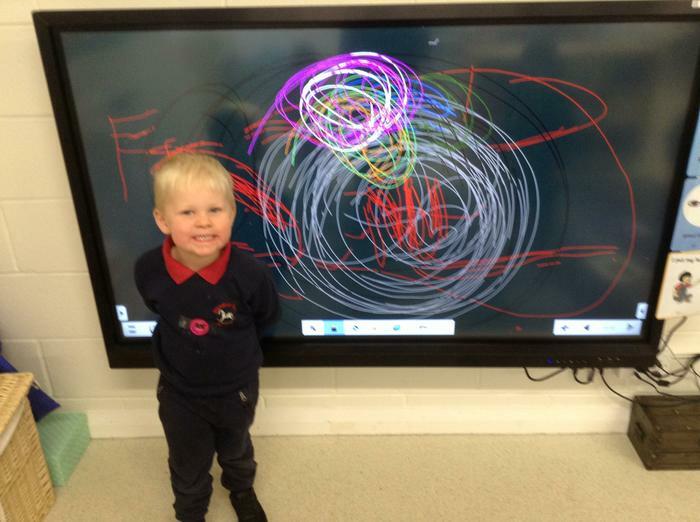 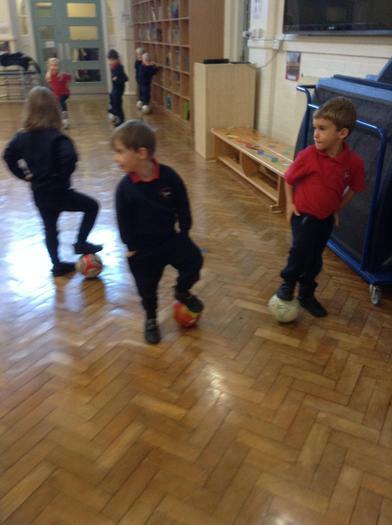 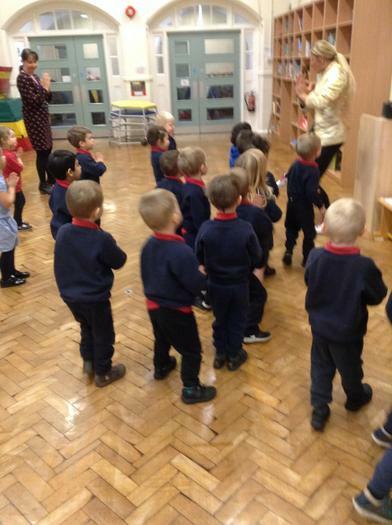 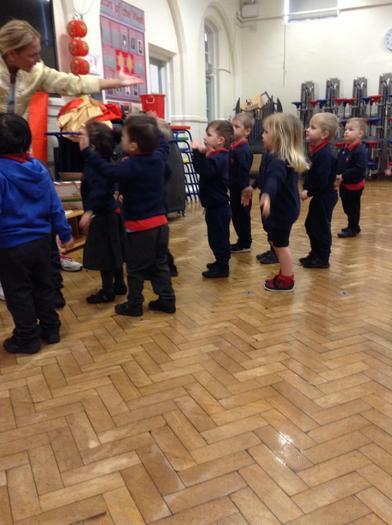 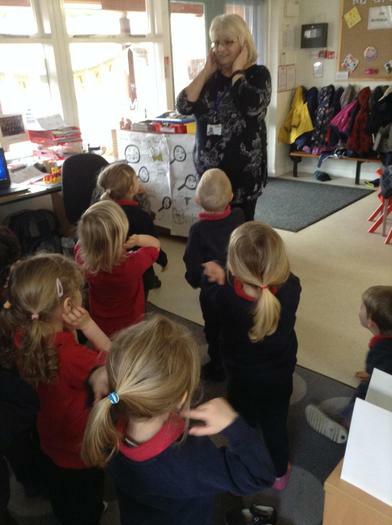 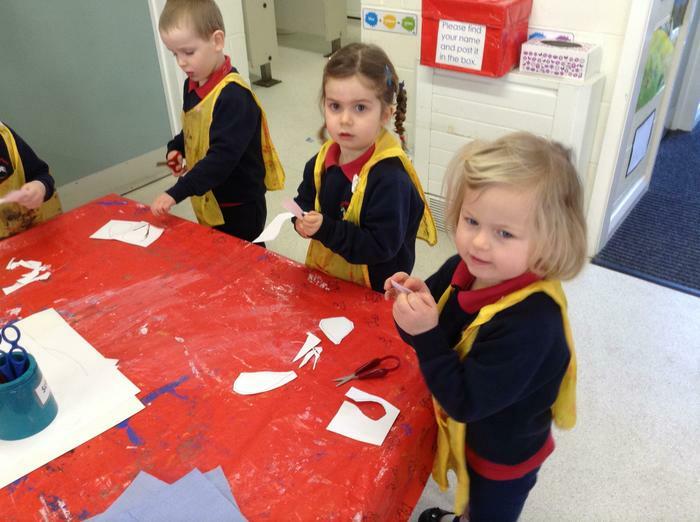 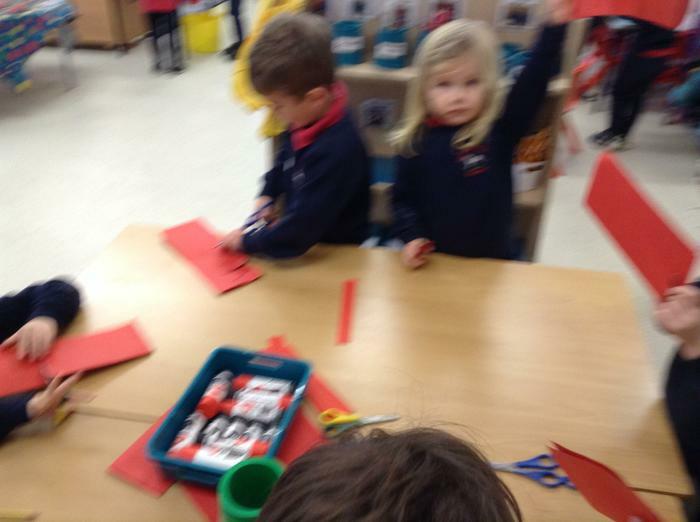 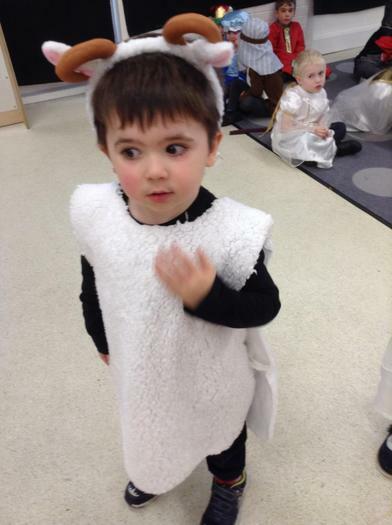 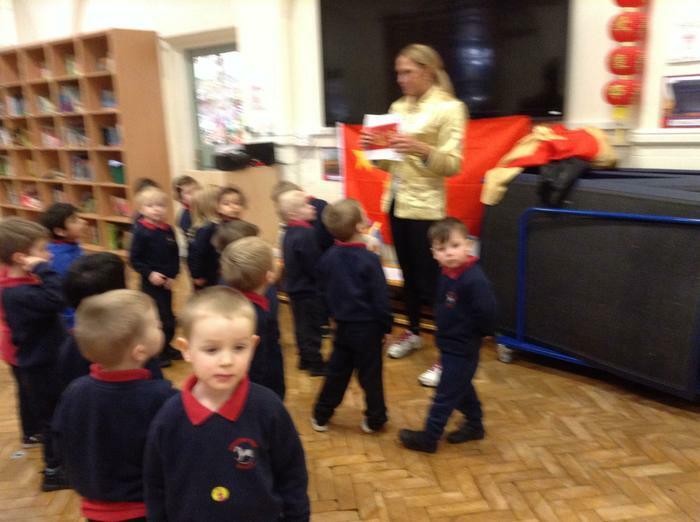 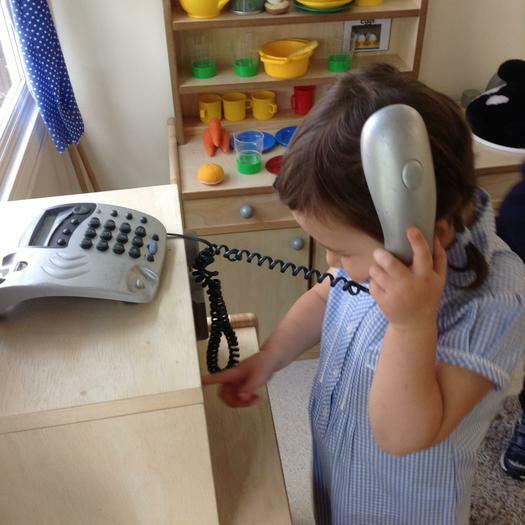 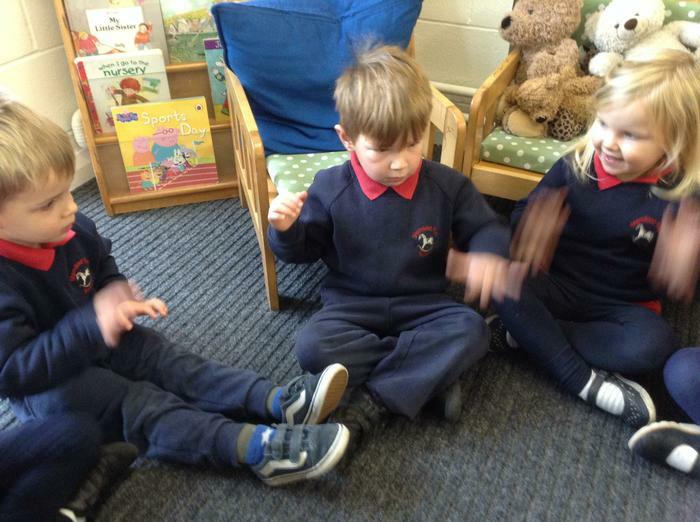 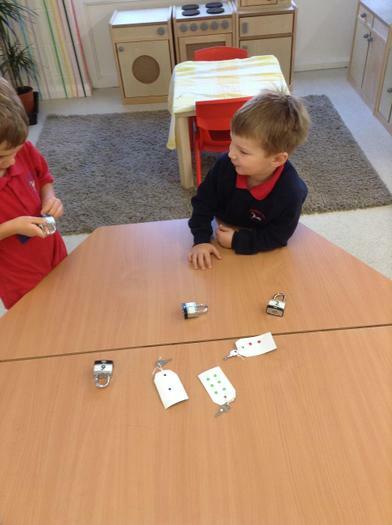 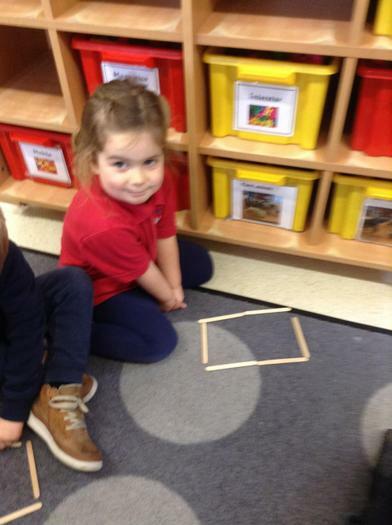 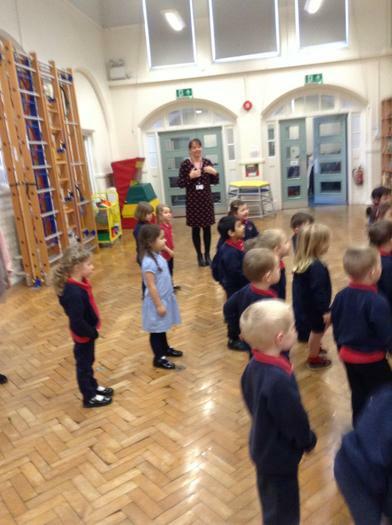 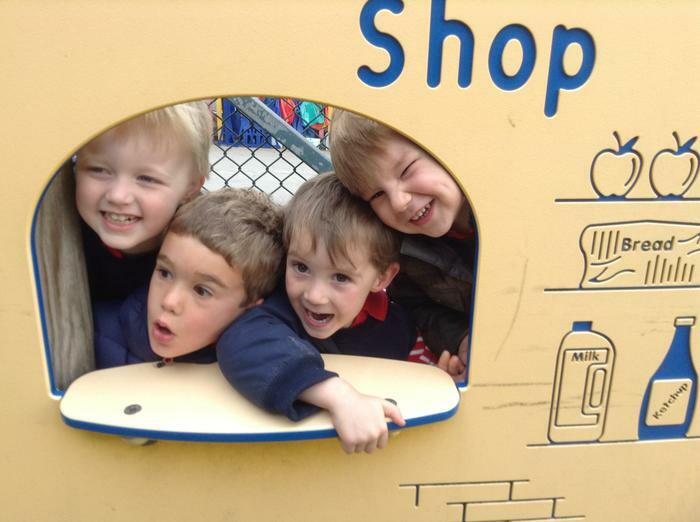 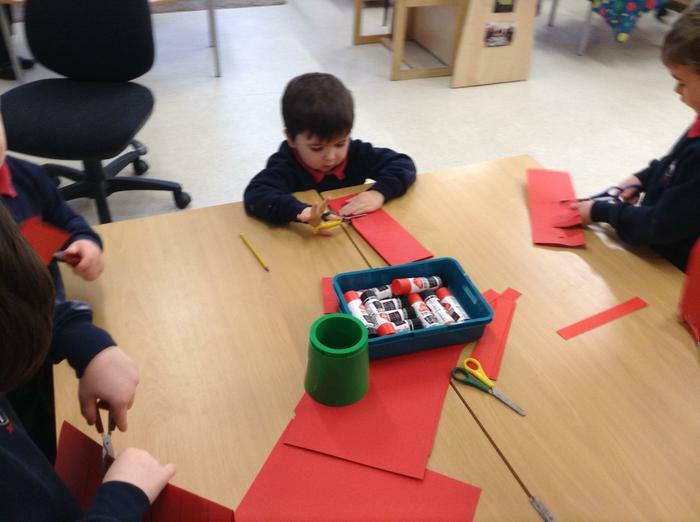 We went into the staffroom, to the nursery train and to see our headteacher, Mrs McDowell. 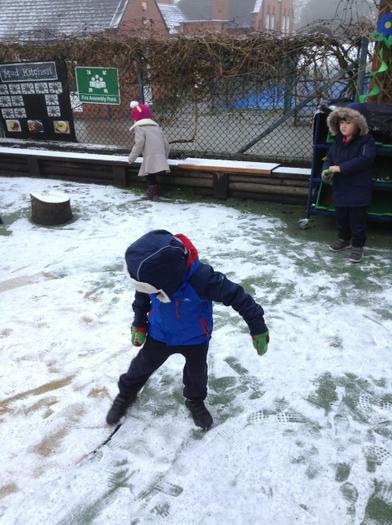 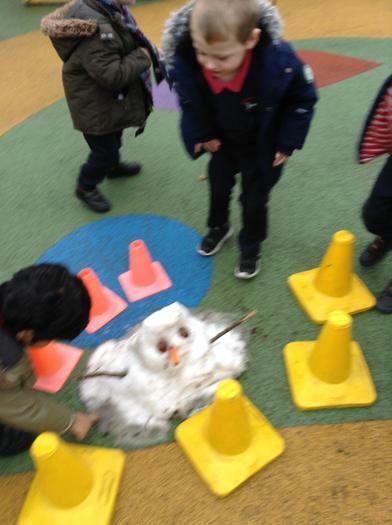 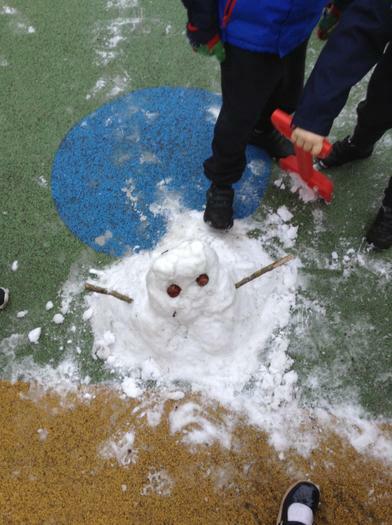 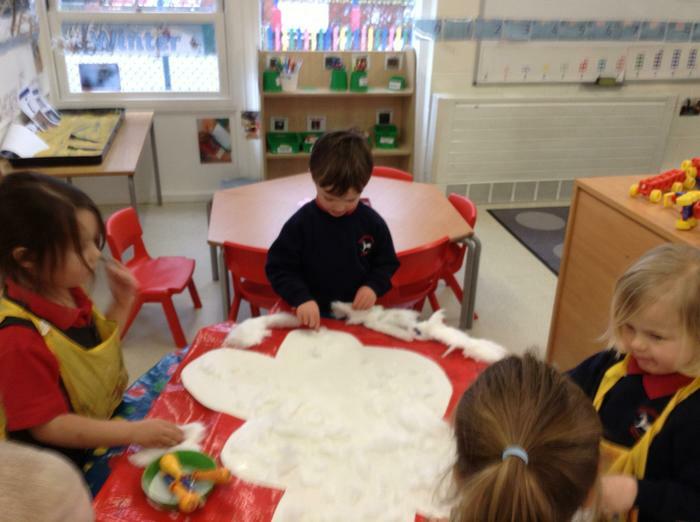 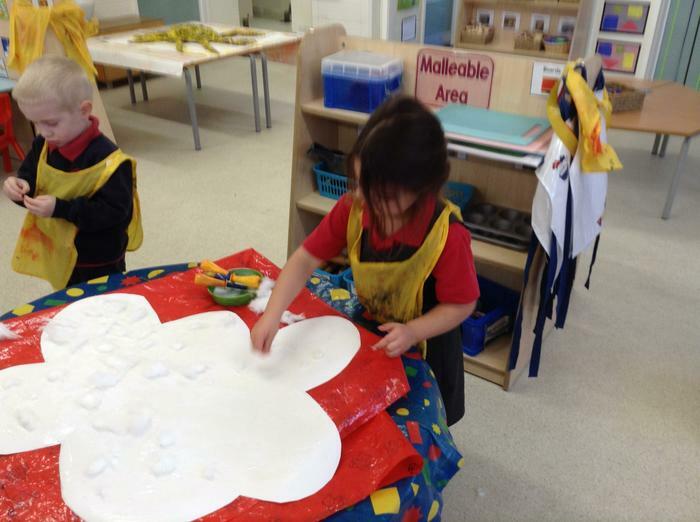 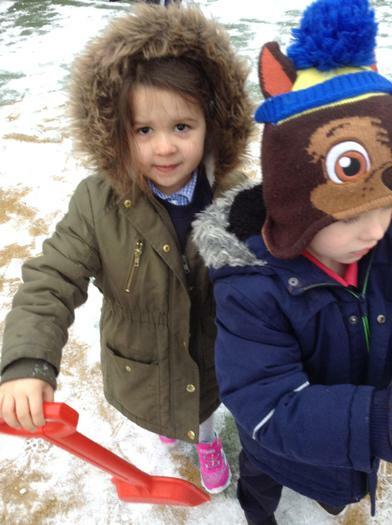 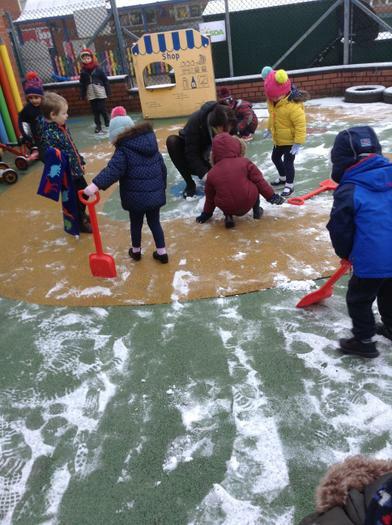 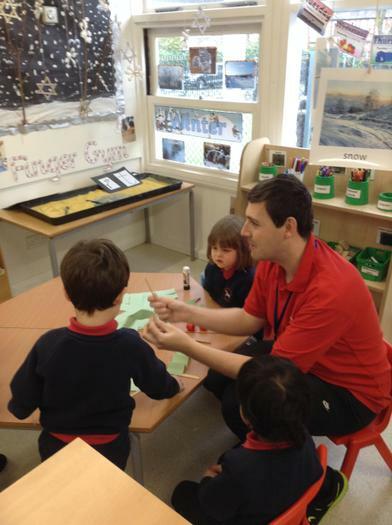 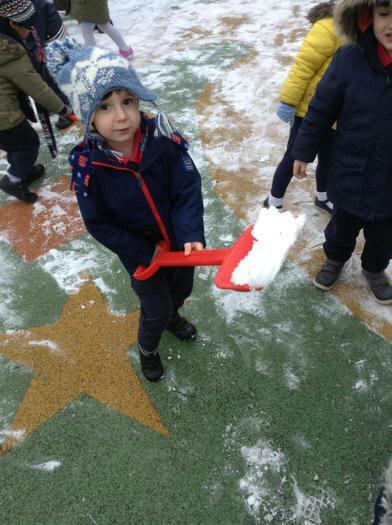 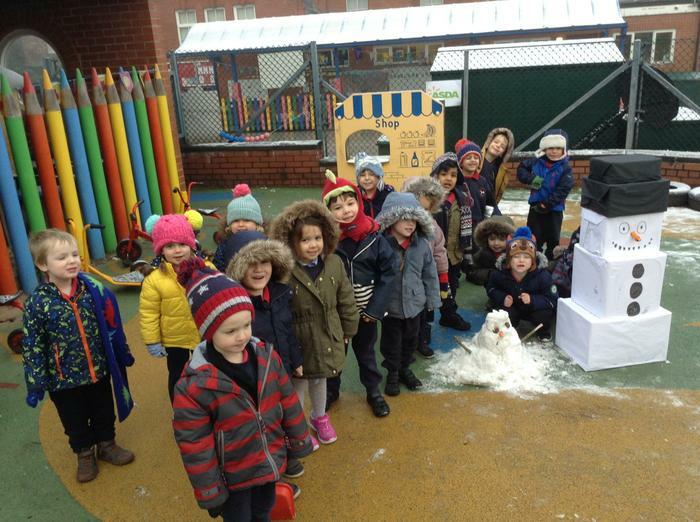 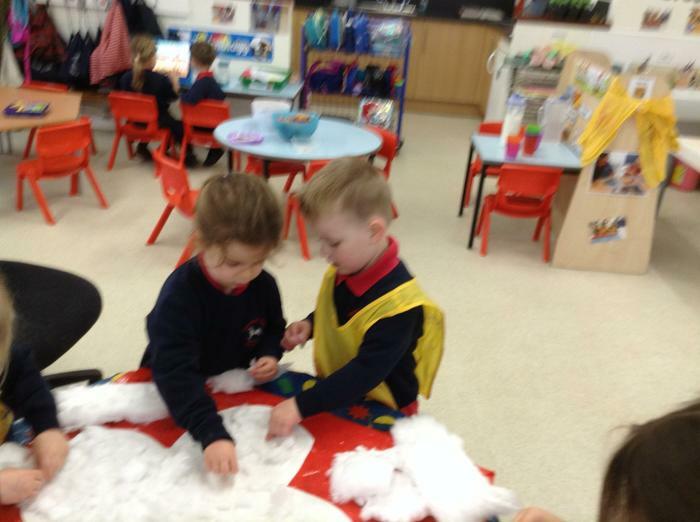 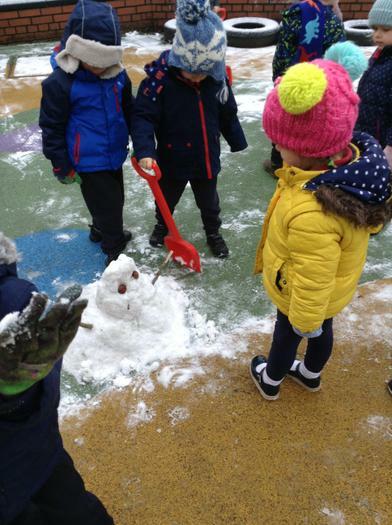 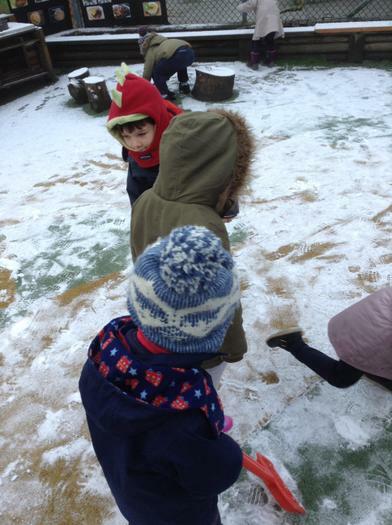 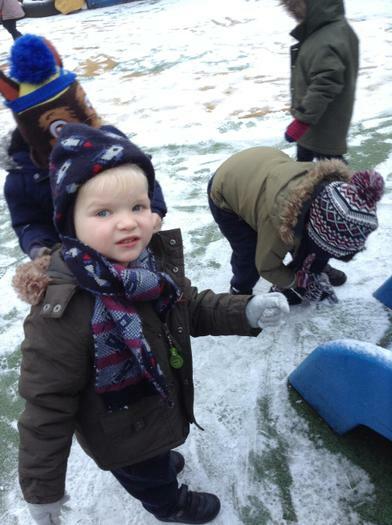 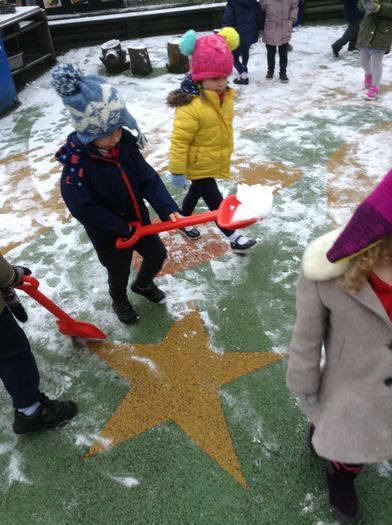 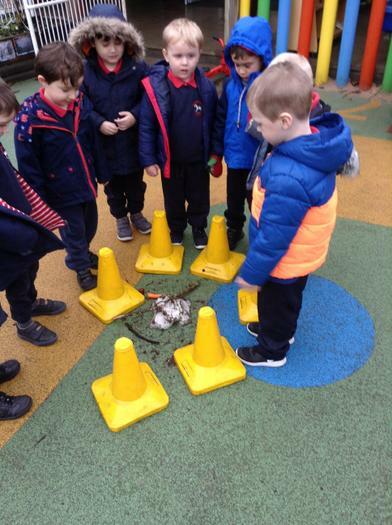 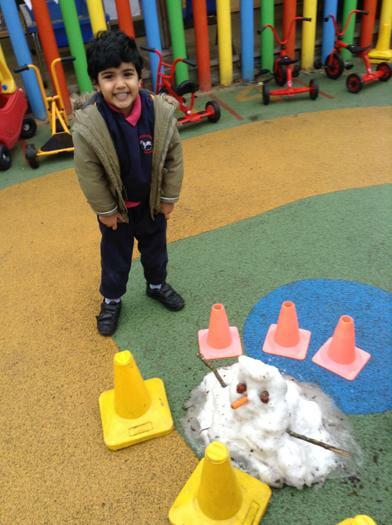 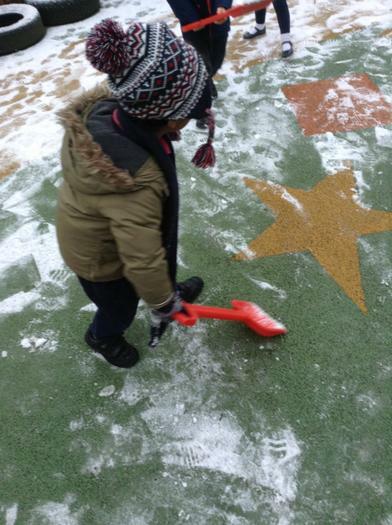 The children had fun playing in the snow and building a snowman. 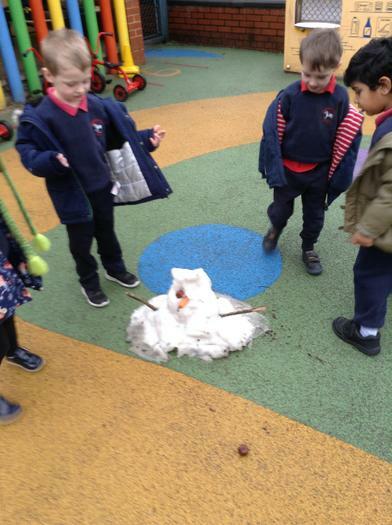 We watched It melt over a few days until there were only some buttons, a carrot and some sticks left.